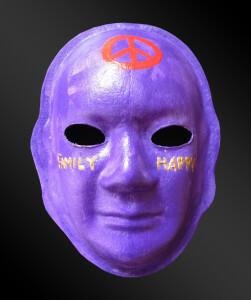 Explanation of Mask: Joy, no worries, being happy. 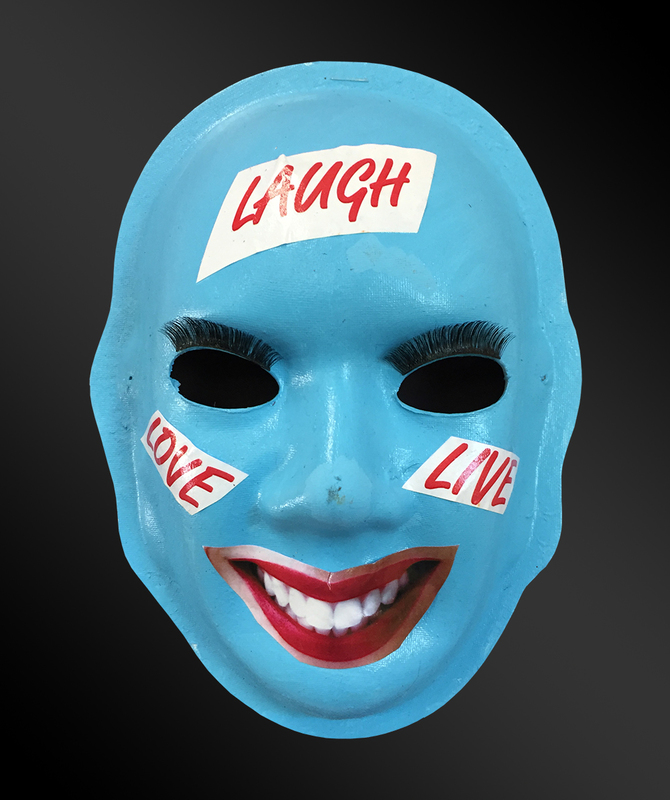 Carolina blue for my favorite color, and lashes to represent my “girly” personality. Explanation of Mask: Painting was one of my passions before my brain injury. I enjoy waterskiing, sky diving and going to eat at Hooters. My favorite team is the Tennessee Volunteers! 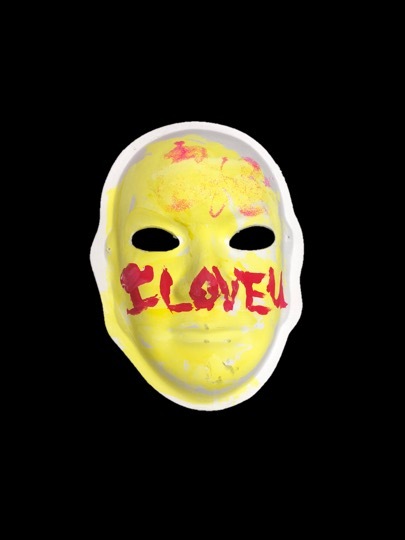 Explanation of Mask: I feel like I’m forever internally crying and heartbroken. I feel like I’m told I’m always wrong because people don’t understand what a brain injury does to someone. 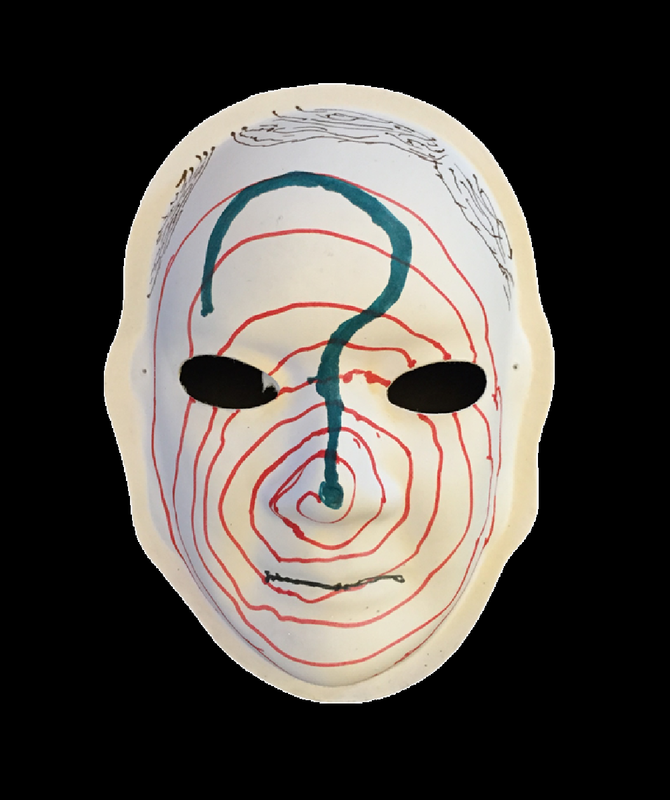 Explanation of Mask: I have a two-sided mask because I used to have seizures from viral encephalitis that made me feel confused and lost in a maze. Now the seizures are gone and my mom said that the first thing I said when my vision came back was, “Look at the pretty flower”. 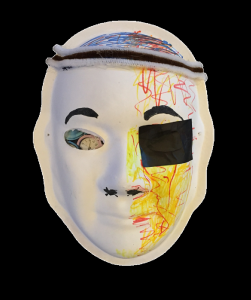 Explanation of Mask: Patch over my eye because my vision is impaired. Fork in the road for feeling lost, abandoned and uncertain; I am not going down the path I wanted for my life, but I am still grateful for being here. Smile to remind people to never give up! Explanation of Mask: The forehead represents how my memories sink like quicksand. Yellow for happy feelings, grey for sadness related to changes following my injury, and green because that is the color I connect with when I’m outdoors. Explanation of Mask: I feel on top of the world, grateful for everything; feel alive! Serpentine rock because it’s the official state rock of my home state of California. 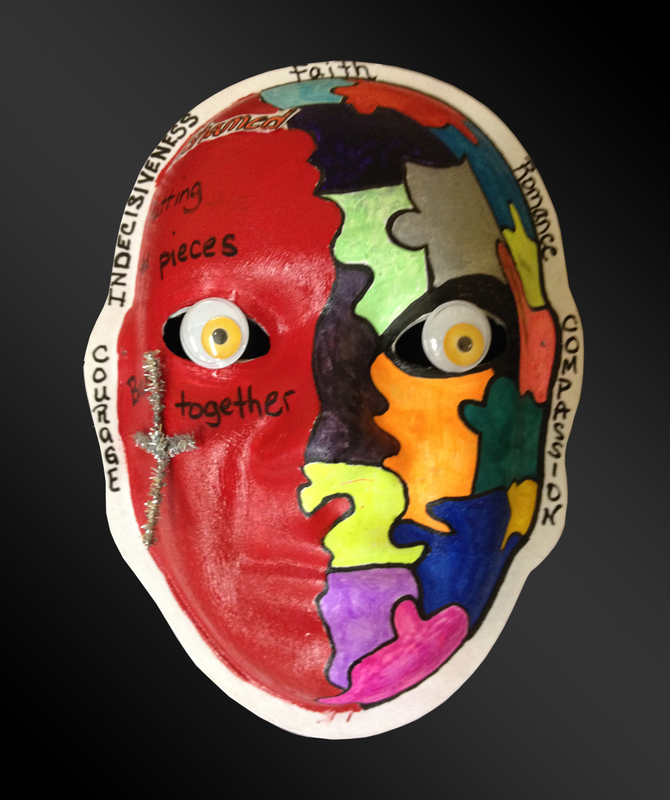 Explanation of Mask: Represents how a head injury never ends…it just opens you up to more possibilities! Explanation of Mask: My mask represents the great spirit of the bear. I believe the bear is my spirit animal guide. When I struggle through my rehab, I look to that bear to give me the strength to push on. 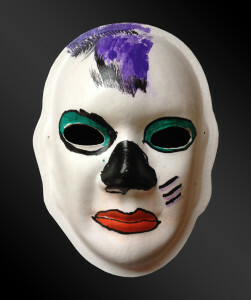 The war paint represents my strength and the purple represents the wisdom it takes to overcome a terrible ordeal. 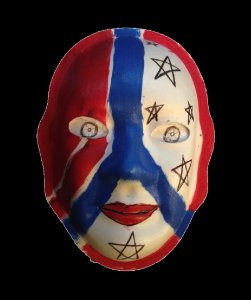 I placed my handprint on the mask to show what I received from the spirit animal guide. I am happy. 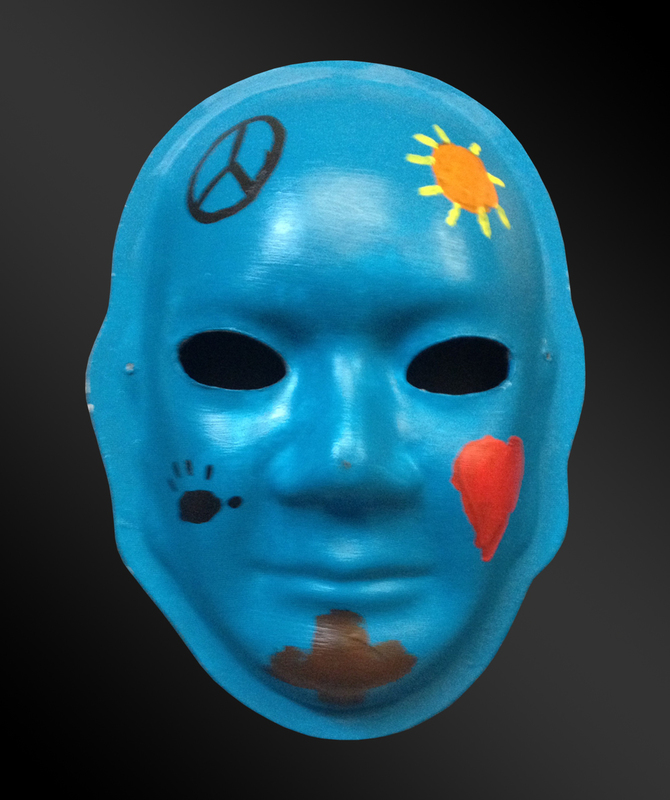 Explanation of Mask: I painted my mask blue to represent the difficult times in my life. The fuse between my eyes depicts my short temper and how I tend to say things before thinking first. I find myself frustrated often because I don’t understand or learn things the way I used to. I am consumed by feelings of anxiety, depression, and worry about how my future will turn out. 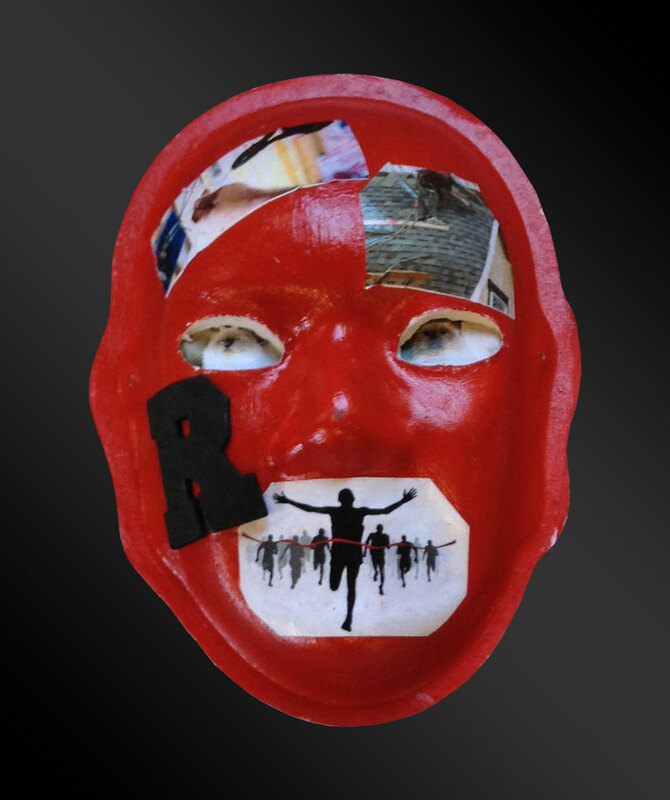 I placed the image of a man biting his nails over my mouth to represent my nervous energy. 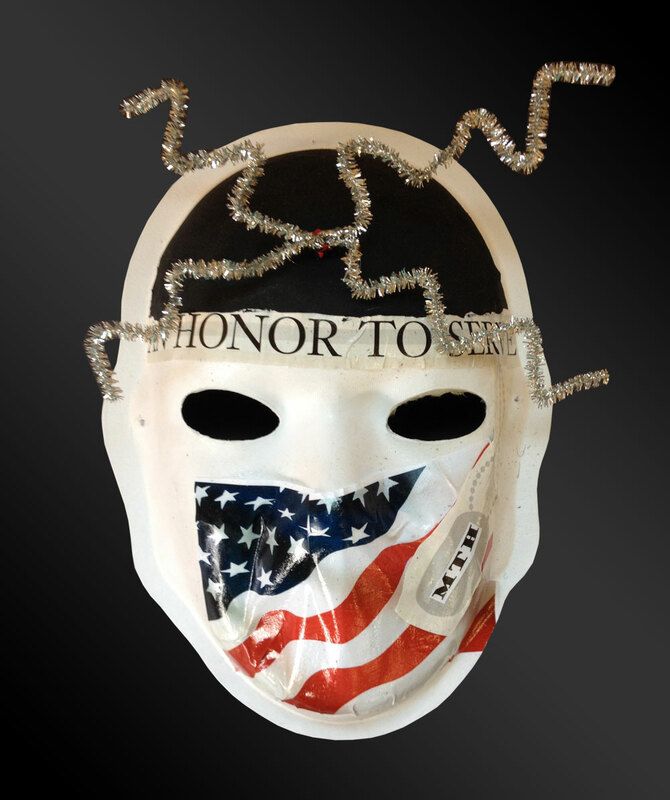 My brain injury happened when I was active duty serving in Germany, and I am a proud veteran of the US Army. 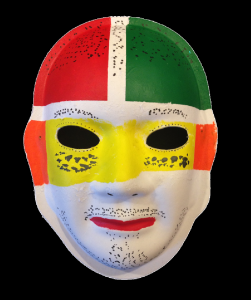 Explanation of Mask: I exercise to improve my balance. I like the color red because it represents being “outspoken” to me. I am a master craftsman with an excellent work ethic. 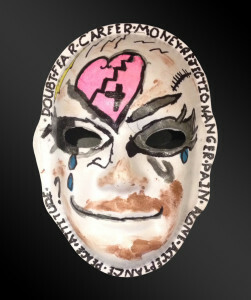 Explanation of Mask:Teardrop, pocket watch and infinity symbol represent: mourning of time lost, time passes so slowly now, and fear of being in this condition forever. Crack in space/time under left eye is a symbol of the past breaking through, my inability to run from it, and how Dr. Who got me through the darkest times, made me smile and showed me the man I want to be. 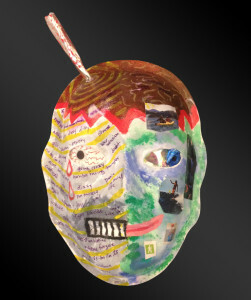 Forehead depicts the bullet hole, post-traumatic stress and anxiety I face. The storm in my head never calms, transfer of energy from the evil that tried to end me, and fuels my purpose to overcome this evil. 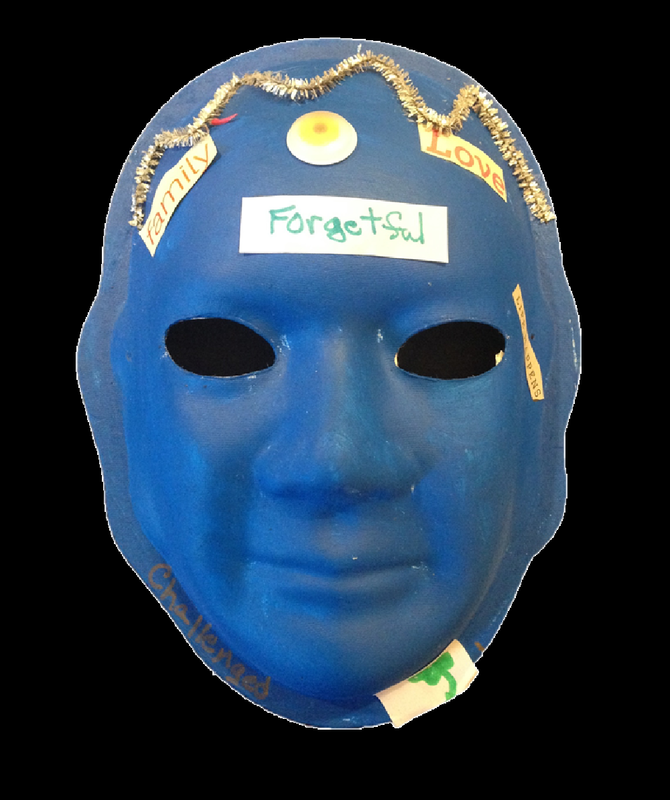 Explanation of Mask:I don’t remember any of my past. I used to own many reptiles. 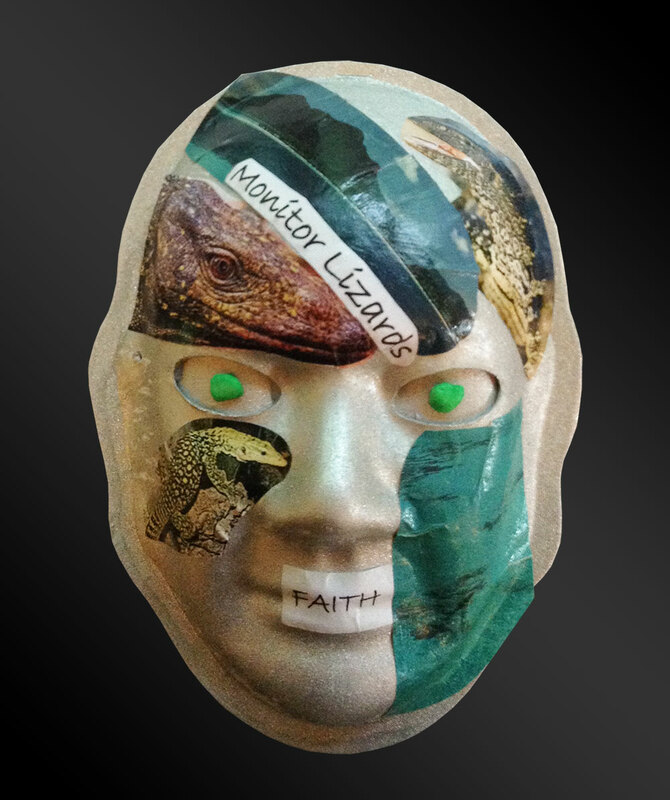 I feel my personality is like a monitor lizard because I try to blend into my environment. Mountains and blue water represent happy to me. 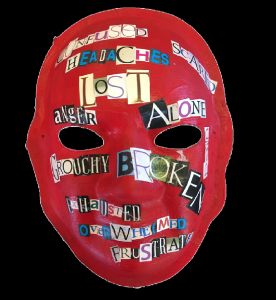 Explanation of Mask:My brain injury makes me feel lost, alone and misunderstood. My head is constantly confused. 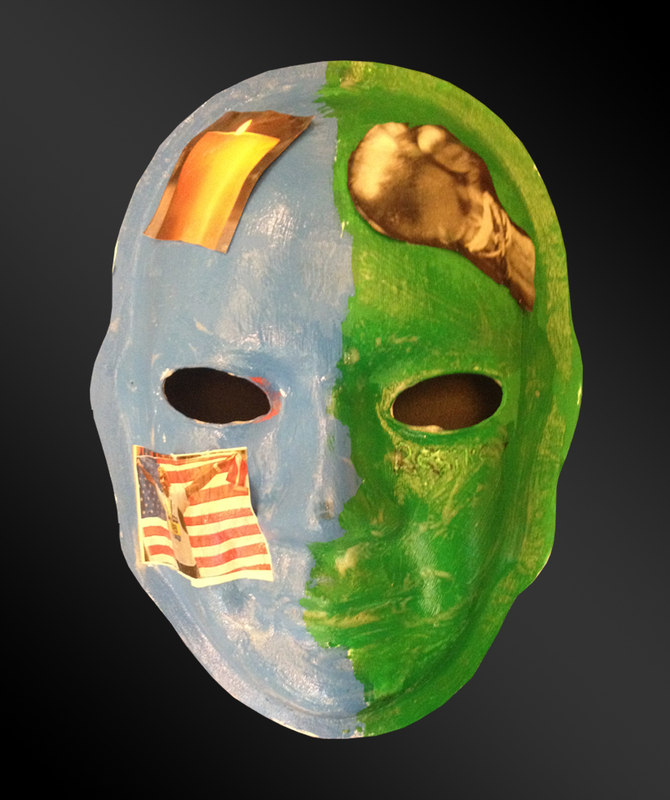 Each day I am trying to understand the new me as represented by the colors on the right side of my mask. The top shows my brain now, connections that are newly forming that lead to nowhere it seems. Each day I find new reasons for hope and I remind myself how much I have survived. 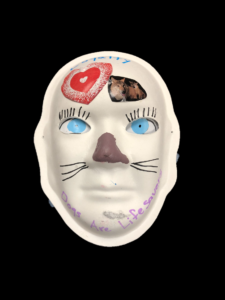 Please have compassion for my unseen disabilities. I’m trying. Explanation of Mask:Hamster wheel because I am anxious and worry a lot. Cork is for how I bottle up my feelings, tears about a broken heart, and purple representing feelings of warmth, safety, and loving myself. 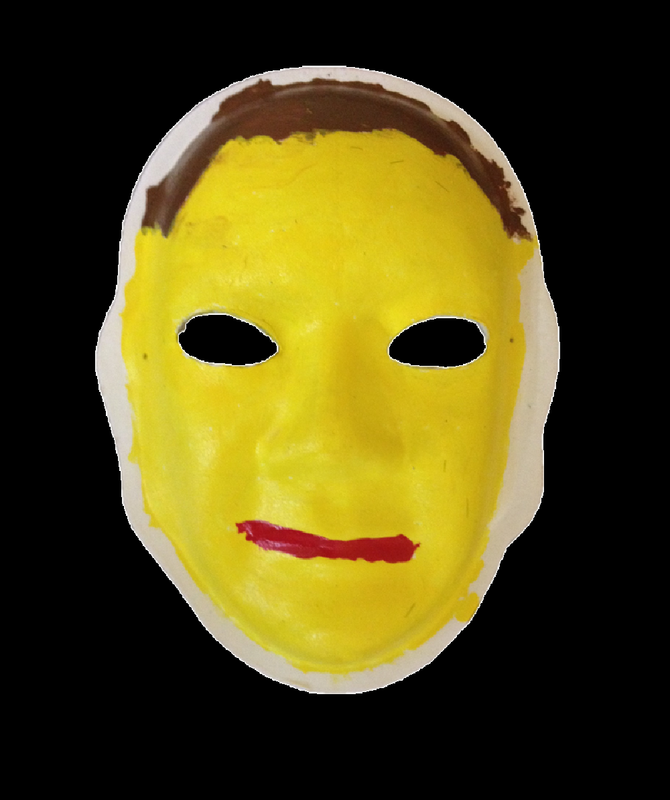 Explanation of Mask: I chose yellow faint lines because I am shy around new people and crowds. The brown cross represents how important my faith is in my life. I have purple lines to represent my extreme paranoid tendencies and my intelligence. The red footsteps are my enthusiasm for walking again. The orange heart represents that I’m a confident individual and secure in myself. I have good relationships with the people that are close to me. 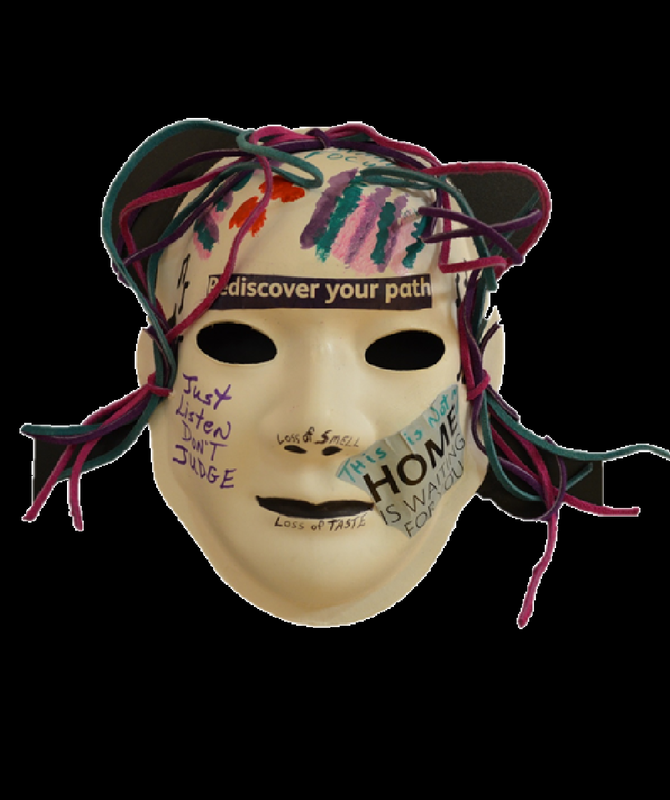 Overall, my mask is a good representation of my journey so far, and my lifelong recovery process. Brain Injury: I was drunk and fell 2 or 3 stories out of a window in Fletcher, NC. 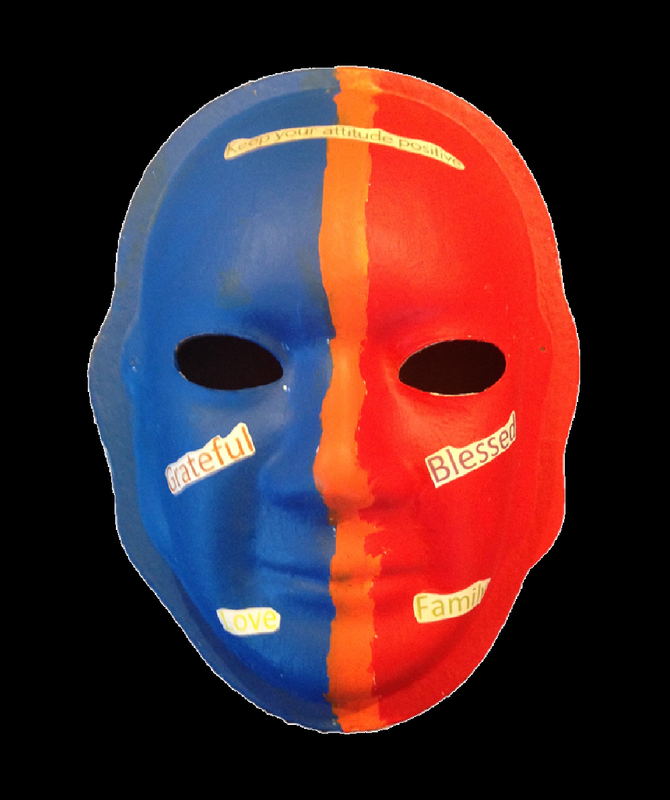 Explanation of Mask: The orange represents my confidence and a slight lack of discipline. Green is for my sometimes controlled behavior. 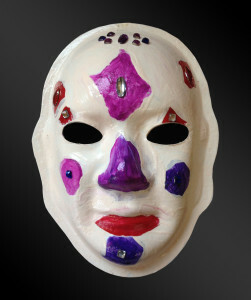 The dots represent inward anger that builds up and turns outward. The pointed lines are for intelligence. The quote on the forehead is from the Bible. When Jesus comes up out of the water, His Father says this. 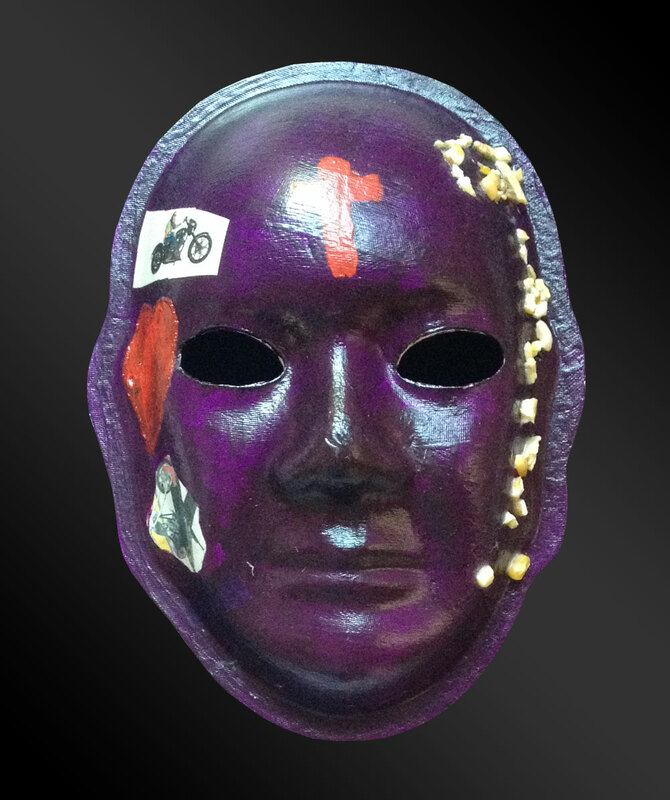 The purple mouth represents controlled reactions, self restraint and discipline. Both of my hands shake which is hard for me to control. The shaking comes from my brain which, as you know, was injured. I am taking some supplements to help the shaking to cease but it is taking a long while. I have only been taking them for a year which is nothing compared to my actual age. Having a brain injury though makes me feel determined and curious about what the future will hold for me. 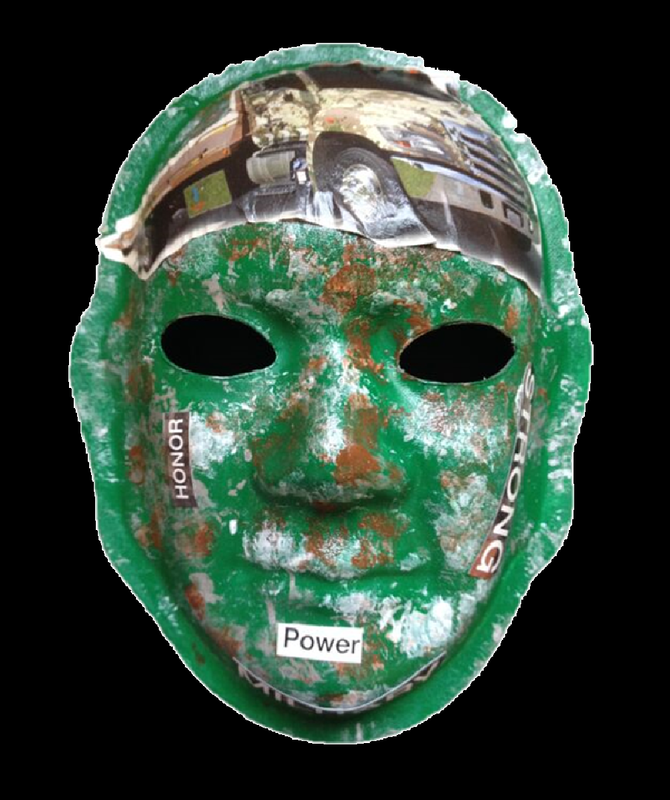 Brain Injury: In 1994, I was hit in the head by someone’s fist and then fell to the cement floor. 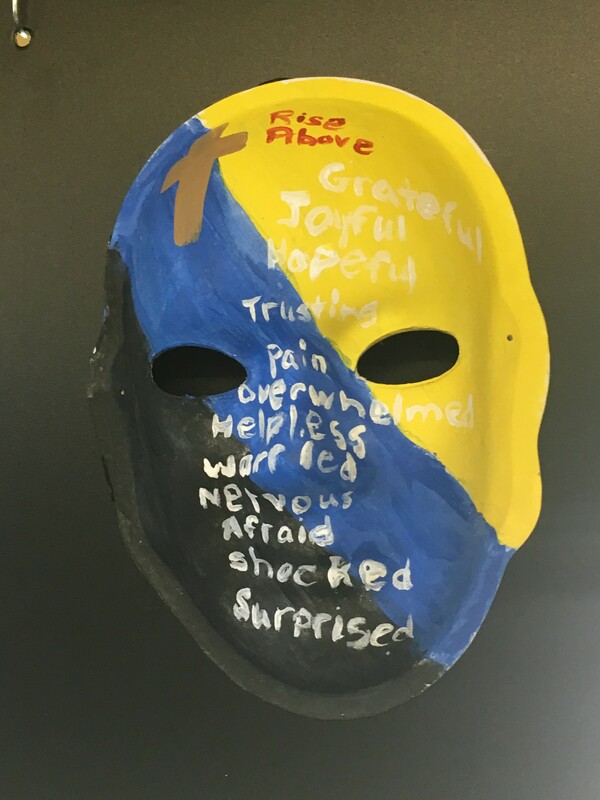 Explanation of Mask: I chose yellow because it was my grandma’s favorite color and I love that color. The blinders represent what I can and cannot see, because my occipital lobe was injured. 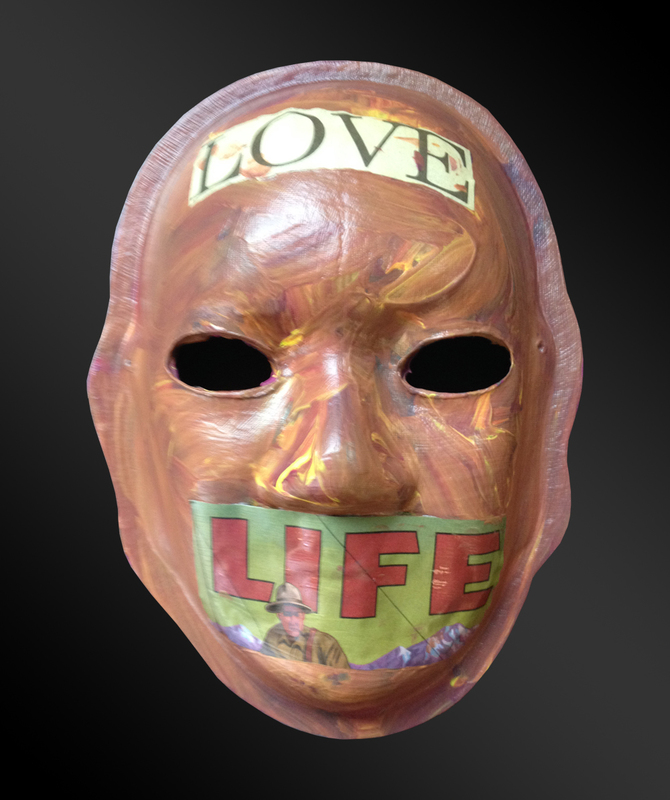 I put a bible verse over my mouth because I want to spread the gospel everywhere I go. The jagged lines represent my heart being broken. While I was in a coma my dad was murdered and my Uncle Bob was killed in a car crash. They were the only two men in my life. I had a fiancé, who is the mother of my child, and she left me. The unbroken heart represents all of my loved ones and the new loves I have found since my brain injury. The tassel represents my accomplishments after my accident, including graduating from high school. Having a brain injury makes me feel like I am a survivor! Brain Injury: I was in a car accident when I was 16. 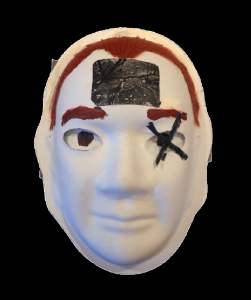 Explanation of Mask: The scar over my right eye represents the part of my brain that got hurt during my accident. The blue is for my eye color. My brain injury makes me feel bad because I had a car accident when I was 16, but it makes me feel good because I am alive to be with everybody else. Being around other people makes me happy. Flowers below my nose represent losing my sense of smell and the bowling alley is for my love of bowling. 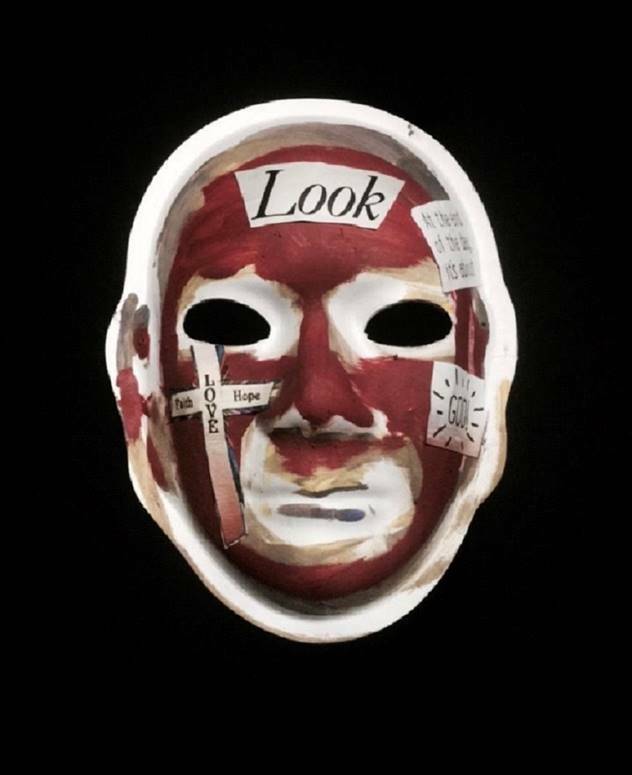 Explanation of Mask:I woke up one morning and there it was. My stroke makes me feel like I am slower than other people. My intention was to be military for the rest of my life and make it a career. That ended when I had my first stroke while I was serving in Germany as a nurse. 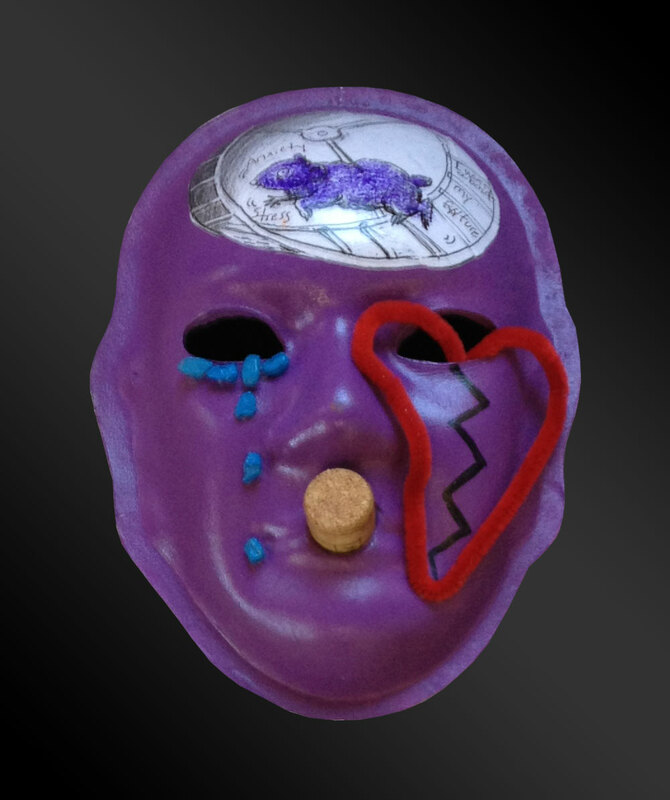 My mask is purple because purple is my favorite color and the tears represent my mom dying. Explanation of Mask: The scarred and stitched red mouth represents my often dark sense of humor that I use to make life easier to deal with. The blacked out eyes show my often cynical outlook. The burning eyeball thing represents my intelligence and determination. Also, just cuz it’s cool. 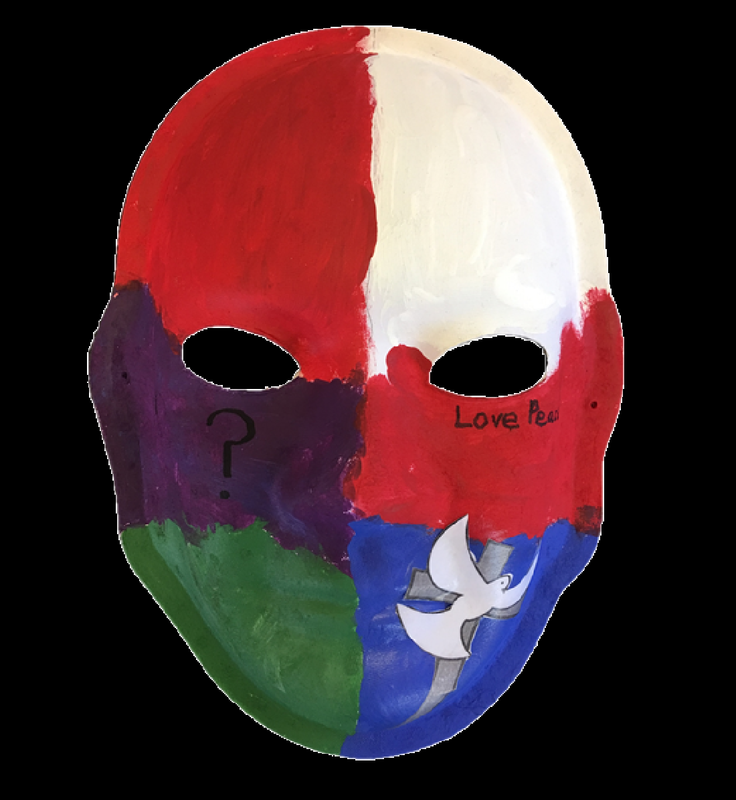 Explanation of Mask: I painted my mask purple to represent love and family. The cross represents my relationship with Jesus Christ. Farming is my favorite thing to do and my family has raised corn and cattle. My favorite person in the whole world is my daughter and one thing we love to do together is ride motorcycles. Before my brain injury, I was also a boiler tube welder in power houses. I am grateful for every morning that I wake up. Thank you, God! 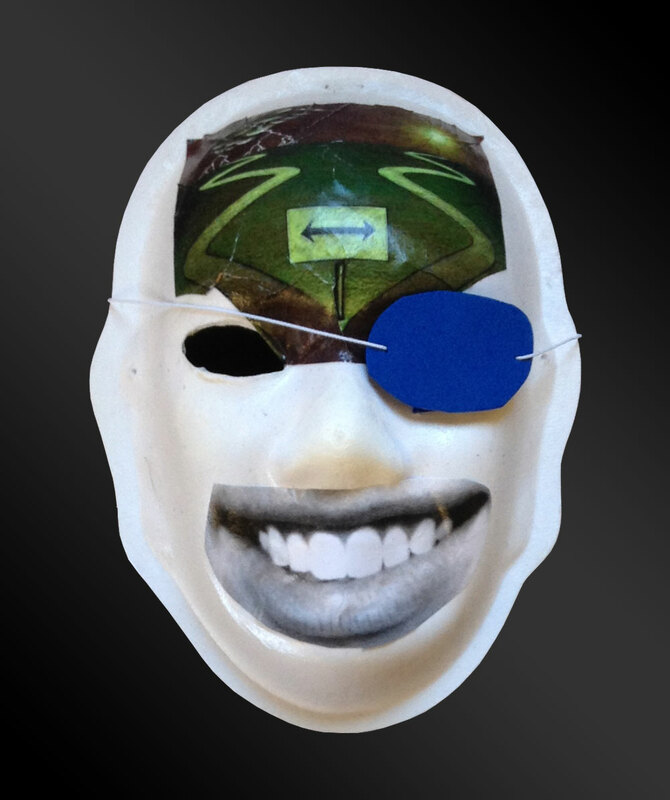 Explanation of Mask: Dale is funny and likes to have a good time. He is also a caring member of his family. His wife’s name is Pam and they have three children and five grandchildren. Dale drew the picture of his family to represent what an important part of his life they are. The mask is covered with newspaper because one of Dale’s favorite past times is to look at the newspaper each day, especially the sports section. Throughout his career Dale has coached football and lacrosse. He likes to stay active by participating in community groups such as Hinds’ Feet Farm and the Asheville Aphasia Support Group, and spending time with family and friends. 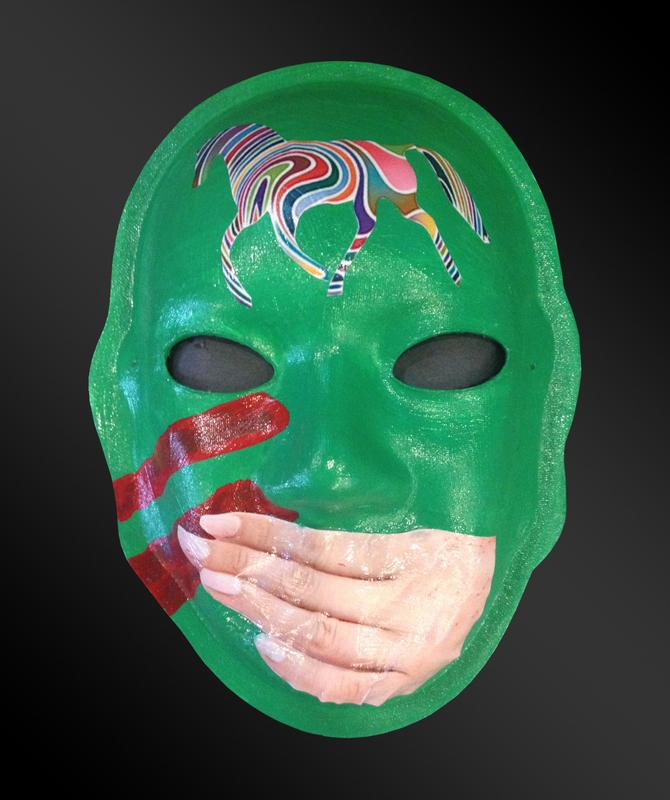 Explanation of Mask: Hands over my mouth representing my shame, being torn, afraid, unwanted, and sadness. 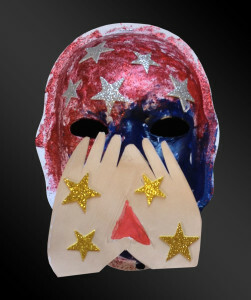 Glitter for my sparkling personality, and stars to show my desire to be a celebrity. 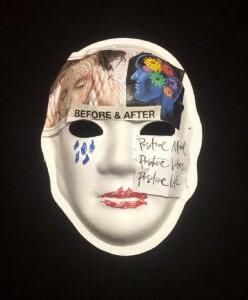 Explanation of Mask: “I’m alive”! I like to be alive. I love animals and children, but I’m allergic to cats. Purple is my favorite color. I’m a regular person. Big smile and hazel eyes- “I’m happy”. Explanation of Mask: Lightning bolts to represent the firestorm of thoughts in my head. The American flag and dog tags represent my service in the Army. Explanation of Mask: My mask is half “serious me”, and half “funny me”, because I’m both. 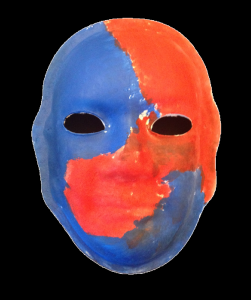 Explanation of Mask: I chose to paint my mask black & royal blue. Black is for my feelings of frustration, darkness and sadness; and blue is for my feelings of love, strength, family and communication. 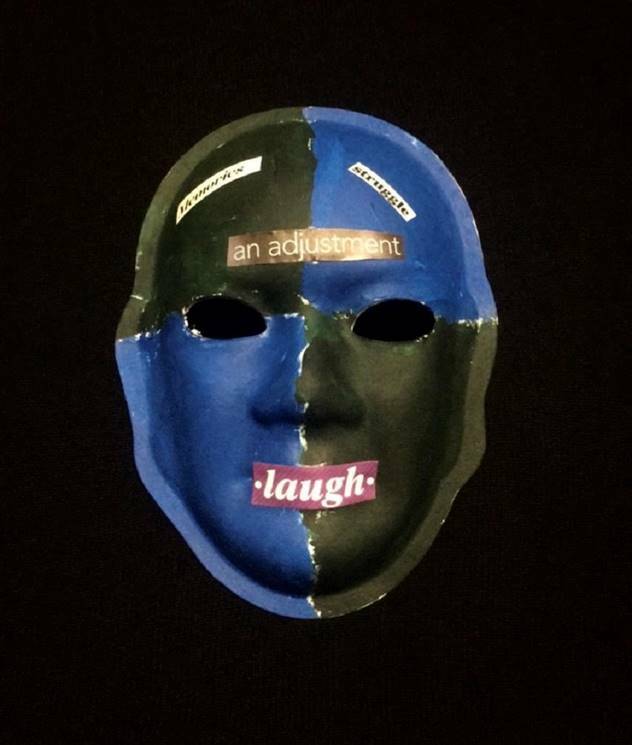 I placed a combination lock over my mouth to represent the times that I don’t feel heard by others. 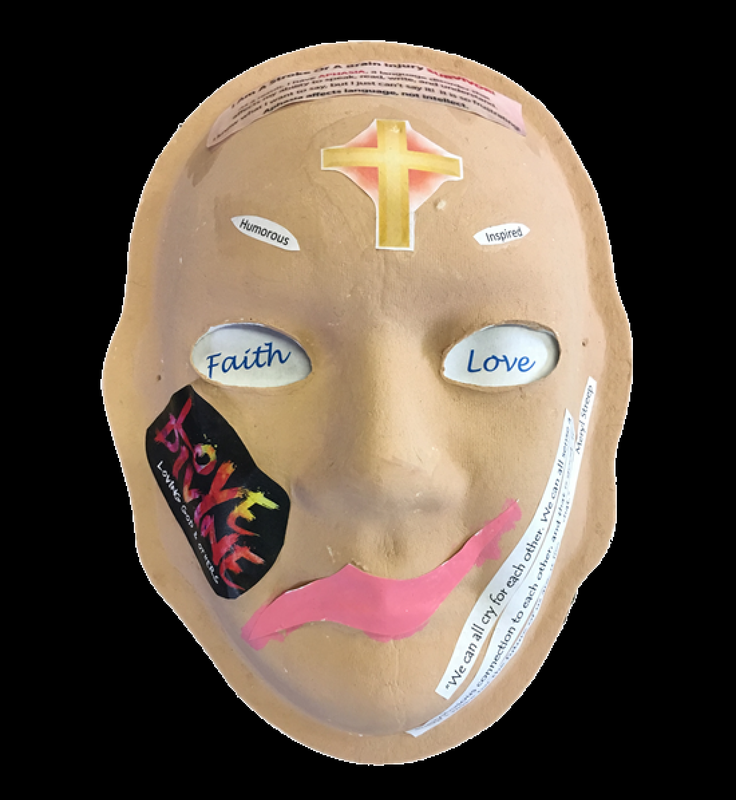 Most importantly, I placed a cross on my forehead to represent the influential role that faith has played in my recovery journey. Explanation of Mask: I love nature and the sun shining down on me. Flower represents my love of spring, summer and fall when flowers are in bloom. The pack of dogs represents my desire to volunteer at a dog farm. 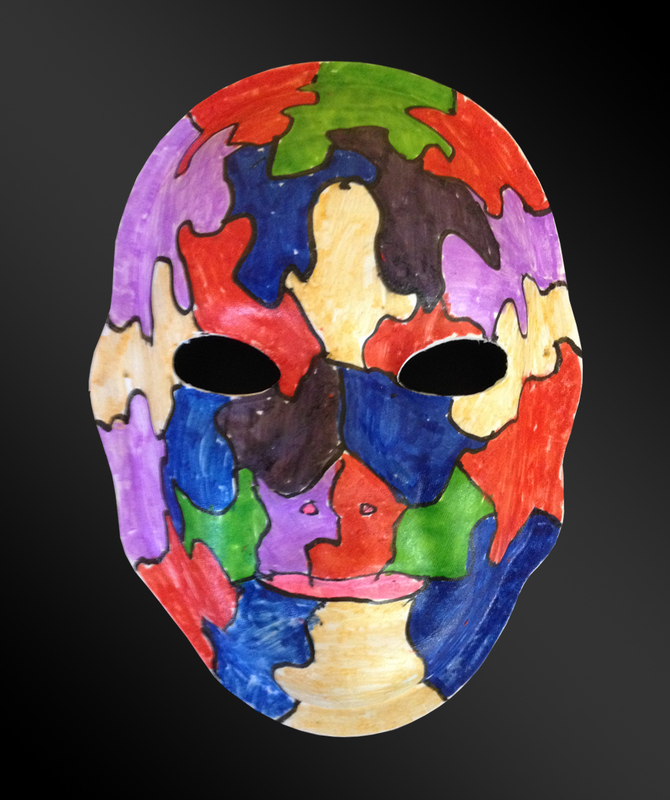 Explanation of Mask: I’m like everyone else. I have thoughts and I am smart. I have a brain injury so I get tired easier than most people. I’ve done things most people haven’t, but I can’t always remember them. I just have different ways to remind myself. I have so much going on in my head, that when I go to say it, I usually have forgotten. Sometimes it’s difficult to communicate, but I’ve found everyone responds to kindness and love universally. 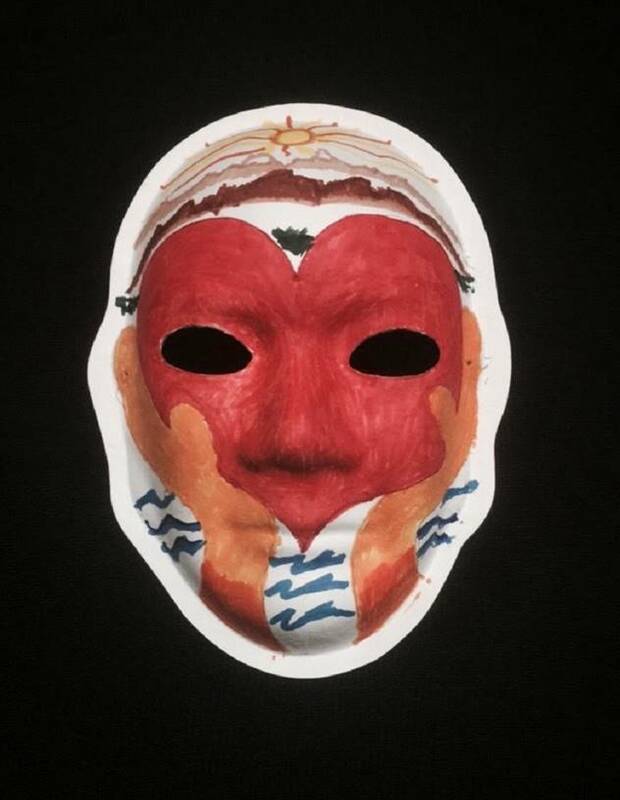 Explanation of Mask: The volcano represents my temper which is very close to the surface of my personality. 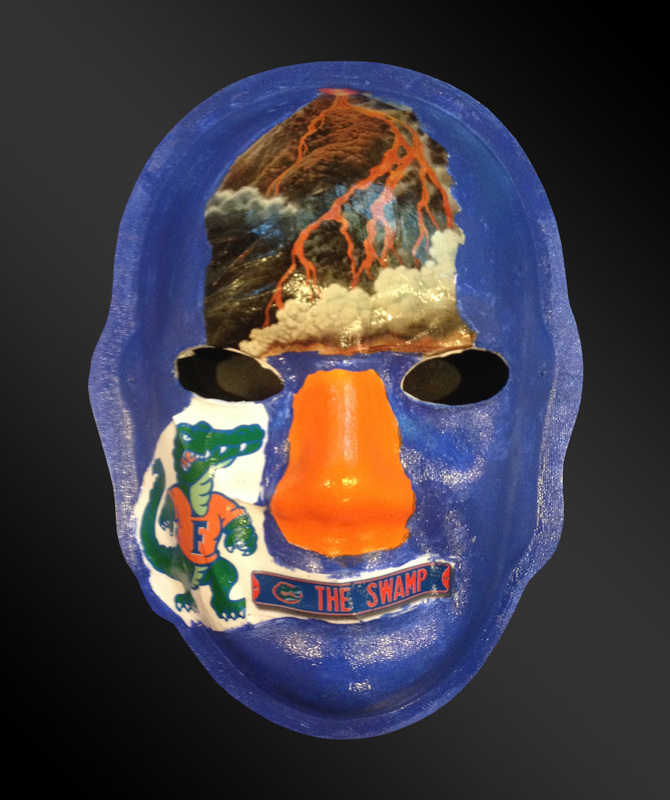 I attended The University of Florida, so Florida Gators are the best!! Explanation of Mask: My mask is a representation of what all has been put before me. The cross means my savior has saved me. The heart represents my love towards everything I do. The peace sign comes across as my love. The paw print symbolizes my love towards animals. The sun means there’s always going to be another day. 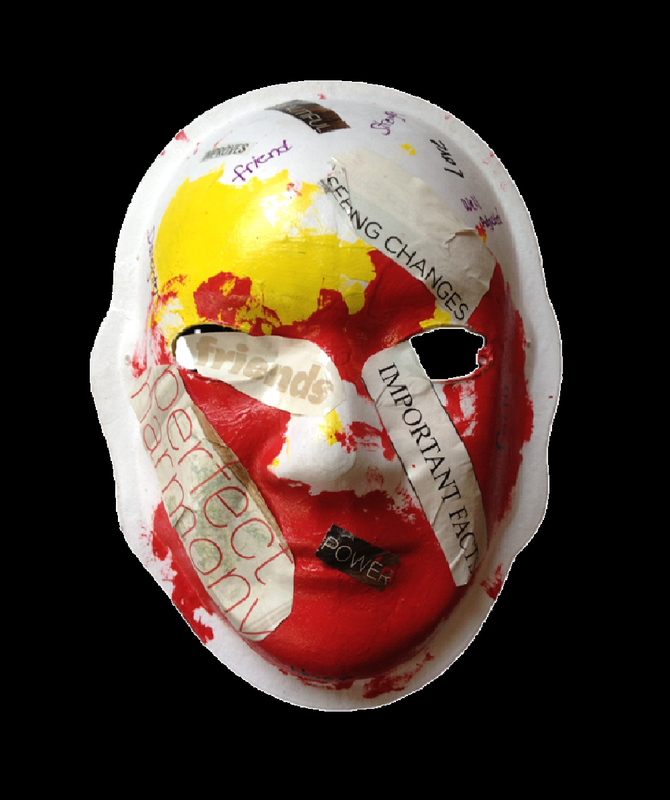 My brain injury has made me become a stronger person. 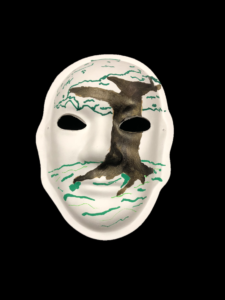 Explanation of Mask: The green color on my mask represents loyalty. The hand over my mouth indicates how I can’t say what I think. My eyes are blacked out because I now have limited vision. I placed red stripes across the face to show that loyalty isn’t able to help me. The rainbow horse on my forehead represents my love of horses. 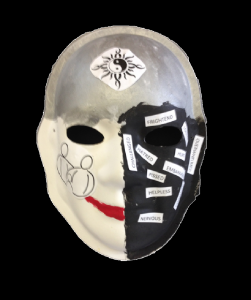 Explanation of Mask: The blank mask represents my personality. The injury I sustained erased the person I used to be. It caused a significant change, leaving me with a “blank” personality. 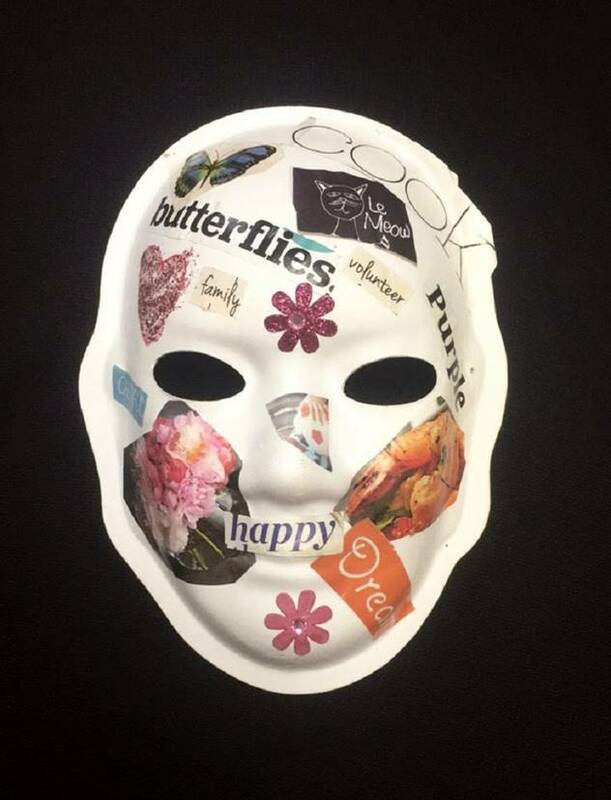 Explanation of Mask: The pictures I selected for my mask represent all the things that are important to me. 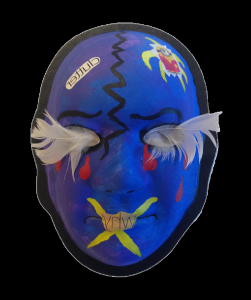 I placed a dam over my mouth showing how my thoughts are held inside because I am unable to speak following my brain injury. I can’t always stop myself from drooling, which explains the dried glue coming from my mouth. Explanation of Mask: My mask shows how the stroke has changed me. 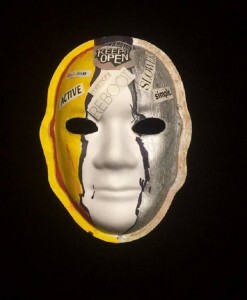 These are the feelings and experiences I have gone through, and the lasting effects on my life: prison inside myself, alone, can’t communicate, can’t see, can’t read or write, weak, feeling inferior, depressed, not worthy of life, a burden. Brain Injury: Pushed in Sunday school and bounced my head off a bookcase. 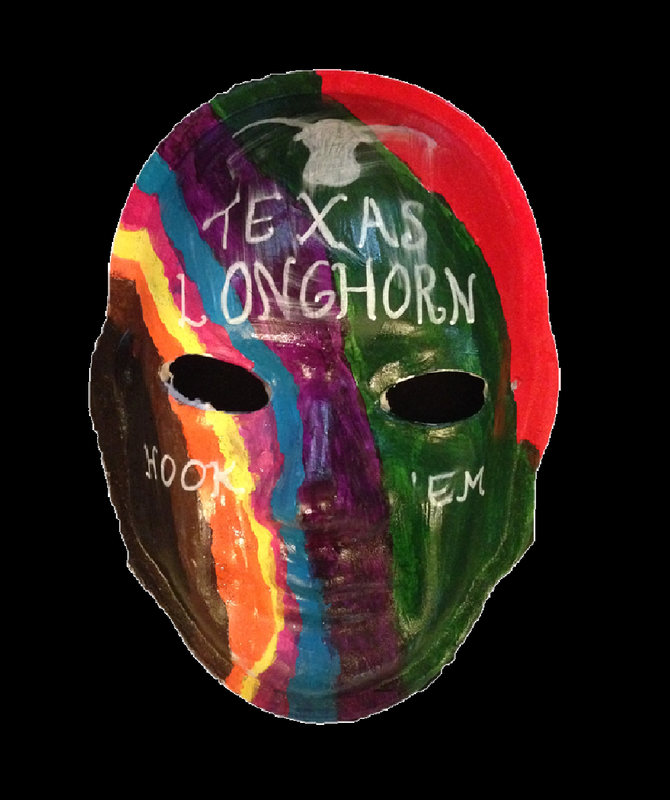 Explanation of Mask: I love college football and LSU is my favorite team. 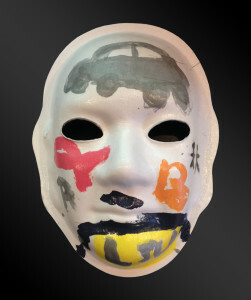 The car, grades, and people on my mask represent achievements after my brain injury. The car for my drivers license, the grades for my diploma, and the people for my job/co-workers. The pink ribbon is for my mom. Explanation of Mask: “The hat is cool. I wear a hat. I like sports. My dog’s name is spike. I am an uncle with 2 nieces.” 2003 is the year Jon had his accident. 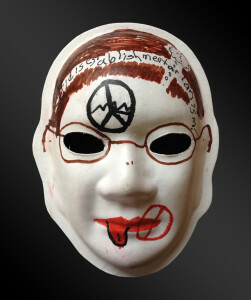 He currently attends MindMatters class at Appalachian State. Jon attended Illinois State and studied meteorology before his injury. 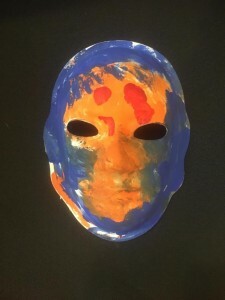 Explanation of Mask: Orange is my favorite color. I love bowling. 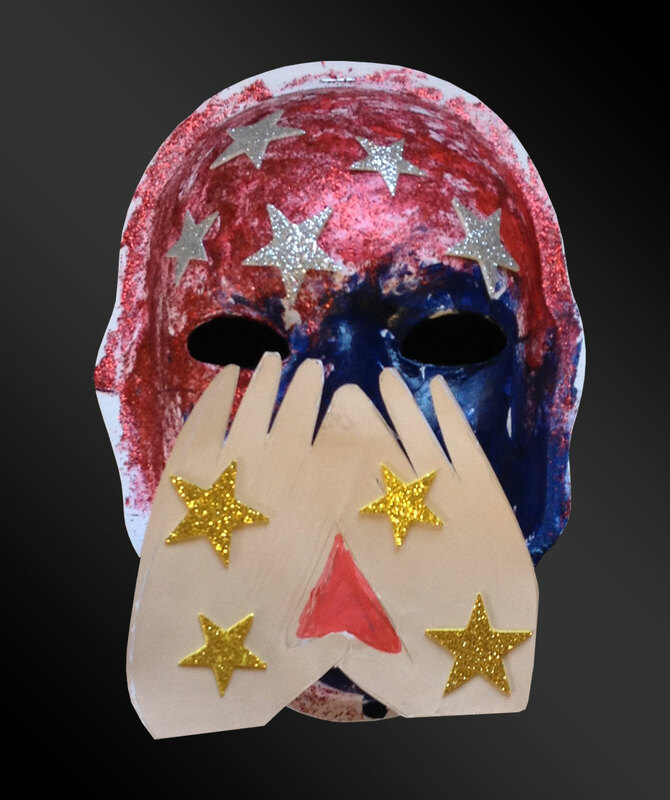 I also included the sun and stars. These are all my favorite things. Brain Injury: A motor vehicle accident on a rainy night in 2001. I was 18 years old. 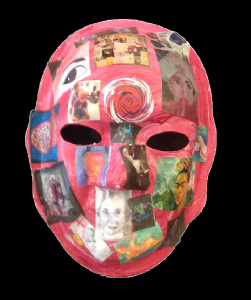 Explanation of Mask: I am serene after my brain injury because I have learned how to cope, and this is what my mask reflects. I am cheerful, happy, courageous, and kind. I cherish my life! I am not afraid. I am determined to succeed. Brain Injury: 25+ pound farm tool slamming down on top of my head at work. They call it a “mild” TBI, but it’s been 18 months of struggle. 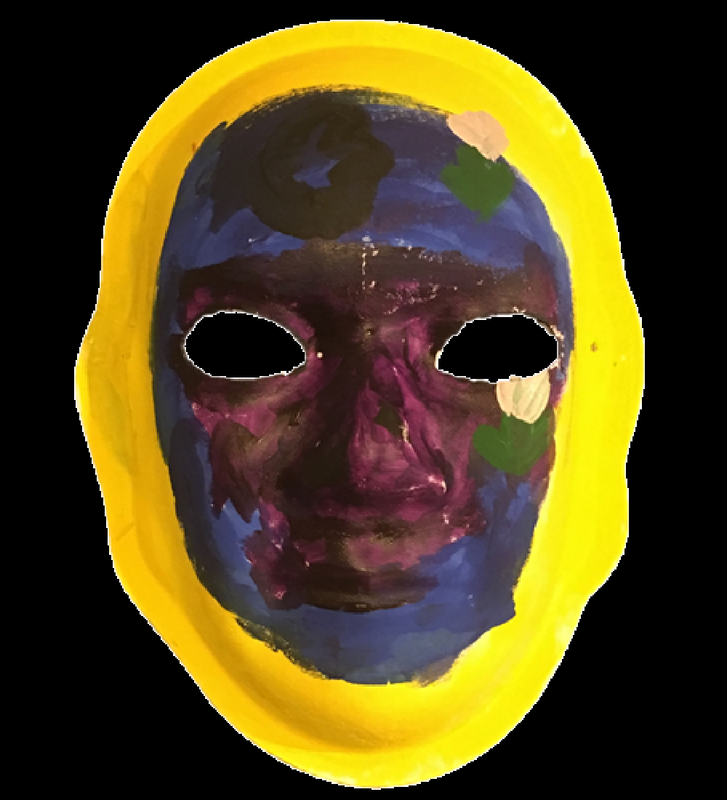 Explanation of Mask: One of the main sources of happiness and joy in my life pre-TBI was being active and doing things outside. 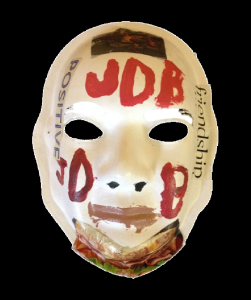 I had a lot of things that brought me joy taken away due to the effects of my TBI, as expressed on the mask. People with TBI strive each day to heal, make accommodations, and find new ways to be happy. Some days it feels like it is not possible, but we have to remind ourselves every day that it does get better. Bad days will pass, and we will thrive. This mask-making was helpful because it makes the internal struggles of TBI apparent to others. This injury is invisible! 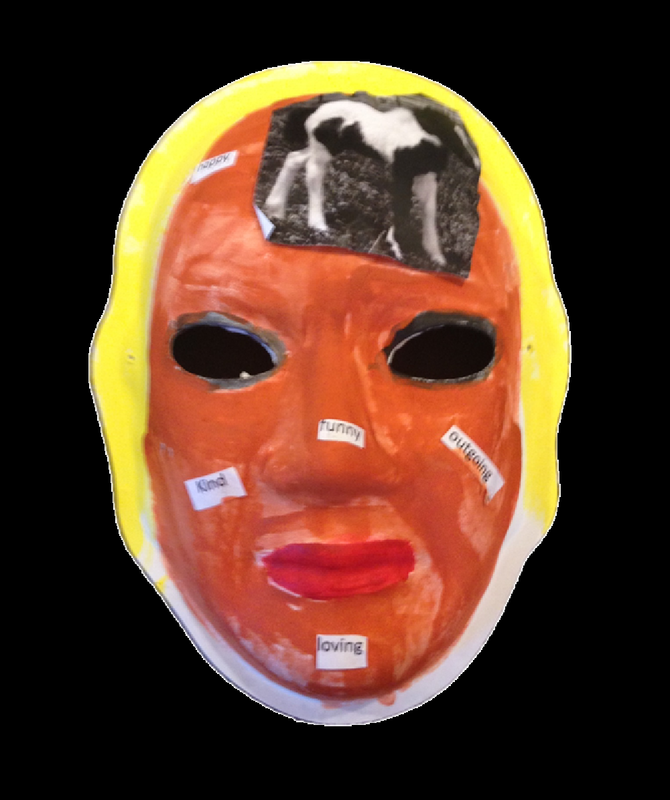 Explanation of Mask: My brain injury happened at birth. My family and friends have helped me through tough times. I painted a heart to show how my love for others. 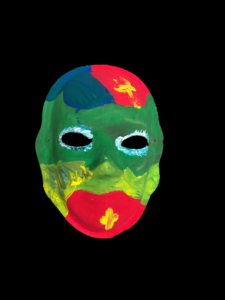 I used bright colors to show how happy I am. Everyone is different, and I just want to be understood. People should try to understand others, even though it may be hard. Brain Injury: A seizure caused my brain injury. 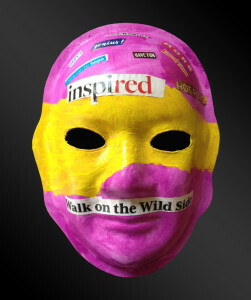 Explanation of Mask: I am determined, different, playful, relaxed, sympathetic, curious, and wise. 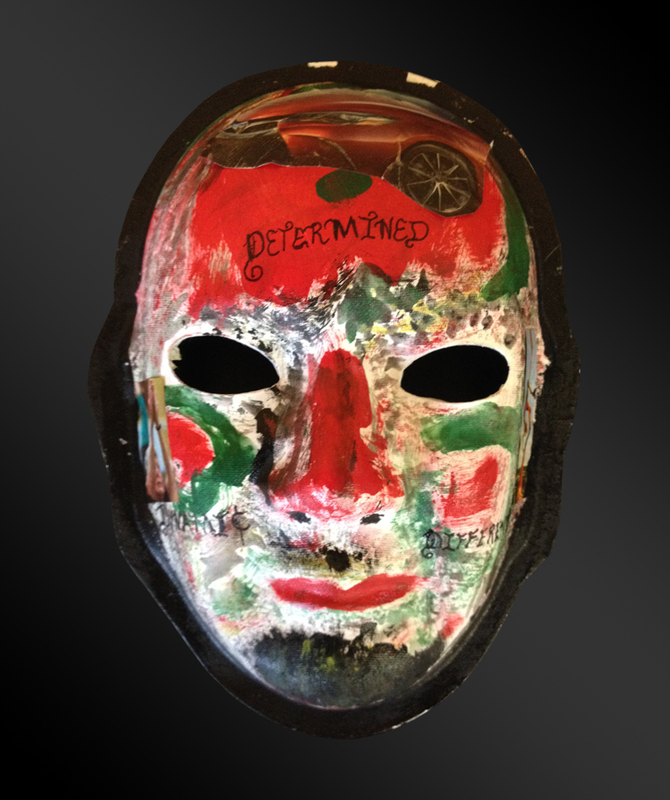 The red on my mask shows my strength; green and black are for my determination. Cars represent strength. I played soccer before the seizure. I love poetry and am very dynamic! Brain Injury: Pedestrian hit by a driver that was texting. Explanation of Mask: The heart represents my life recovered and the love I have for my family. My family helped me recover from my accident, and without them I wouldn’t be able to live the way I do today. Explanation of Mask:The colors on my mask represent the following feelings: fabulous (blue), strong for being a clean person (red), fun at heart (green), compassionate (purple), value my family (beige). Brain Injury: I was pushed off a 30 foot high pier and landed on my head. Explanation of Mask: Blue represents my want to be free. I love fishing; it helps me relax and feel like myself. LOVE is written across my forehead because I still love so much, even after my TBI. Explanation of Mask: I received a gunshot wound at age 33. Before the accident I was a fisherman and a hunter, and loved to work. Through the accident I have more faith in God and appreciate family more. I’m thankful to be alive. My family was told I would not live, and if I did, I would be a vegetable. God was my healer! Brain Injury: Fell down a mountain over a series of waterfalls in Stone Mtn Park, NC. 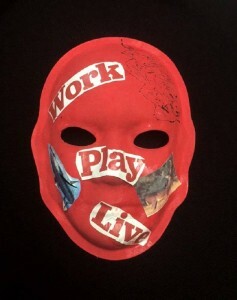 Explanation of Mask: Red is for happiness I spent 3 years I Taiwan. I like the way the Chinese use color to represent life. Green is for life. The purple crown signifies royalty. I am a prince of God! 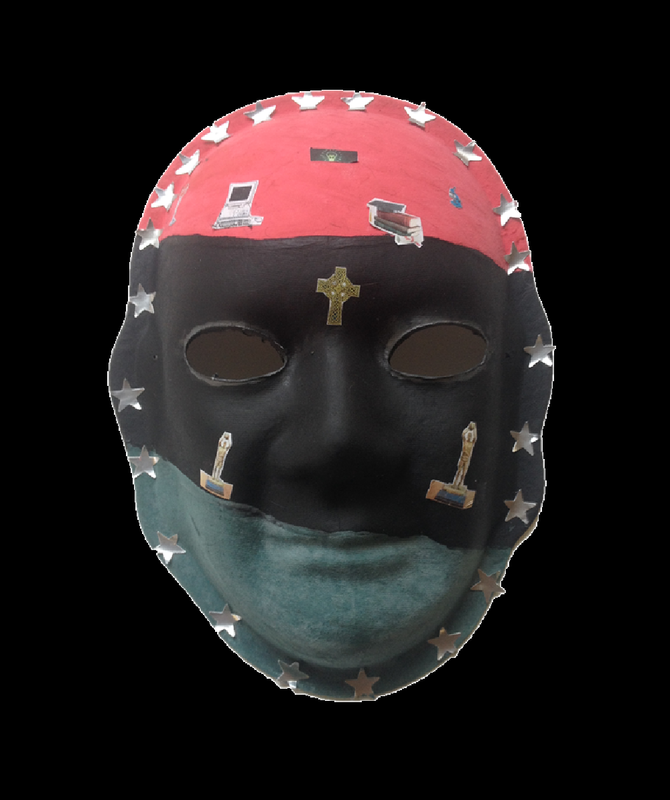 Explanation of Mask: It feels like a piece of my brain had an earthquake hit it. I can’t always remember what I want to say. I still remember how to spell things like “antidisestablishmentarianism,” but I can’t speak clearly anymore! I like to make jokes and laugh, but sometimes I feel frustrated. Brain Injury: Operation for Arterial Venous Malformation. 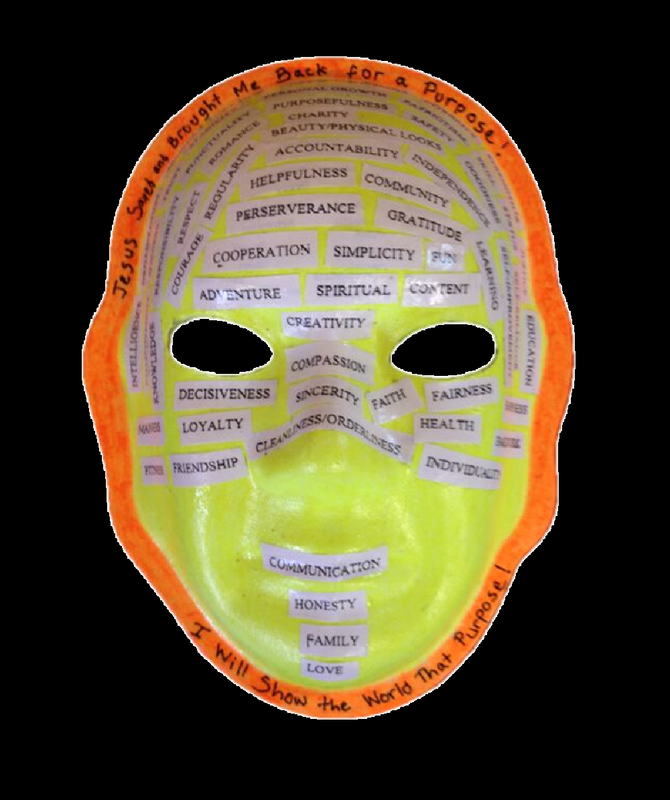 Explanation of Mask: I am lucky because I have multiple occupations. Explanation of Mask:The green is for losing my left eye. Light blue for my remaining right eye. The candle represents peace, and the boxing glove signifies that I’m a fighter!! 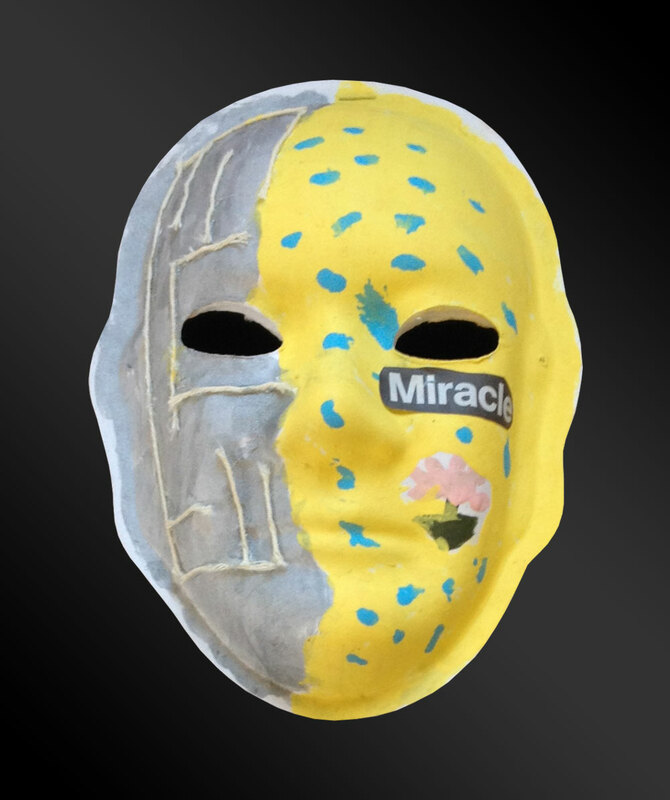 Explanation of Mask:Despite my injury, I still feel like a beautiful person inside. I still feel happy. Purple is my favorite color. I like to wear jewelry, because it makes me feel pretty. Explanation of Mask: Life is like a puzzle; trying to determine “who really cares?” I feel ashamed and indecisive, but I still have faith, courage, romance and compassion. Explanation of Mask:The Ford represents the two cars I own. They make me very happy. The American flag is the license plate that was on the car that my dad owned. Brain Injury:Motor Vehicle Accident when I was 21. 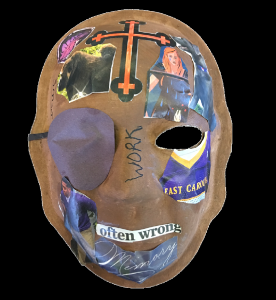 Explanation of Mask: Before my accident, I was a straight A student doing well. I worked an electrical job and was making good money. I was planning to enter college and start on a 2 year degree to start an apprenticeship as an electrician. After the accident, I had to go back to learning my ABCs and who my parents were. I work at Rowan Vocational Opportunities now. I do some electrical work and run machines that weld insulators together. I put a cross on my mask because my doctors said I had a 30% chance of walking away. Mom, Dad, and others prayed for me. Then I started going to church. Now I can lead others to the God. Even though brain injuries are traumatic, they can find pleasure in the cross. The stars and flag are for thanks to the troops and veterans who fight for our country. 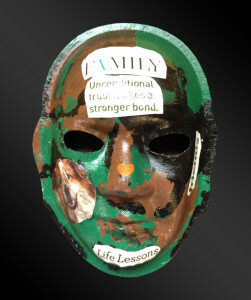 Family, strength, and spirituality will help me lead a healthy life. 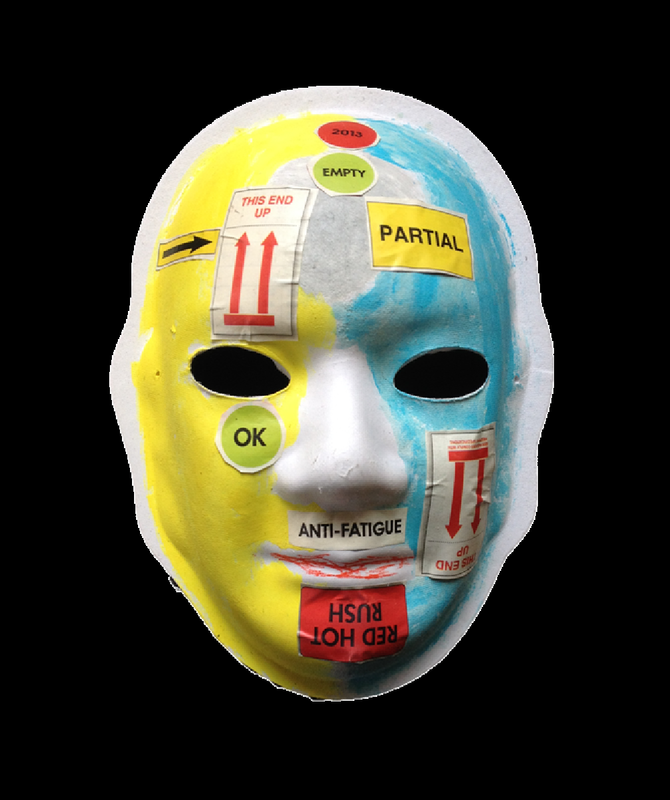 Explanation of Mask: I feel like my life is divided, before the injury and after the injury. I studied French before my injury. I am an incredible, happy person who loves cats, and I am still striving to be a giving part of the community. 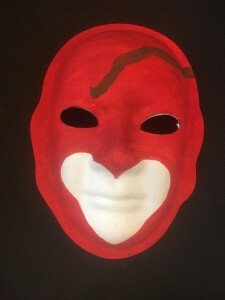 Explanation of Mask: Red represents my favorite color. Yellow is for all the happiness in my life. And I love being outdoors. Brain Injury: Motor Vehicle Accident. I hit a tree going 90 mph when I was 33. 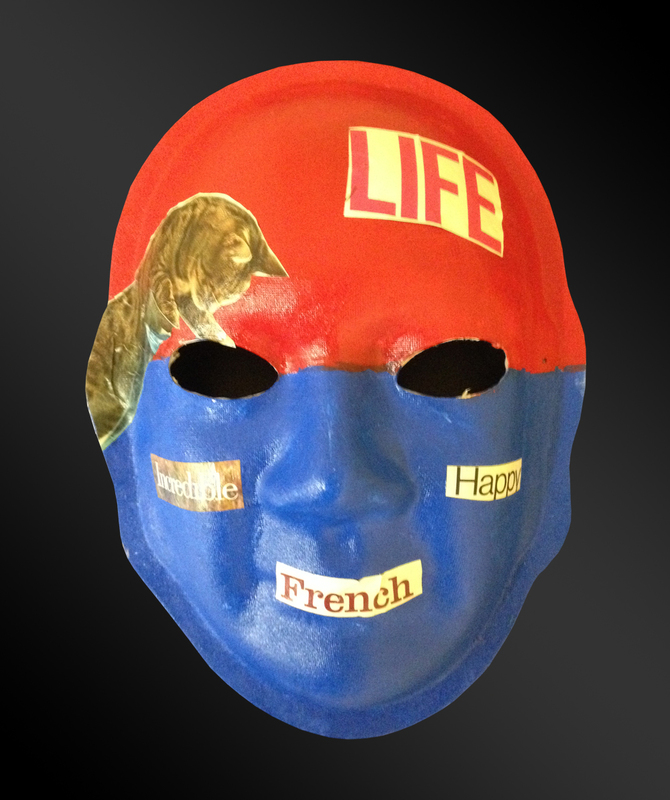 Explanation of Mask: The happy words on my forehead are a symbol of how I feel about life. Laughing is the best medicine; life is too short to not live it to the fullest. 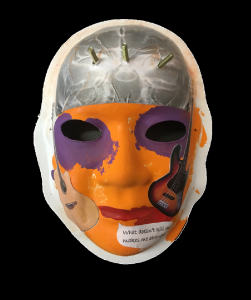 Brain Injury: I was hit by a car when I was 12 and was in a motor vehicle accident when I was 40. 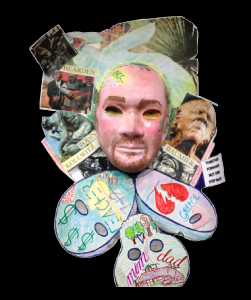 Explanation of Mask: I guess I’ll never be married and have children. My family is gone. I am sometimes happy and sometimes sad. 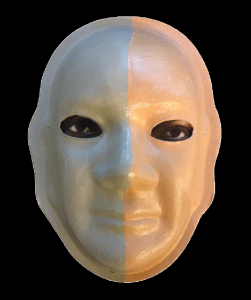 Explanation of Mask: At first I was afraid to lose myself and then I was embarrassed how people now view me as that used to be David. I soon started to climb up day by day, week by week, piece by piece, and believe in the possibility of a thinking system that I can use to improve myself. Explanation of Mask: Content… Very happy. Purple is my favorite color. Red stands for “heart” and blue for “peaceful.” Family is important, and so is coming to camp and sharing with other people. Brain Injury: Hit my head either while jumping on a train I wasn’t supposed to be on, or in jail after the police took me there. Explanation of Mask: The bird is a thought flying overhead, thinking about nature. I was away from nature in prison. Nature represents freedom and places I cannot go. Brain Injury: In 2005, I had a motor vehicle accident. I was 35 years old at the time. Explanation of Mask: The black represents my anger, the red represents the love I have for my family, and the yellow represents being alive after my brain injury. The road is for my accident, and the silver lines in the road mean that brain injury isn’t all bad. Brain Injury: Fell off a 15ft wall at age 20. Explanation of Mask: The top of my mask represents my extreme head injury from my fall; all of the neurotransmitters being broke loose. It left me as an infant, having to relearn everything. Recovering over the last 14 years has been like going through the stages of life twice. I just have to say, “Never say you can’t!” Why tell your brain, “You shouldn’t even try.” You can…. Just have to do it! 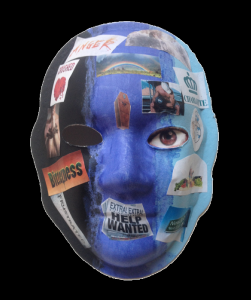 Explanation of Mask: I feel blue. 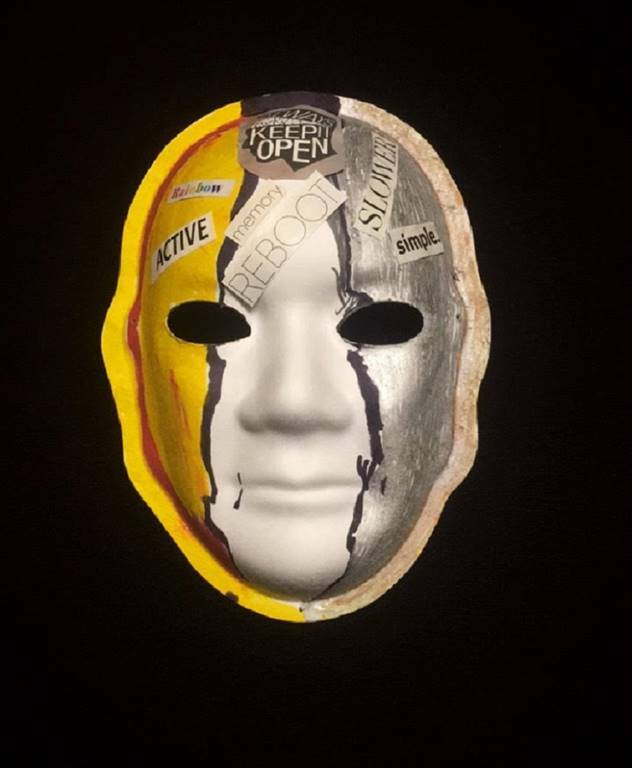 My mask explains how the consequences have left my true self (in memory) locked inside still having some brightness that helps me see and think there is something worth living for, although many times I am misunderstood. Keeping my faith in God through Jesus and wanting to help others keep me up. Brain Injury: Hit by a vehicle driven by a drunk driver. Explanation of Mask: The accident changed my life. I’m a miracle because I spent 76 days in a coma, but I’m here today… walking and living life. I feel loved and am inspired to get better every day. I learned to block out the bad, and accept the good. I added the strips to show I came through it all with flying colors! Brain Injury: I had 6 seizures and was diagnosed with viral encephalitis. Both the disease and surgery that followed caused my brain injury. Explanation of Mask: My mask represents me praising God for each day of life, especially after my brain injury. We are all so blessed and we should “embrace it” as best we can. I praise God… my children, my friends… everything is a blessing! Brain Injury: In 2001, my left tire blew out, and my car rolled 18 times. 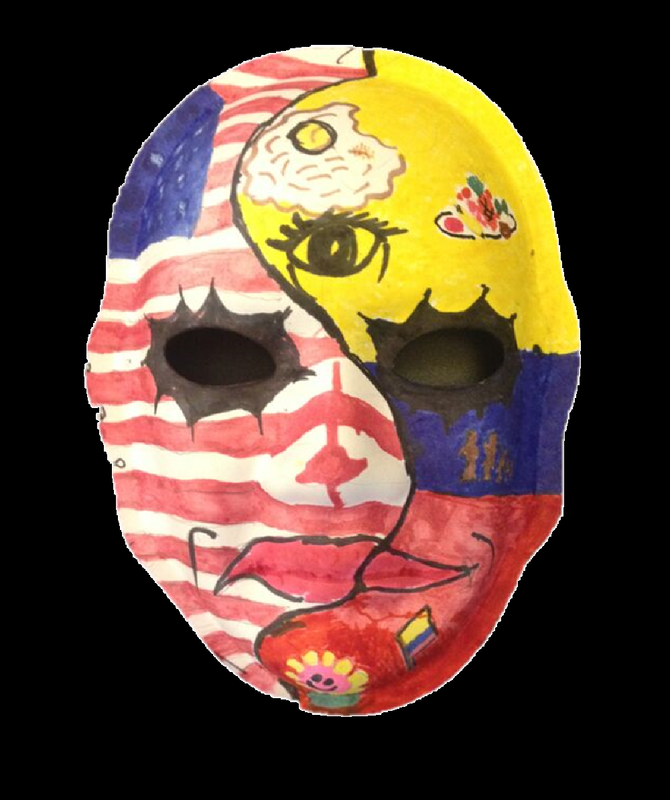 Explanation of Mask: I have great pride in my country because it is an amazing place to live. 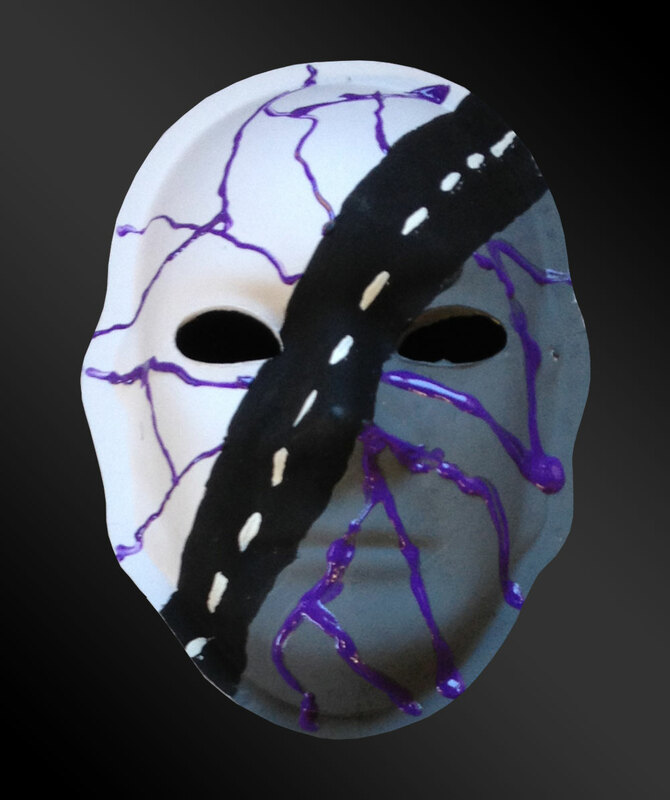 I painted the top of the mask black because that is where my injury occurred. Explanation of Mask: My fiancé and I are a happy family. We will be together forever. My daughter calls him “dada” and that makes me happy. Things are working out between me and him and we will soon get married! Brain Injury: Benign brain tumor when I was 10 years old. Explanation of Mask: I feel forbidden to speak, and feel I’m taken as a joke. I am a poet with a powerful message. Music is my escape from this reality. I feel excluded from the popular cliques. 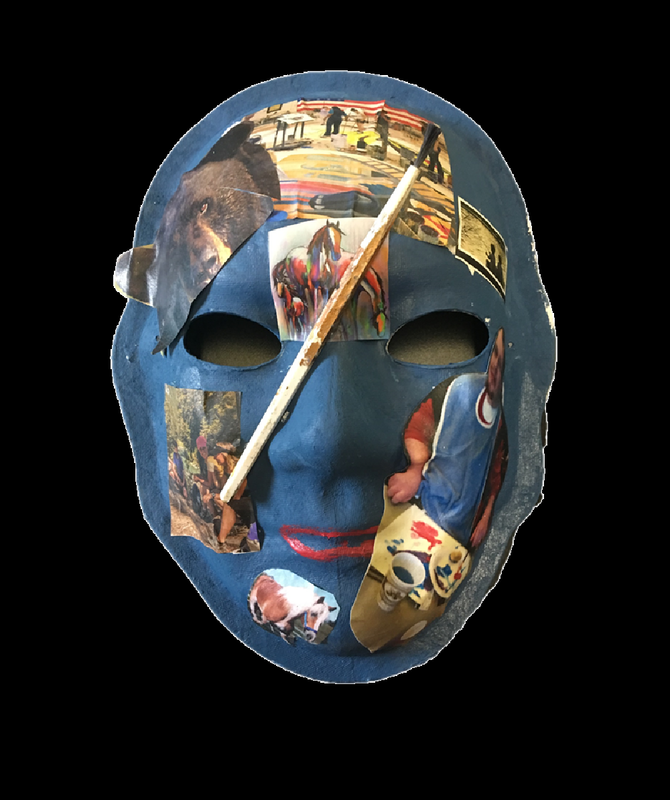 Explanation of Mask: Bowling is something I’ve enjoyed and have excelled at since I was in Boy Scouts. I’ve earned 5 bowling trophies in Scouts, and in a special population bowling league. I’m very proud of the fact that that is one of my many accomplishments. Explanation of Mask: Emotional, dark appearance…Keeping to myself…Isolated. 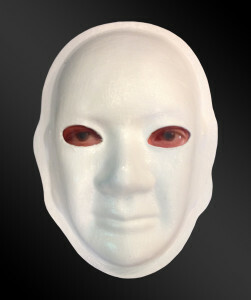 The mask look is dark…This is how I dress and feel most of the time. 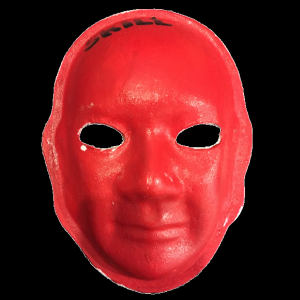 Explanation of Mask: My mask is red to show how I feel about my injury. I am angry because I was injured twice while riding my bike and made fun of by people who thought it was my fault. I often felt depressed after my injury, so I painted tears to show that I am sad. I also feel angry, and that’s what the lightning bolt is for. Brain Injury: In 2006, when I was 13 years old and skateboarding. Explanation of Mask: The tears represent my depression because I can no longer skateboard, and because of my lost friendships. I still love playing the piano, and listening and dancing to music. Explanation of Mask: Happy… Content… Calm… Confident… Grateful… and Hopeful. It is good to be alive! Brain Injury: Hit by a car at age 13; I then slipped on the ice in and hit the back of my head. 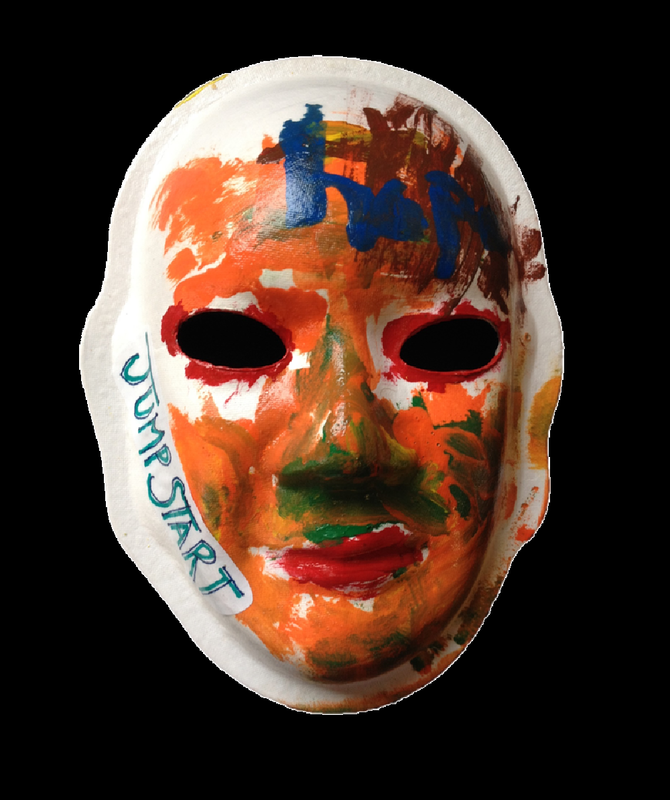 Explanation of Mask: Jump Start means I have a second chance at life, an opportunity to undo the errors in my life, to make a better me! Hope is on my forehead to remind me that I need to keep that at the forefront of my mind. The boisterous mixture of color represents my varying emotions. Brain Injury: Motor vehicle accident in 1997 when I was 23 years old; I overcorrected and hit a light pole. Explanation of Mask: The brown represents the hardship of TBI. But TBI is not all bad. My brain injury has been a learning lesson. The orange represents the brighter side of TBI. My life has been different as a result; it has taught me to rely on others and on God. I feel I’m here for a purpose. Explanation of Mask: When I first had my accident in 1983, I was tormented and made fun of, and felt extremely sad. Over the years, I’ve started to see that there are people who are in worse positions than me. I’ve been able to recognize that just because you have a brain injury doesn’t mean that you’re dead. One half of the mask symbolized how I first felt when I had my accident, sad and depressed. 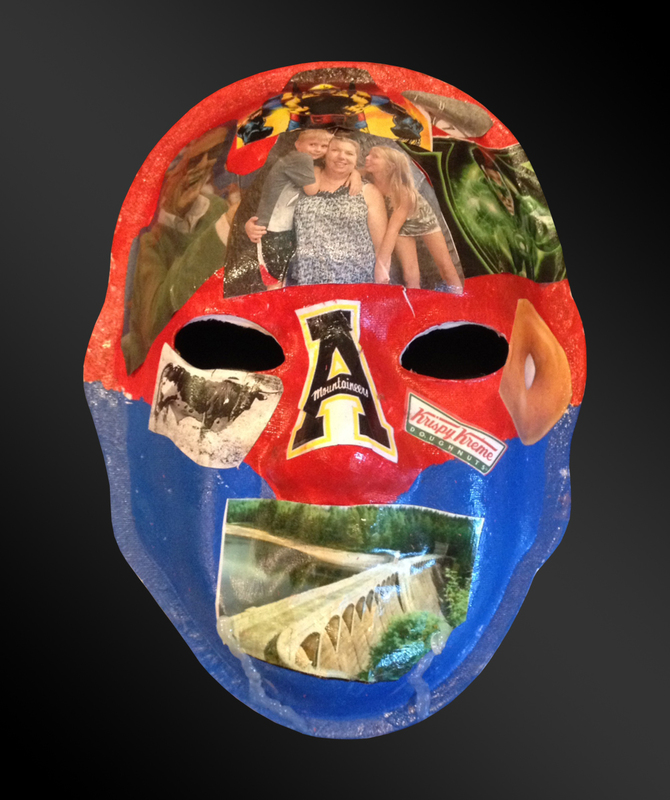 The other half of the mask symbolizes a happy life and being at Camp Carefree with all of the smiling faces. 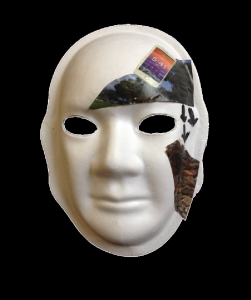 Explanation of Mask: After leaving work, I dropped my phone while driving, went to pick it up, and drove us off the side of a mountain. I fell 180 feet, broke a few bones, and got my TBI as a result. 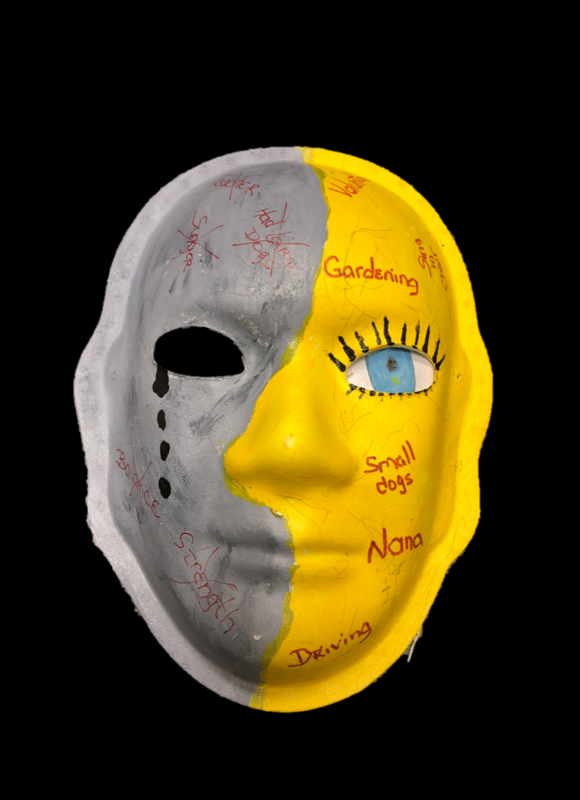 Explanation of Mask: Mixture of emotions. I enjoy watching funny movies. Red represents the tree I hit. Brown represents the reality of my life. 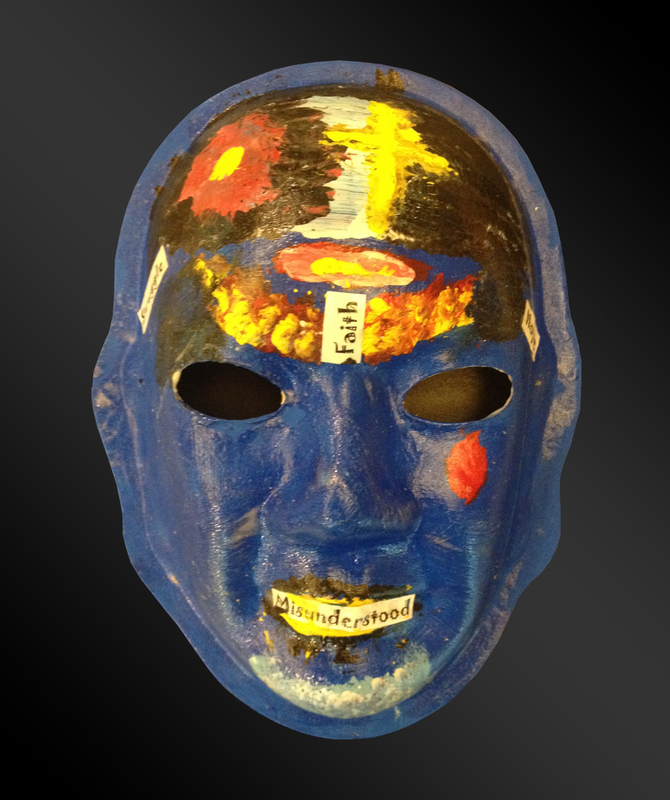 Brain Injury: I was riding my bicycle as a teenager and was hit by a car running a red light. 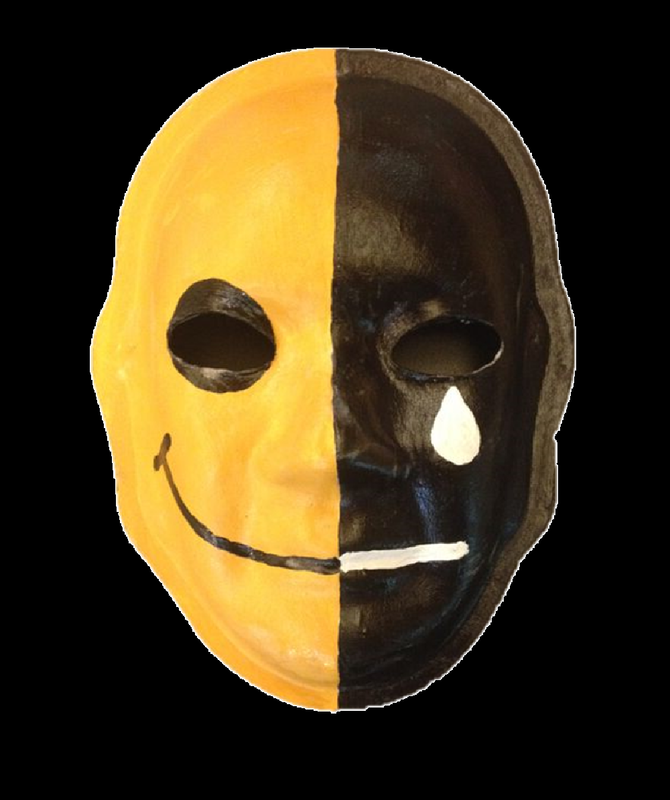 Explanation of Mask: Happy & Sad! I show more happiness on the outside. I like working at ReNu Life. 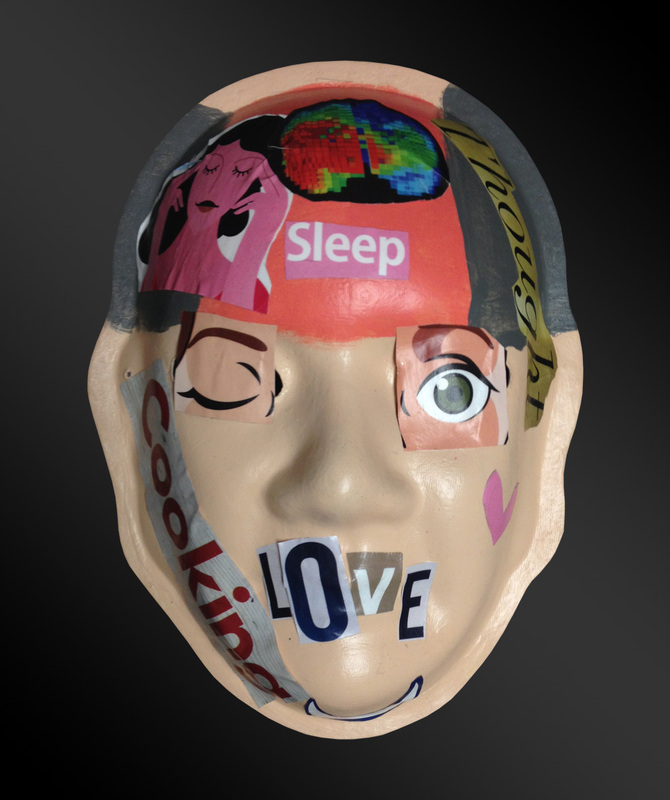 DANGER – Do all you care to prevent brain injury? 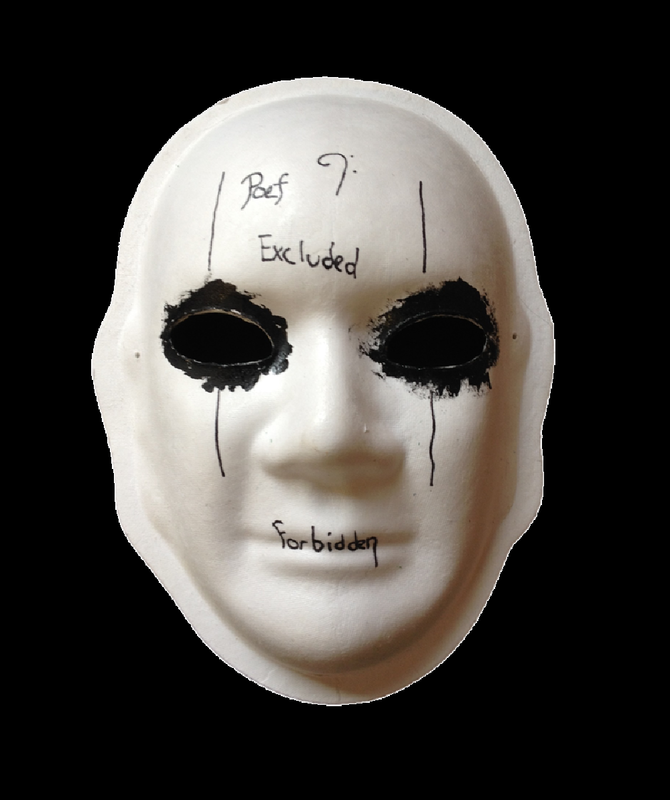 Explanation of Mask: The mark on my forehead indicates where the doctors tapped my skull to drain fluid soon after birth. Yellow is patience. It’s a happy face. I never knew what my body was like before my TBI took it over. It’s just the way it is. Brain Injury: Motor Vehicle Accident in 1990. I was 38. Explanation of Mask: I like my mask because my family is Christian. My dad was a pastor in Durham, NC. 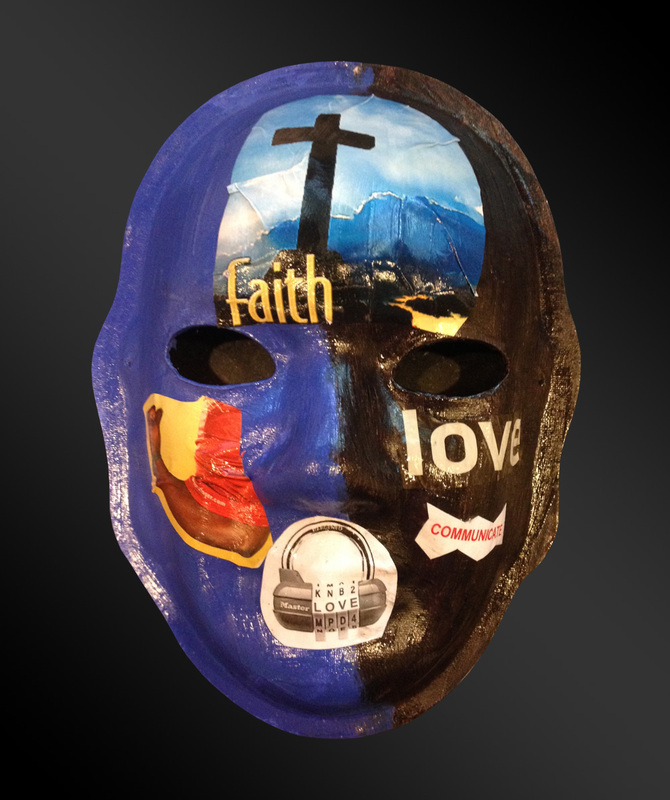 And I am using my mask as a representation of my Christianity, my heart and soul. 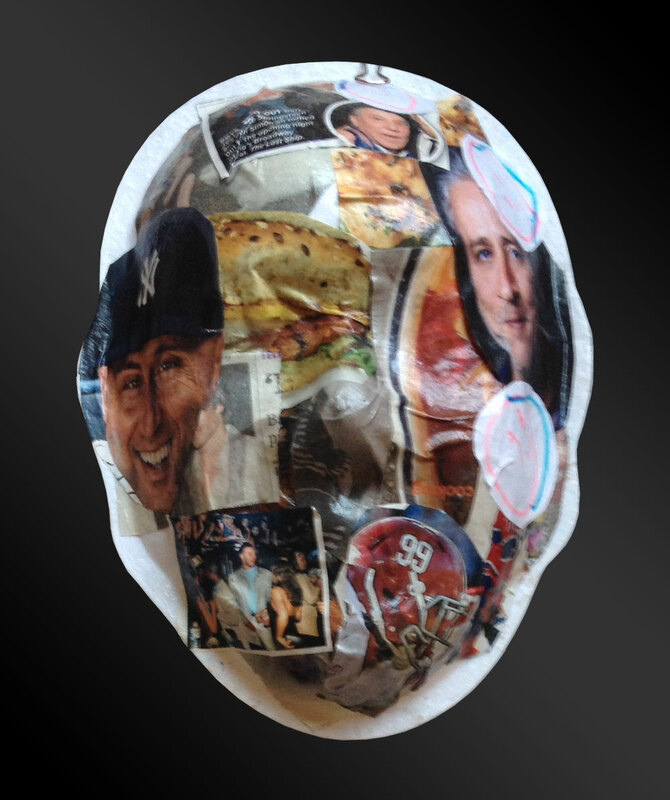 Brain Injury: I was hit in the head with a bat. Explanation of Mask: The mask explains my emotions. Purple is for my violent past, the blue is for controlling my reactions, and red is for my anger I’m trying to control and keep together. The pointed lines are for me to always be on point with whatever I do. These are all my everyday life expressions I deal with. Brain Injury: Fell down a flight of stairs when I was 32 years old. Explanation of Mask: Yellow represents the sun because I am happy, and have met so many new friends since my brain injury. Red represents the love growing around my ring of friends. 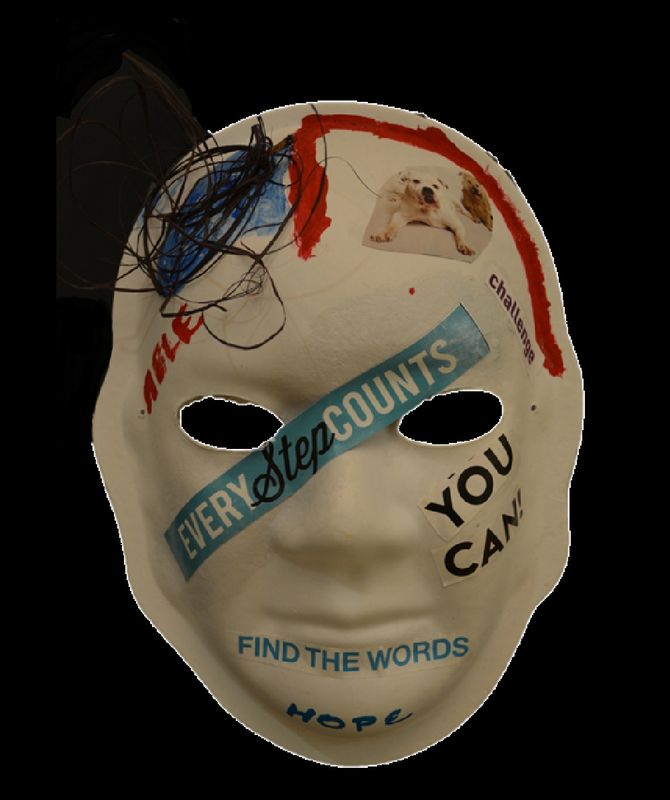 The words represent the things I went through with my brain injury. Brain Injury: Hit by truck while riding my bicycle. I was 50. Explanation of Mask: I am happy because I love surfing and the plants that are in my mom’s garden. I have wisdom and that gives me the courage for my big, big, giant love! 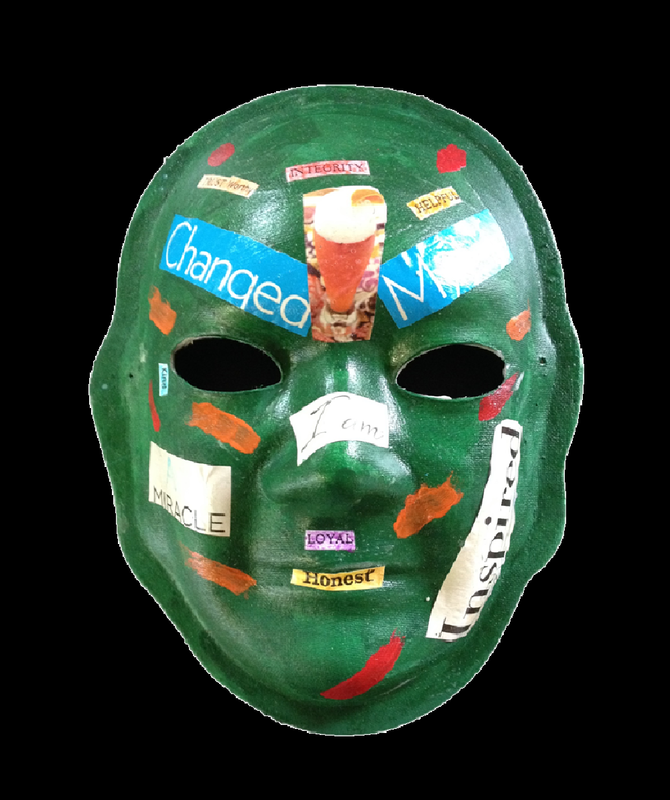 Explanation of Mask: I remember activities and things that I used to be able to do that I no longer can. I sometimes feel frustrated when I am reminded of my previous life and what I can’t do anymore. Brain Injury: Fell off a garbage truck and hit the back of my head. 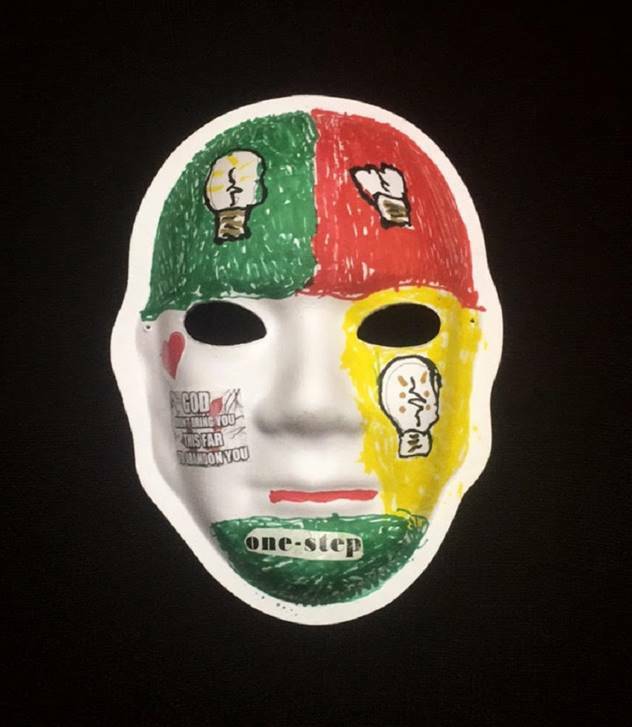 Explanation of Mask: The mask represents me after I came out of the hospital and was okay even though I still had a brain injury. My brother helped me get a divorce and brought me home to NC. I love my brother, his wife, and children very much. My whole family is fantastic! Brain Injury: Motor Vehicle Accident. I was in a coma for 3 months. Explanation of Mask: My favorite color is the background color of my mask. The Lord has blessed me. Without him, I wouldn’t have come back to life. You can overcome it with people and God. 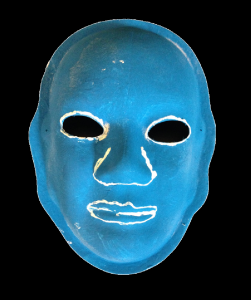 Explanation of Mask: Blue is my favorite color. The quote on my forehead represents the confusion and memory loss. Quote on cheek represents family support and love. Summer is my favorite season. Interested in guitar. “Love every minute” in the present. Brain Injury: Brain tumor then a car accident. Explanation of Mask: I play with duality (contrast between two concepts). I included the American and Colombian flags as I have the honor… or the curse of being from two countries. 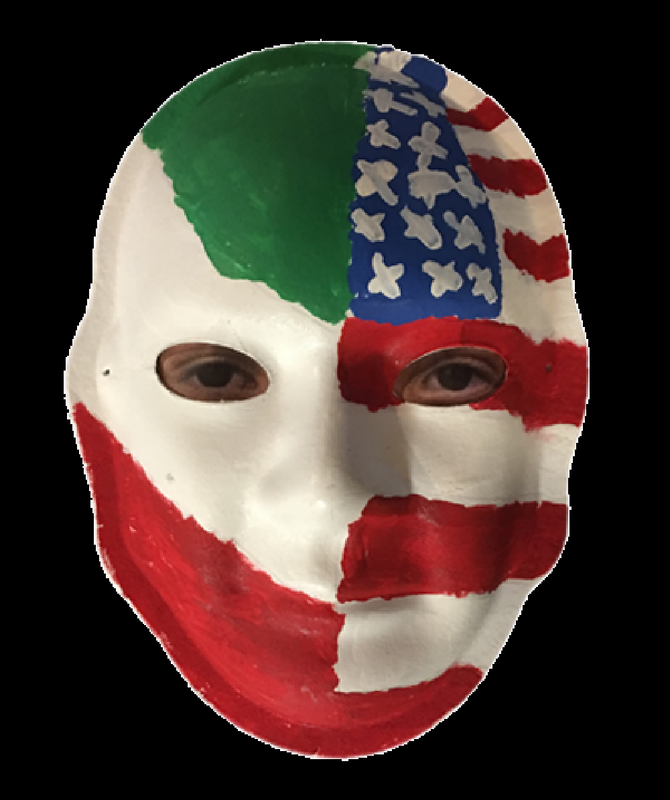 I also added images to represent both countries. Life includes many positives and negatives, like Yin and Yang. What else do you feel and see? 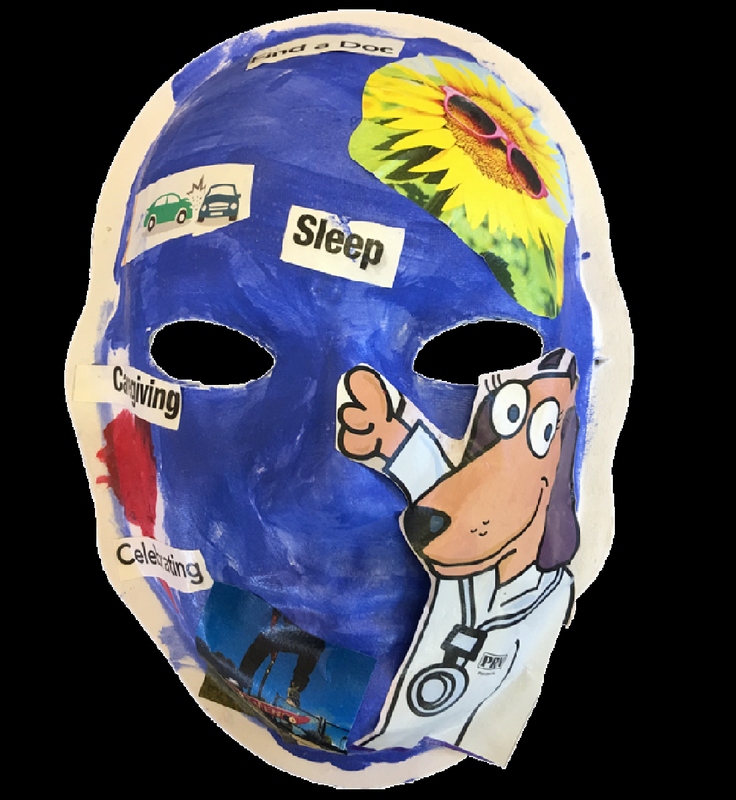 Brain Injury: Benign childhood cancer resulted in an ABI. 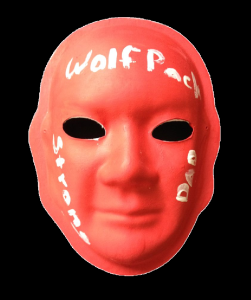 Explanation of Mask: My mask is red and black to represent that I am a fan of NC State… Wolfpack! I enjoy being outdoors and working with my hands. I never give up, and feel that I have power over my destiny. I like to set goals for myself, and it feels awesome when I reach those goals. 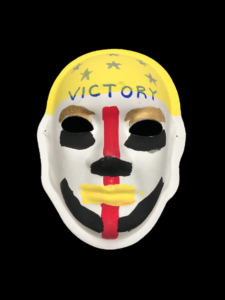 Explanation of Mask: Life is like a sport, you find out what you’re good at while growing up, then consistently hone those skills to increase efficiency with each passing year. The task(s) become more automatic and the quality is satisfactory. There’s reliability, a certainty that comes with each new day in one’s profession, all is comfortable and progressing well. The unexpected traumatic brain injury, at age 39, became an all-stop action on my profession, and some cognitive abilities. This injury put me in the position to start over again. Though not from ground zero, it required me to open-up to a much greater degree than I had experienced before. I forced myself to go deeper within my heart to identify what was of interest post injury, and still within my capacity level. 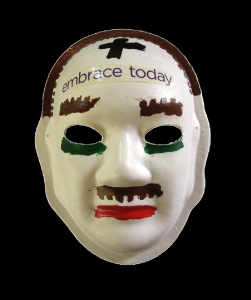 What could I do with an acceptable level of competence in our culture that I would fully embrace? Helping others as a recreation therapist was revealed at the vocational rehabilitation screening. “I can do this,” was my immediate feeling. 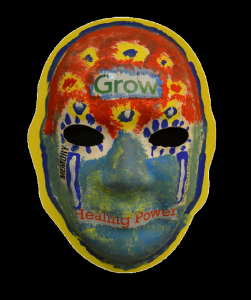 I received help from many new friends as I headed on a journey to become a certified therapeutic recreation specialist. I use recreation as a tool to help individuals discover their current ability level and maximize their participation in any recreation activity of interest. My new journey came with many small failures, requiring me to adjust, adapt, and improvise as necessary to achieve acceptable standards on my new career path. The journey was worth it. Now it is 15 years post injury, and I’m working part time at Hinds’ Feet Farm. I learned to let go of what no longer served the new me, and I accept my present level of human capacity, interests, and feelings about life’s issues. I have found a comfort zone with myself and my team of supporters. 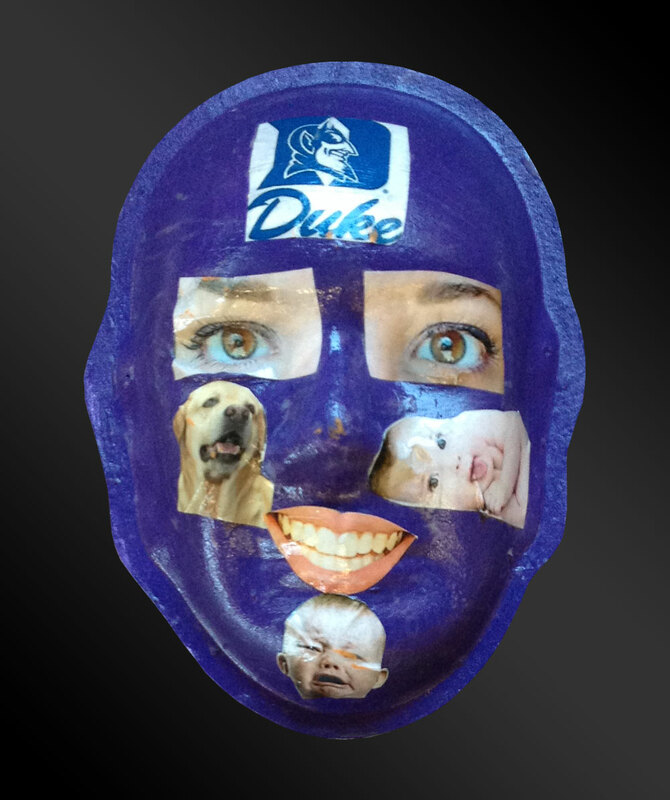 Notice my mask and the color of my face. 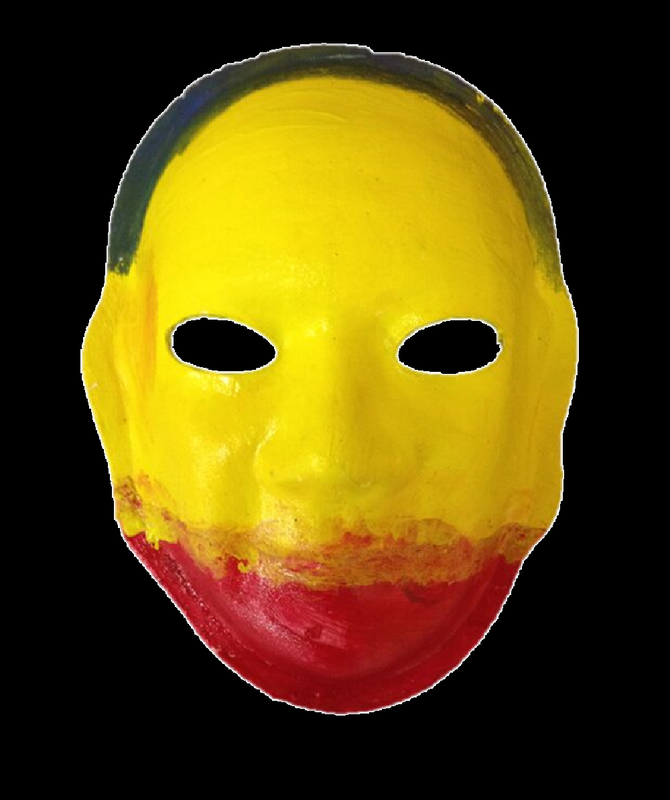 I admit, my ability to mix paints and generate the natural color of my skin tone deserves an F minus grade. I am Not green! Just because I cannot work with paint doesn’t exclude me from participation in this mask project. I believe in enlivened hope and the joy of living one day at a time with present abilities, including accepting those less-than moments. Explanation of Mask: I chose purple because it has always been my favorite color. Green and yellow were my high school colors. I love yellow sunflowers because they are bright like the sun, which brings me happiness. I try to stay positive and happy even though my activities are limited. I’m just thankful to be alive!. Brain Injury: While in the Army, I had a motor vehicle accident. It was 3/9/2000. I was 19 years old. 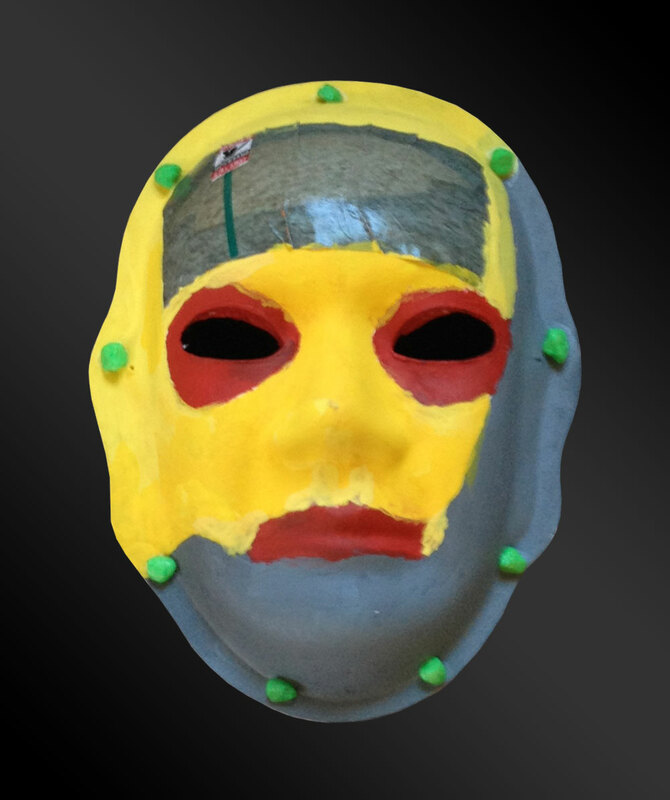 Explanation of Mask: The yellow and blue represent the abrasions that were left on my brain after the accident. The cross represents how wonderful God has been to me, helping me overcome so many roadblocks. My family is my best support. They have been there helping me the entire way. 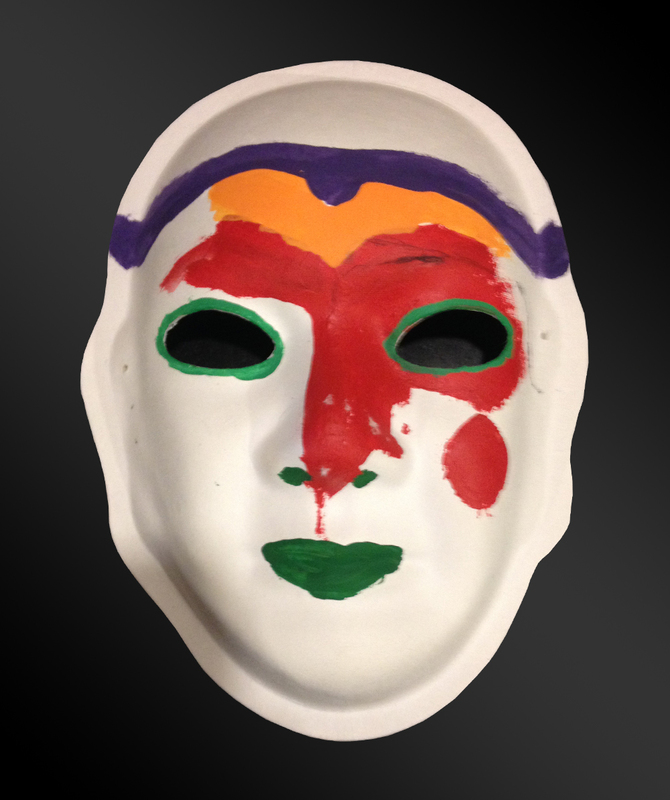 Explanation of Mask: I’ve always liked bright colors. Bright yellow represents my bright future. I want to inspire others to achieve things they never thought they’d be able to do. I don’t want a free pass! 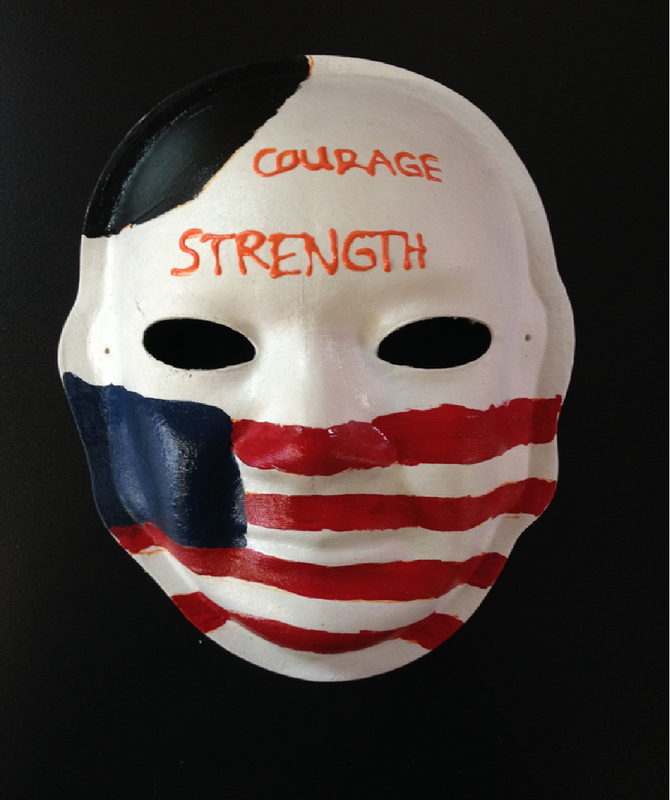 I want to be identified as normal; for the man I am; what I stand for, do, and accomplish. A disability is a gift, not a weakness, and can be turned into strength. One of my goals is to be a millionaire so I can give back to the community and give all the glory to my lord and savior, Jesus Christ. 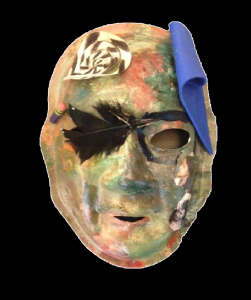 Explanation of Mask: Brain Injury gave me a better way of looking at things. I’m really smart, so I’m getting things done for me now. The simple way is just doing it but I have to think of it differently. I hate being on a time limit. Before the accident, I was on the wrong road. The accident made me a people person with patience. I want to be a motivational speaker. The blue is for patience. The red is for my determination to get a task done. Green is for my education and wisdom. The gold crown is for positivity. Purple is for my outspokenness. Brain Injury: Hit while attempting to help someone in a fight while stationed in Germany with the Army. 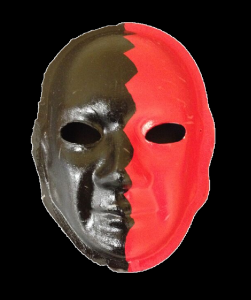 Explanation of Mask: The red represents my anger for what happened to me and the black represents hatred for the people that did this to me. I sometimes struggle to forgive. I am braver than the men who did this to me. Brain Injury:Abuse at the hands of my parents as a small child. 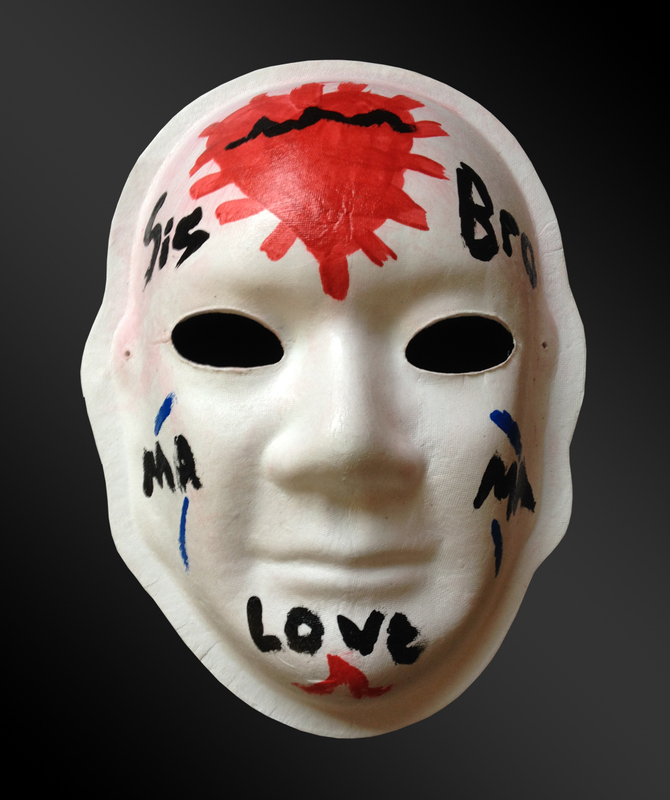 Explanation of Mask: I had a crappy childhood, but the one happy memory is eating with my neighbor, Mama Debbie. I like living at Lippard Lodge. My favorite thing to do is cook! I included my initials JDG because I really like my name. While I don’t have my family, I have great friends and housemates. 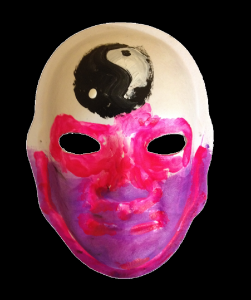 Explanation of Mask: The Ying-Yang because after my brain injury I was so confused. I knew what I was supposed to be doing, but they wouldn’t let me do it. I understand now, but I was totally confused. The pink and purple are for the now. They represent happiness. I understand my brain injury and I’m living with it. Brain Injury: Shot in the head at the gun range one day before I was to marry my husband. Explanation of Mask: The black is where my injury occurred. It is no big deal because things always get better. I always look for things to do, like gardening and book club. My husband, two children and family are important to me. I have worked on a landscaping committee for 10 years. Explanation of Mask: I was a Presbyterian pastor at a church and for many years after my TBI, I thought I would return to doing this again. I volunteered as a chaplin at a retirement facility until realizing I had too many cognitive limitations to serve as a pastor again. In the Bible, the rainbow was a sign given to Noah, that God would not cause a flood again. For me, the rainbow is a sign of hope. The moon shines in the darkness and reminds me how the Holy Spirit is present in the bleakness of brain injury. Brain Injury: I was playing chicken with my best friend while driving ATVs. We collided. My best friend did not survive. 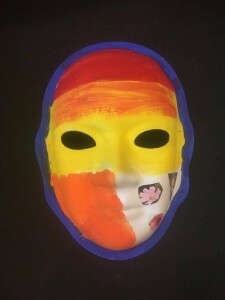 Explanation of Mask: I’m just relaxing, enjoying the weather, taking my time, mixing these colors. Brain Injury: Lighting equipment fell, while I was working on stage. I literally had no idea what hit me, just that my nose was crunching in my head as I collapsed. They said it was just a broken nose….then within days things changed. 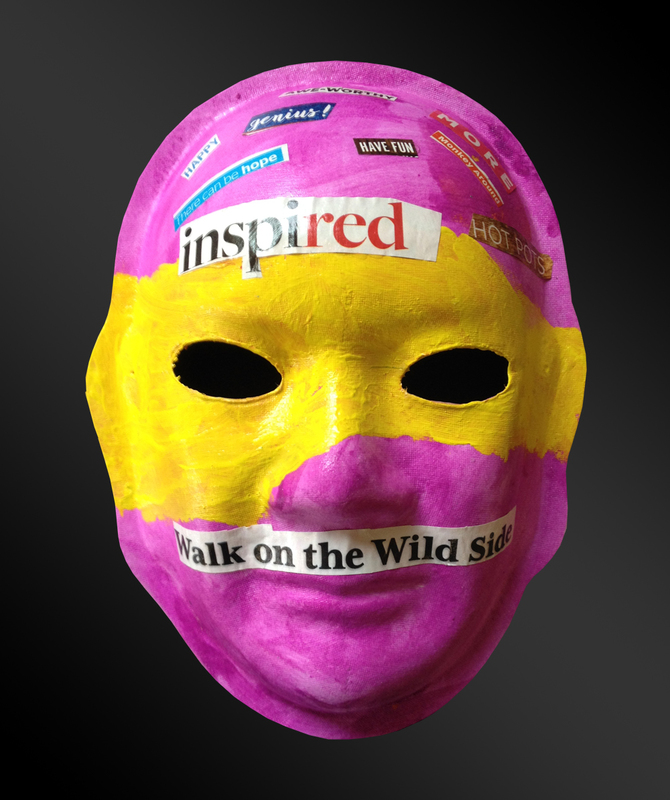 Explanation of Mask: I wanted to show how different what people see on the outside is from my insideworld. I kept getting told by folks, “well you look good!” as if that is the most important thing. I was foggy headed, dizzy most of the time, constant headaches for 3 years. My vocabulary went from 3 syllables to 4 letter words. No doctors seemed to see or hear me. They said, “There is so much we don’t know about the brain, but no, that can’t be the cause.” Why don’t they want to learn from us? We are going through this, and can inform from the inside of TBI. It has been 5 years now, and I continue to heal and grow; mostly by not giving up or believing, “it is as good as it gets.” We can heal together faster!!!!! Explanation of Mask: The red side of my mask represents when I did not feel whole initially following my accident. Things came back in pieces. 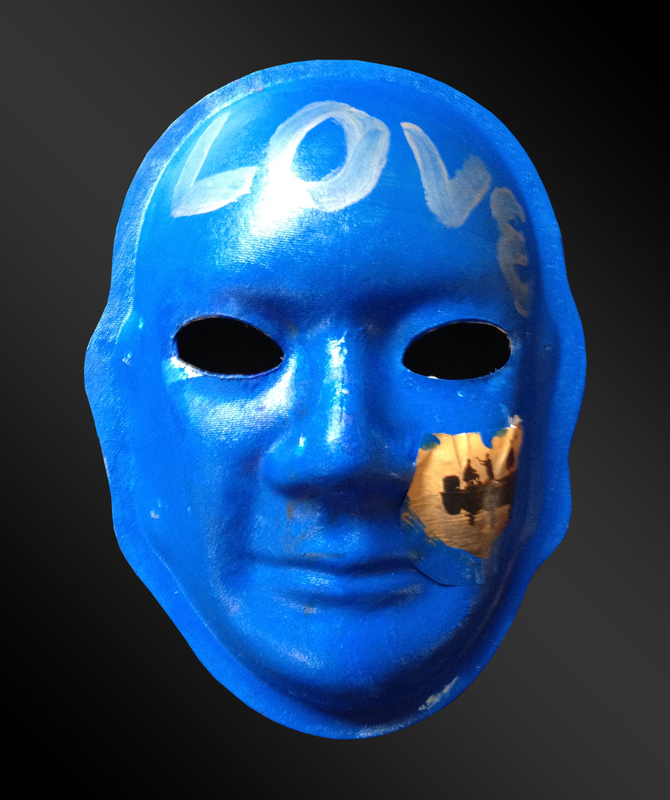 The other side of the mask is blue and shows how I feel now. I am more complete because my memories have come back. 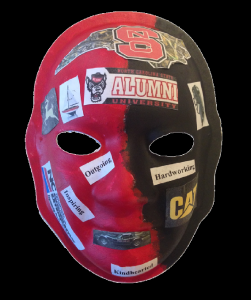 Explanation of Mask: I was at the top of my class, and when I would have graduated I was going to enroll into West Point Military Academy. Brain Injury: Drank beer then rode my moped, hit the curb, flipped and hit my head on the pavement. 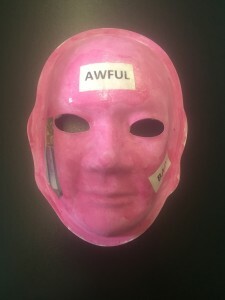 Explanation of Mask: I feel angry and ashamed. I am sad about lost relationships and cry a lot. Since the accident, I realize that decisions have consequences. I try not to make the same mistakes. I am the very proud dad of a 7 year old son. 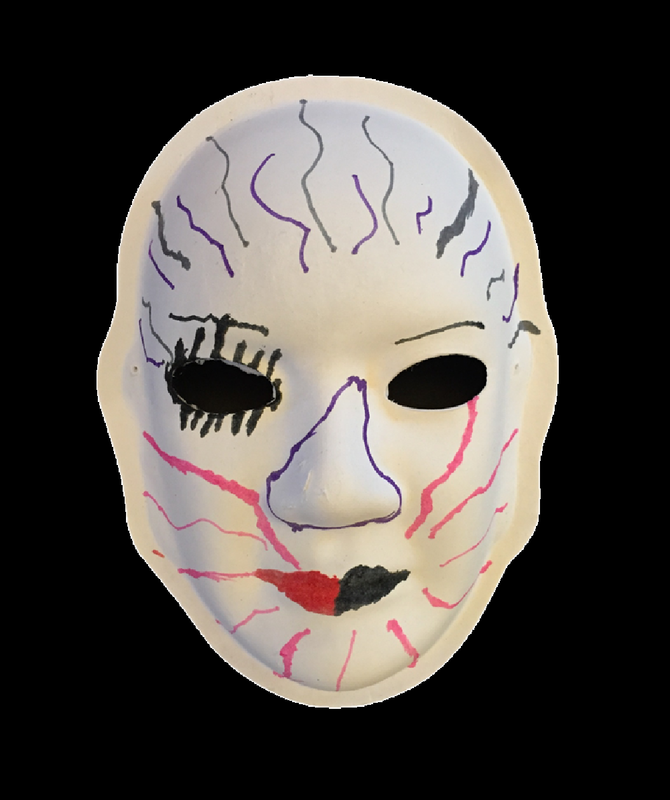 Explanation of Mask: She feels angry and disoriented because she doesn’t get to do half of the things she wants to do since her injury. Sometimes she feels grouchy. But she thanks God to be blessed to be alive and to meet new people and make friends. Red represents the hurt and disappointment. The black is for the dark side of me. She feels loved by her family. Brain Injury: Anoxia at 16 months old. 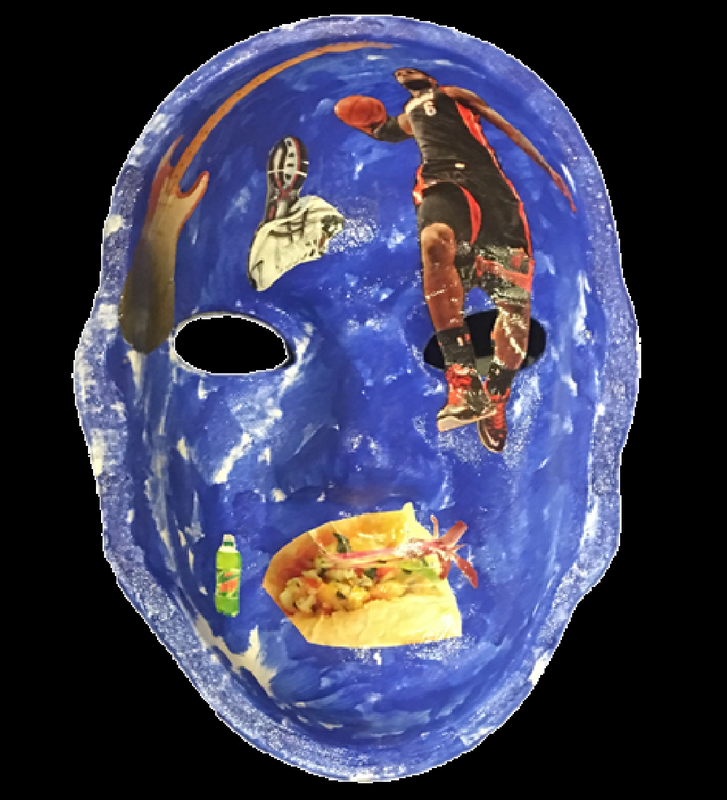 Explanation of Mask: My mask represents my love of sports. I value my family and friends. I feel I have accomplished some incredible things in my life despite having a brain injury. I love to smile and make other people happy. The doctors say I’m a miracle. Brain Injury: Passenger in Motor Vehicle Accident when I was 18. 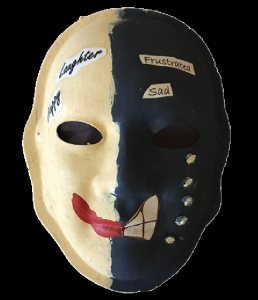 Explanation of Mask: The black side is the part of my brain that is damaged. My brain is gone. I feel lonely, angry, confused. The tears on my cheeks are for my loss of myself. My emotions are deeper now. I feel love and happiness around others that understand me. Explanation of Mask: I’m a prayer warrior praying for the healing of others. I love to sing about Jesus, and I am proud I am a Christian. 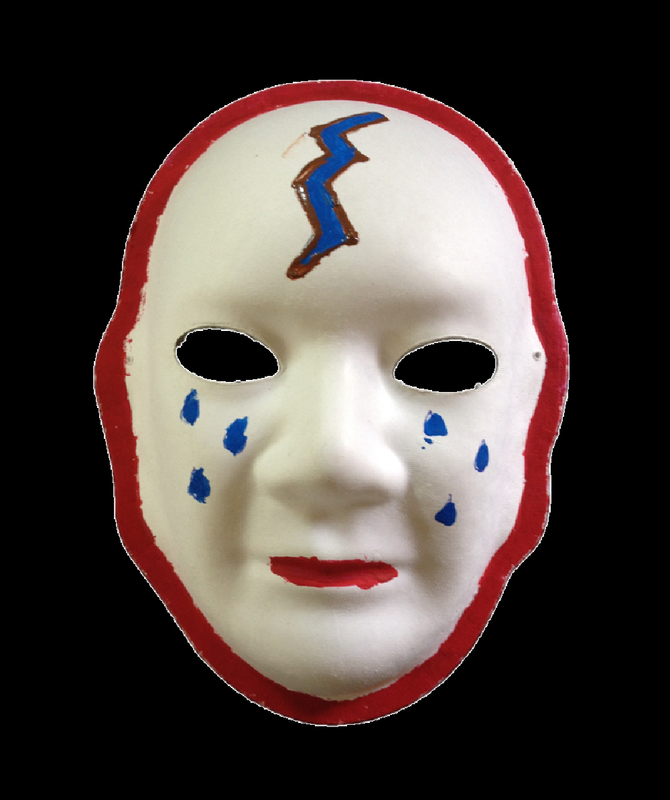 Brain Injury: When I was 24, I had a single vehicle accident after hydroplaning on a rainy day. 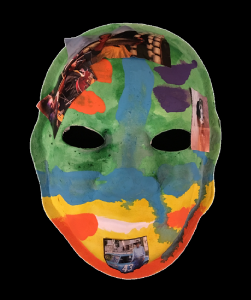 Explanation of Mask: Brain injury has such a lack of understanding. It frustrates me! I am cheerful and try to be courageous, but at the same time I am embarrassed. 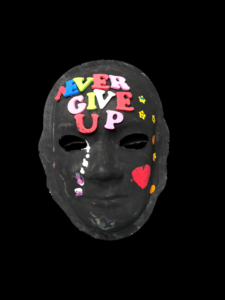 This mask shows my sadness, but it also shows determination. I still have a “normal” face, but I also am covered up by my injury. Brain Injury: Damage to my right temporal and left frontal lobes from a bicycle/train collision in 1985. 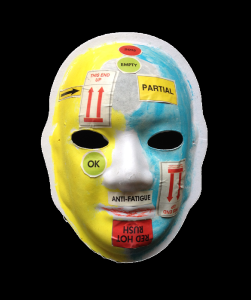 Explanation of Mask: Like most TBI survivors, I feel like my life was divided into two parts by my accident. Prior to that, I was on my way, nineteen years old, accepted to art school, in a serious relationship, and on my way to a new job. 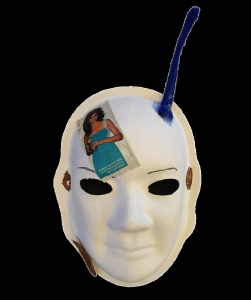 The next thing I knew, I was practically paralyzed, with tubes in all my orifices, unable to talk or think. Thirty years later, I have a new life, but one with immense challenges due to problems with learning new things, a tremor in my right arm/hand, and weakness on my right side. 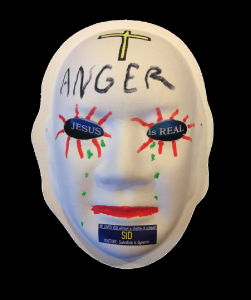 I have a hard time controlling my anger. I take medication for seizures, recurring blood clots, and for depression. I am single, when all I wanted was a family of my own. I suffer from insomnia and have lost my self-confidence. I am glad to be alive. There are many, many good things about my life, but it is not the life I expected to be living. 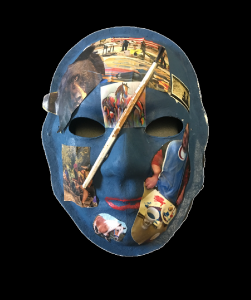 Explanation of Mask: Having had a traumatic brain injury at a young age, I never knew that there was a reason for some of my challenges. Then getting another TBI, as an adult, I thought I had nothing to grieve. After all, I wasn’t dealing with the severe effects that challenged others I knew who had a TBI. Sometimes I sense I’m in a whirlwind spiral when I lose my balance or when I’m overloaded with too many thoughts. 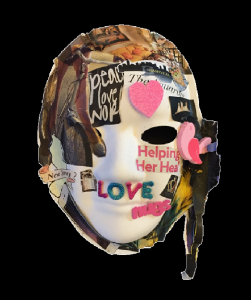 It takes conscious effort to peel away layers and open both eyes to the reality of my TBI. And yes, I’ve had a life of springtime growth and mindful engagement with all that is inside and around me. The support of friends and others guides and sustains me on this life journey. 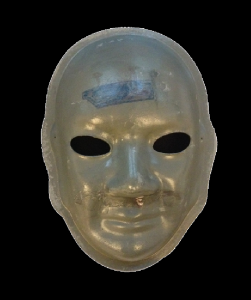 Explanation of Mask: You may have an injury, but you will say things your wouldn’t normally say to people so beware! 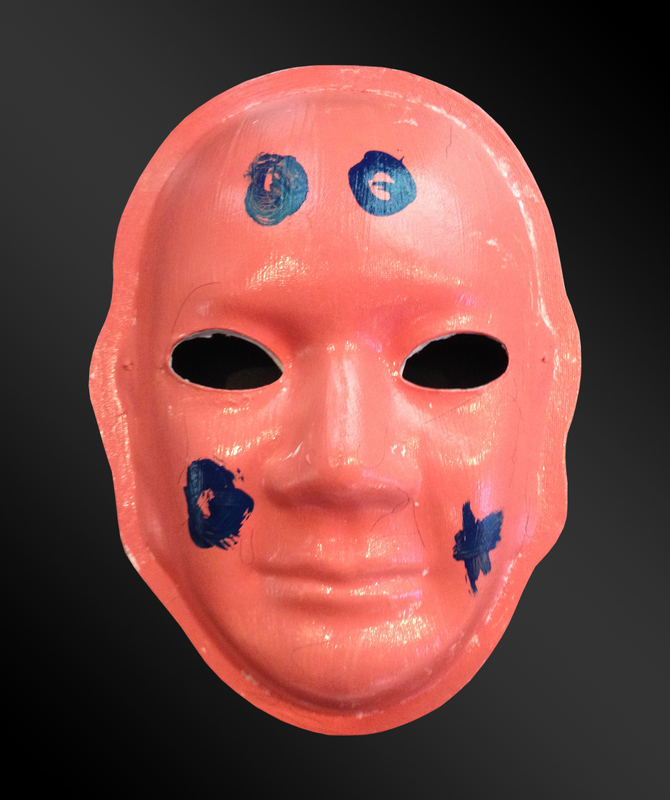 Explanation of Mask: I contracted herpes simplex virus in Minsk, Belarus. It went to my brain, causing hemorrhaging to occur and damage to the front left part of my brain. 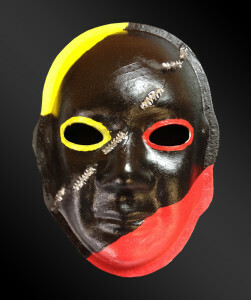 The black part of the mask signifies the damaged side, with one or many large tears. Today I exist using only my right side. My happy face signifies my positive, hopeful attitude. Explanation of Mask: My mask has many colors painted on it like a rainbow. 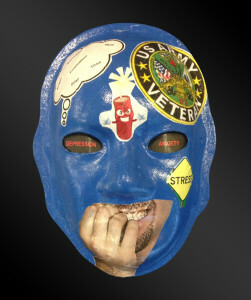 I am a very unique individual and have various sides to me. I react to situations differently and am not afraid to speak my mind. I am from Texas and have learned that if you have the stuff then “bring it on baby!” You will never find anyone like me, so don’t try. 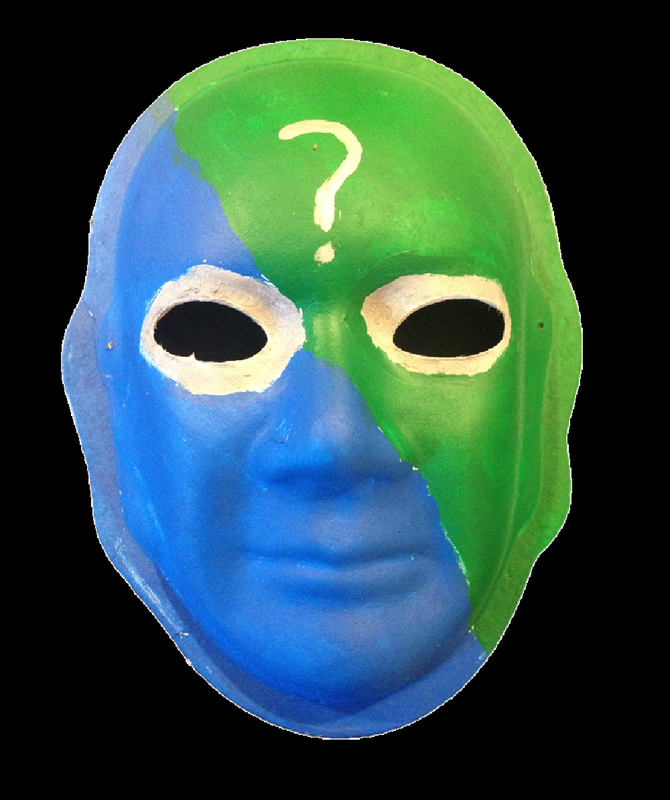 Explanation of Mask: So many faces in the world, that sometimes it’s hard to find your identity. A thousand faces, but they all look the same. All smiling and looking at me, like what is he going to do next? Its attention I don’t need or want. It’s hard living with a brain injury; feeling angry, sad, embarrassed, and lonely. What’s next for me? Explanation of Mask: My accident was in 2012. I’ve been working hard in rehab ever since. I would like to get back to fishing and catching big bass. I like NASCAR. My favorite driver used to be Dale Earnhardt, but now it is Austin Dillon. I am a hard worker and will NEVER give up!!!! Explanation of Mask: I’m glad to be a citizen of America and trusted the decisions that all my doctors made at the time of my injury. I was happy to be able to walk again, so blessed by my creator to still be alive and loved by my family. I am excited for the TBI program at CMC, and am grateful for the help I’ve received. Thanks be to God! Brain Injury: Hit by a stray bullet in the head in 1969. 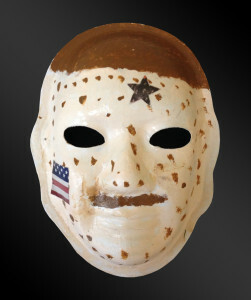 Then a head injury from a baseball bat in 1989. 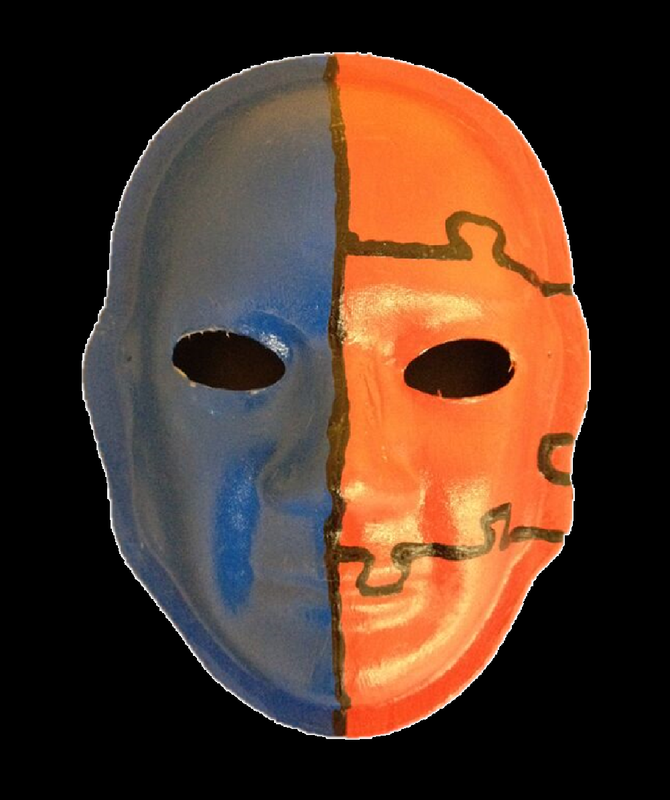 Explanation of Mask: The iron part blocks me from thinking the right way and controlling my abilities. 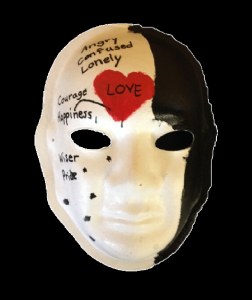 Explanation of Mask: The heart depicts my lost marriage due to my wife unwilling or unable to handle the changes in my life. The blue tears are for the sorrow that I felt for losing my job, income, way of life, and use of my left arm and leg. 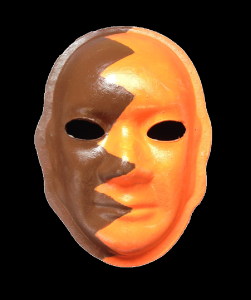 The brown represents the ongoing hard work that I put in during rehab-sometimes one has to get dirty. 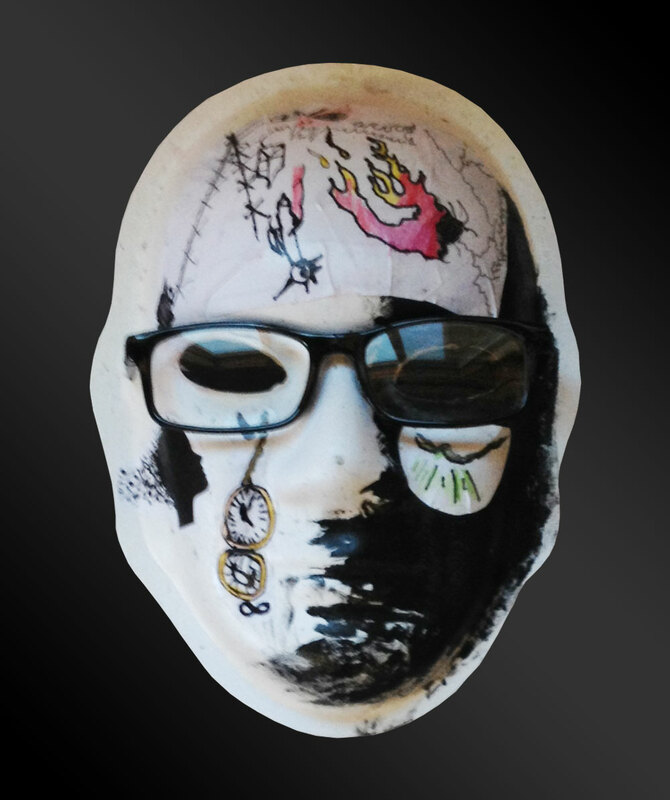 The mask over the eyes is for the blindness in my right eye and limited vision in my left. 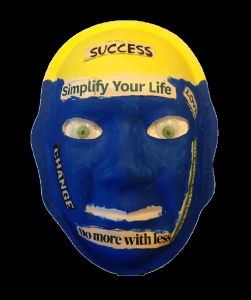 The words around the perimeter are topics that I struggle with on a daily basis including fear, doubt, career, money, rejection, anger, pain, loneliness and acceptance. The smile is for the fact that I am a survivor when no one thought I would survive, let alone recover. The cross is strength from the Lord to persevere in the face of adversity and overwhelming challenges. Explanation of Mask: Well, I wish I wouldn’t have done what I did. I wish I could go back and be normal and not have a brain injury. At least I have a second chance to start over. 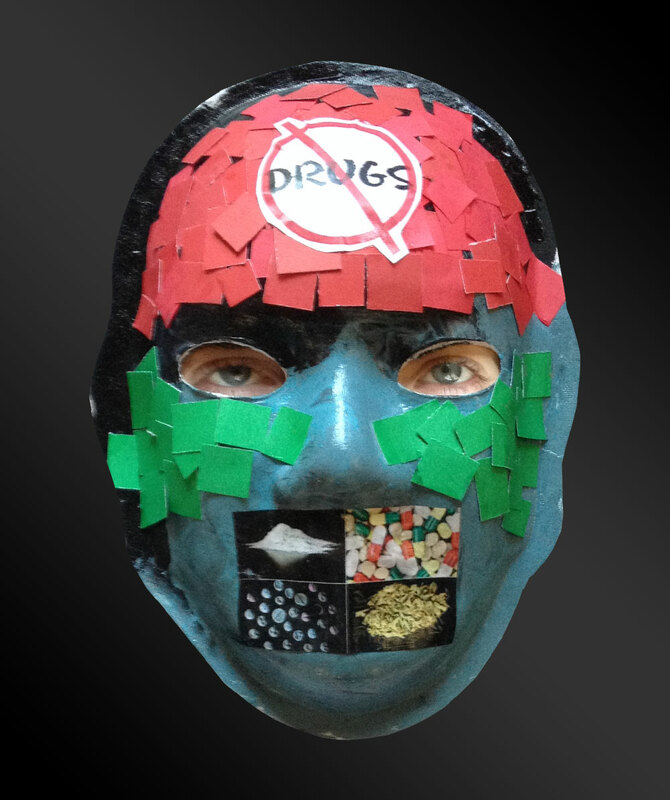 Drug use is very bad and does terrible things to people, like change their personality. 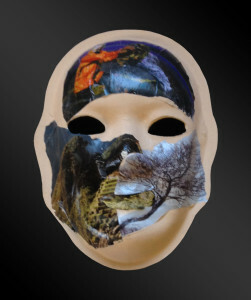 Explanation of Mask: On my mask are examples of my artwork, in the form of a collage. There are medical scans of my brain which I have colored with ink and blue watercolor. 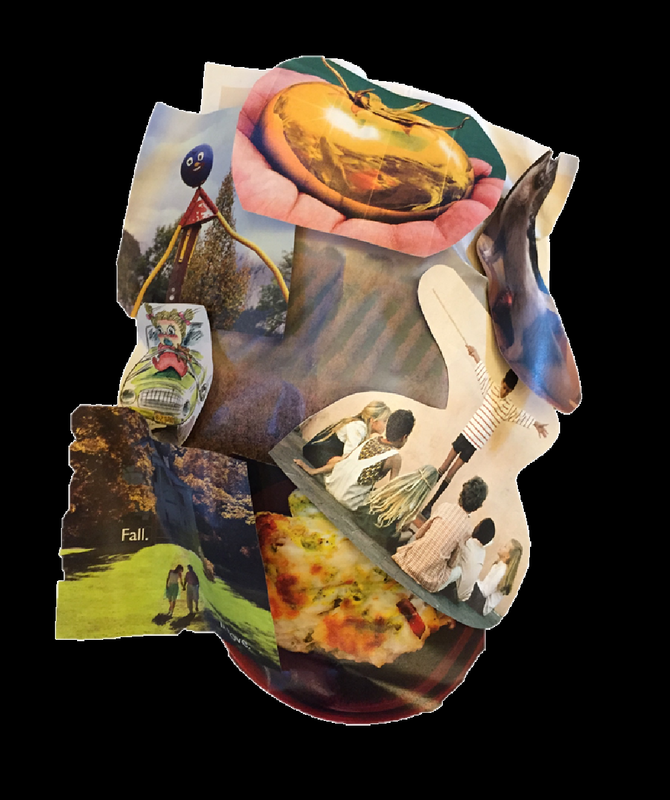 Collage is a media that I feel best expresses my experiences; like my thought patterns and my memory, the collage is composed of images, words, and objects that do not illustrate a linear narrative, but rather relate piece by piece, in a chain of associations. 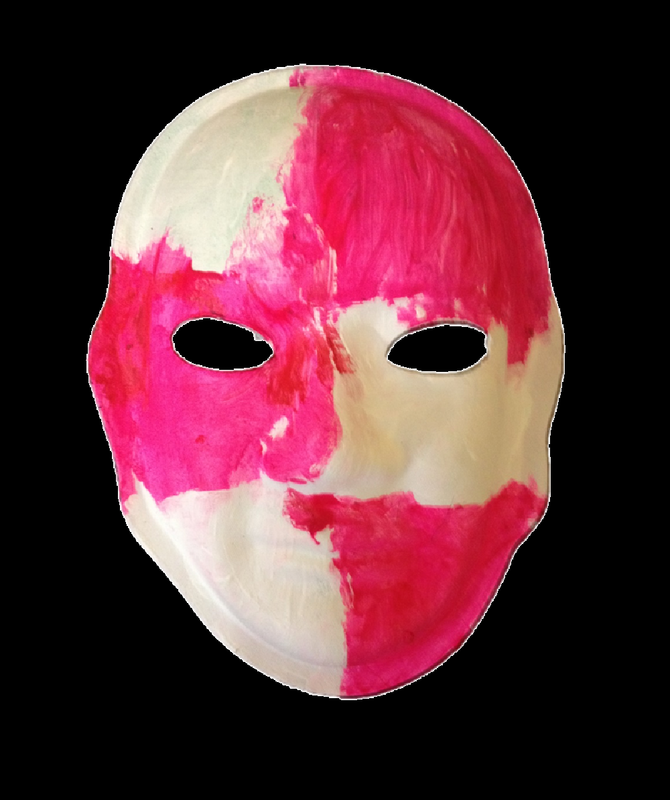 Explanation of Mask: Militant group that Robinhood attacks groups to help less fortunate from movie. 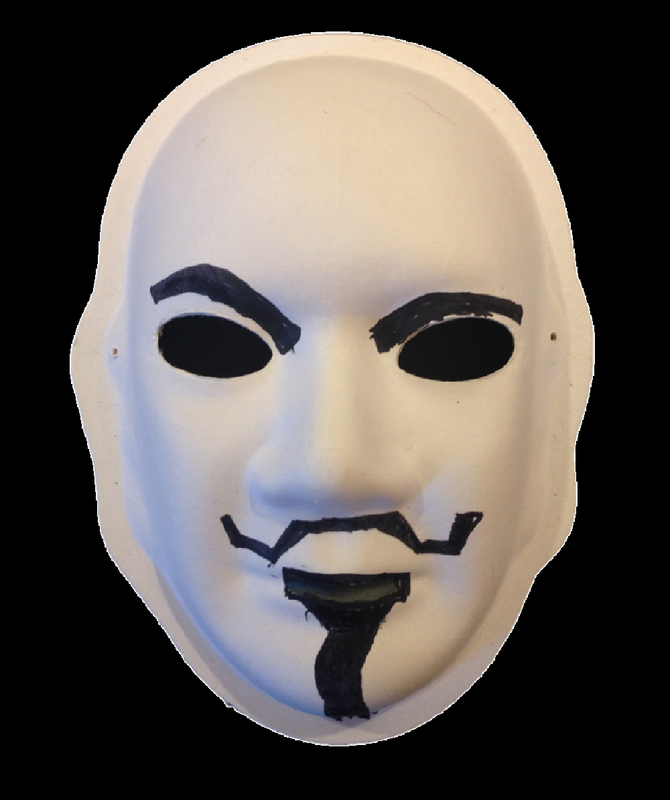 “V” for Vendetta. 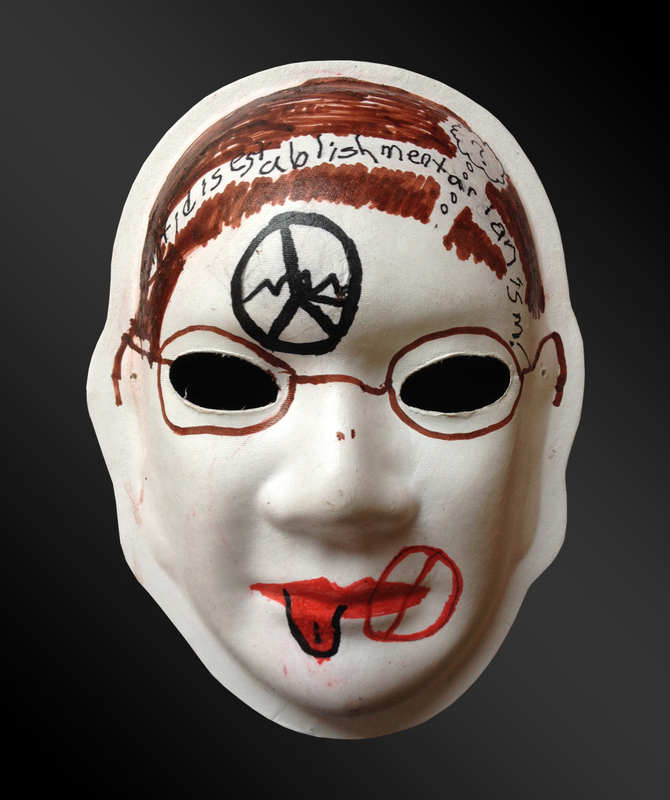 The militants called themselves “Anonymous”. 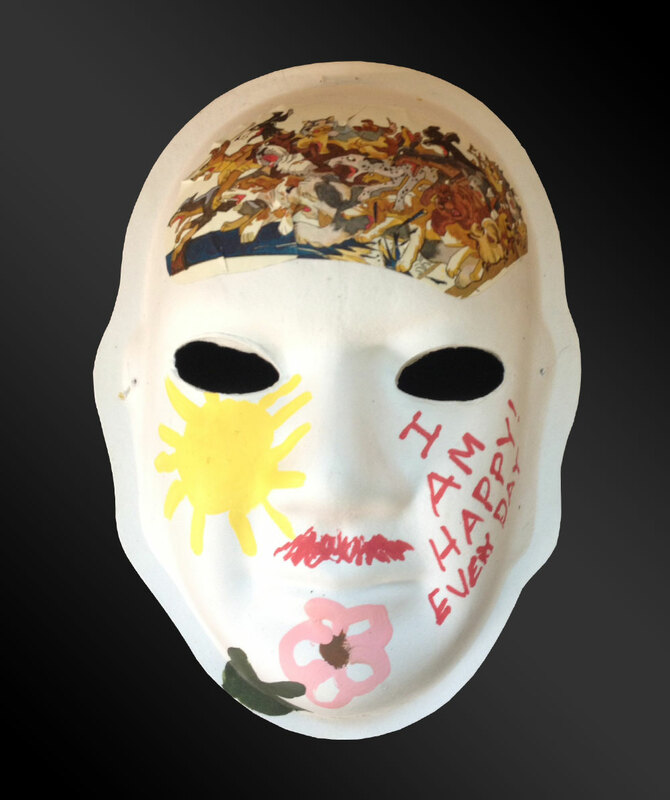 Explanation of Mask: My mask represents my happiness. 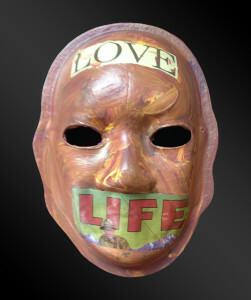 I am happy and thankful for being alive, for the ability to paint this mask and have a second opportunity for life. I am happy because people around me treat me with respect. The tears represent my fall. 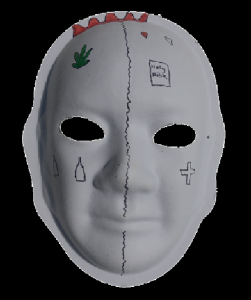 Explanation of Mask: Losing my memory of my own life keft me feeling like a “nowhere man”, without a narrative of who I was. I rebuilt my life and my understanding of it through the last three years. 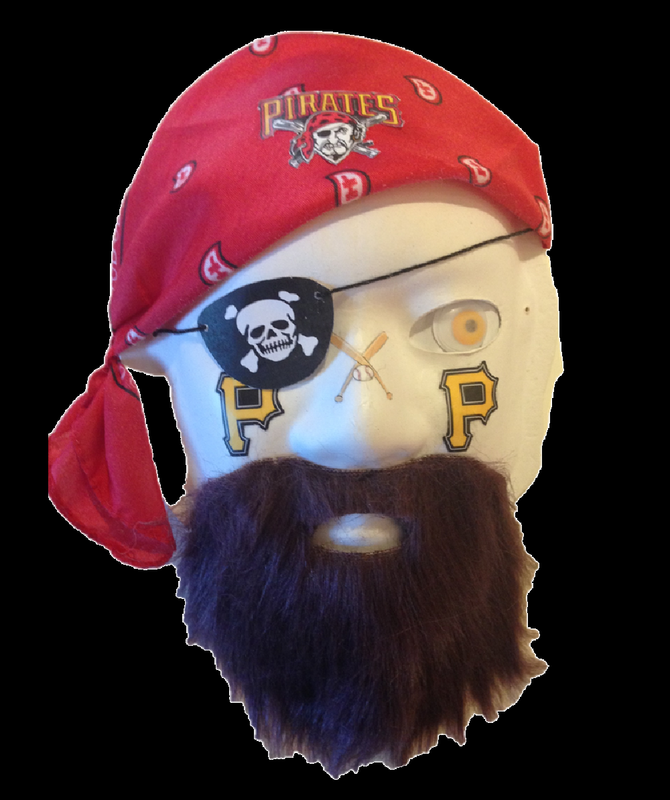 Explanation of Mask: The Pittsburg Pirates are my favorite pastime. I go to spring training, watch on TV, and go to Pittsburg for live games sometimes. They are exciting and fun to watch, and I get to brag when they are winning, especially to the Yankee fans at my gym. 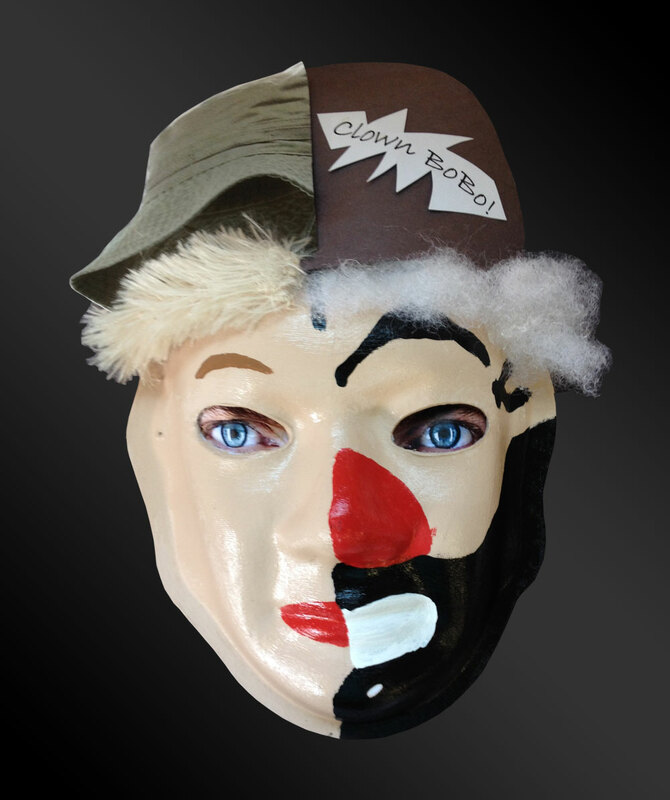 Explanation of Mask: Split in half with two parts. Me….and brain injured me. 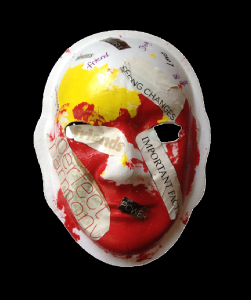 Thoughts of who I could have been if brain injury hadn’t taken over. 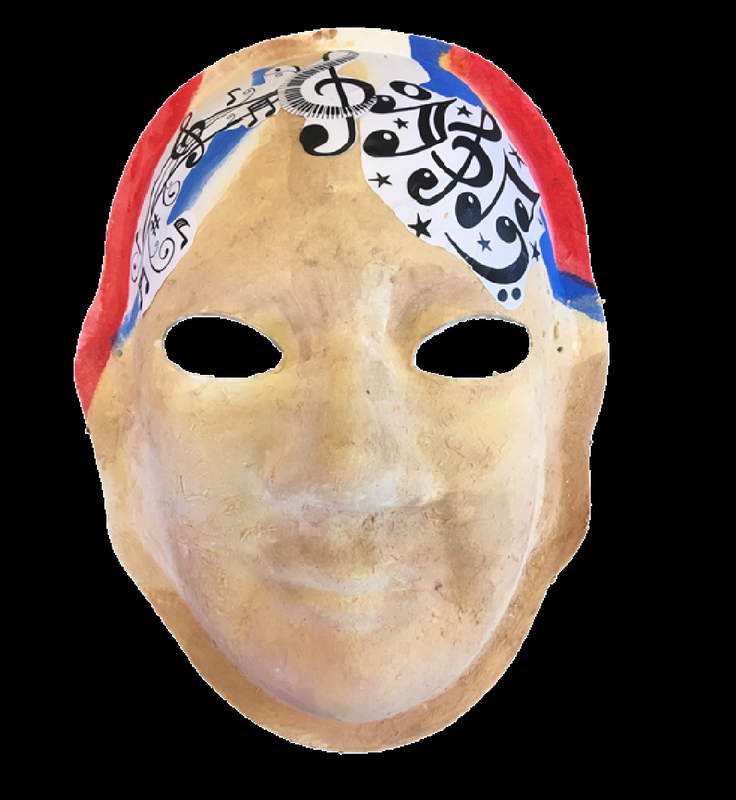 Explanation of Mask: My mask represents the loss of music and dreams. I had a full vocal scholarship to ECU. After the accident I was left with a speech impediment, making it difficult to fulfill my dreams. 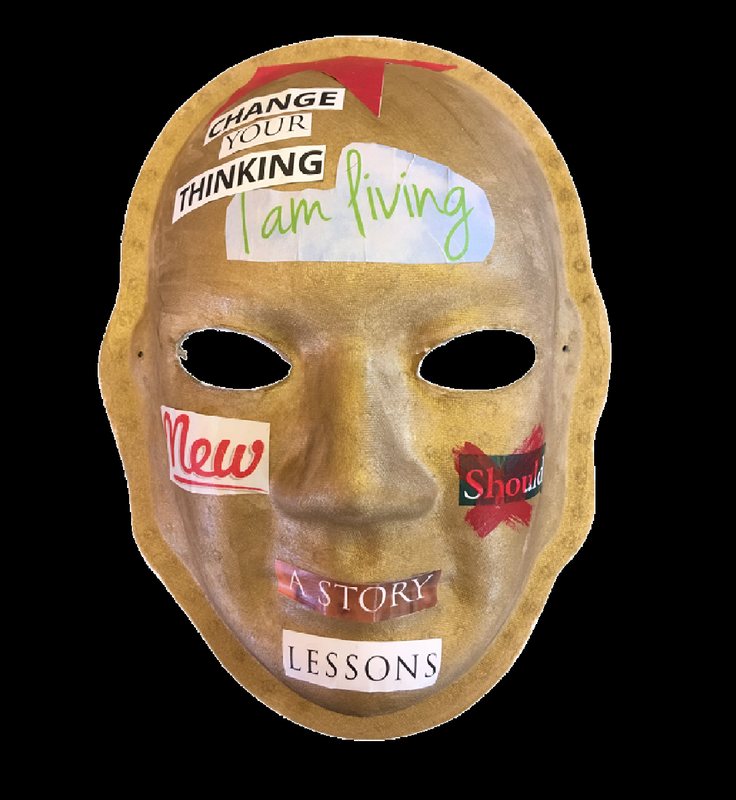 Explanation of Mask: I learned how to speak, walk, balance, and think all over again. Explanation of Mask:My mask is titled “Bird Brain”. I want to trade my brain in for a new one PLEASE! “Is there no way out of the mind?” “I know pretty much what I like and dislike; but please don’t ask me who I am.” These are quotes by Sylvia Plath that I identify with very much. My favorite book of Sylvia’s is “Bell Jar”. 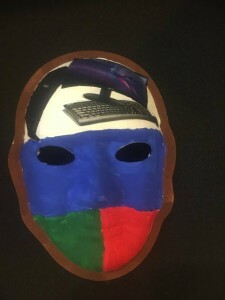 Explanation of Mask:I hope the mask speaks for itself. Jesus Christ is my lord and savior. I graduated from Penn State and I am a big fan of Joe Paterno! I have been weight lifting since 7th grade. I had an awesome dog named “Boomer” who I lost after living 2 1/4 years longer than the vet said he should’ve. Blessed be the name of the Lord, “you give and take away, you give and take away.” Thank you, Lord Jesus, Amen! Explanation of Mask: The color green represents healing. The color blue is for hope. The question mark is for what meds to take??? Brain Injury: Car accident. I was driving with two little girls in the backseat, but they sustained no injuries. 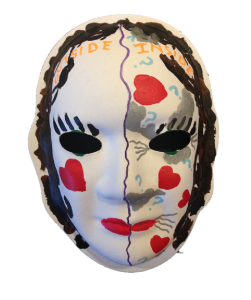 Explanation of Mask: How I feel on the inside is one side, and how I look on the outside is on the other side. I look “normal” pre-accident on the outside. On the inside, I’m living through a fog (grey color) with lots of questions about how I did things before my accident. The wrinkles represent feeling very eager to be my pre-accident self. I feel loved beyond belief! Explanation of Mask: I feel “forgetful”! I am thankful for family and friends. I am frustrated with my memory, and challenged every day. Blue is my favorite color. Yellow eye represents my “third eye” helping me to get to places I often have trouble finding. The 4-leaf clover represents that I am lucky to be alive. Explanation of Mask: Mad because I’m alive and here on earth. I wish I were back in heaven with God. 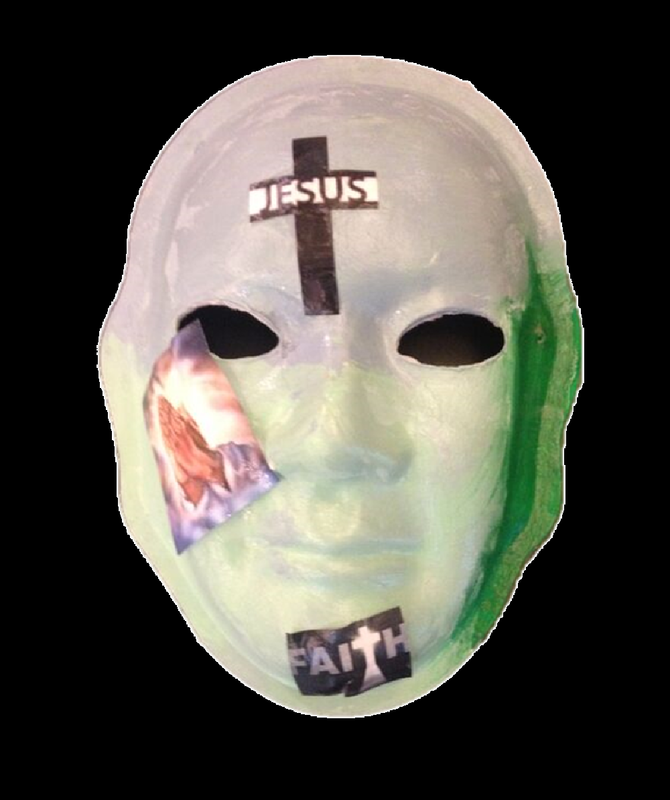 My story is on YouTube: Salvation is Dynamic. I know without a shadow of a doubt that Jesus loves you. I met him and came back to spread his word. 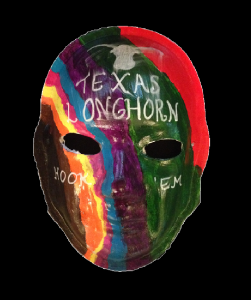 Explanation of Mask: I am always spaced out, yet I still earned my Bachelor’s degree from the University of Texas at El Paso. Their mascot is a miner. I included a picture on my mask to represent the miners search for gold, just like I am in search for my place in the world. Brain Injury: Brain tumor found between my brain and skull. 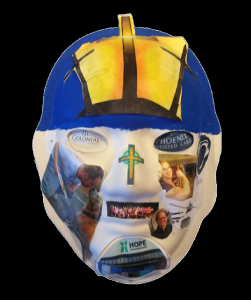 Intense radiation treatments from childhood cancer caused this tumor to develop. 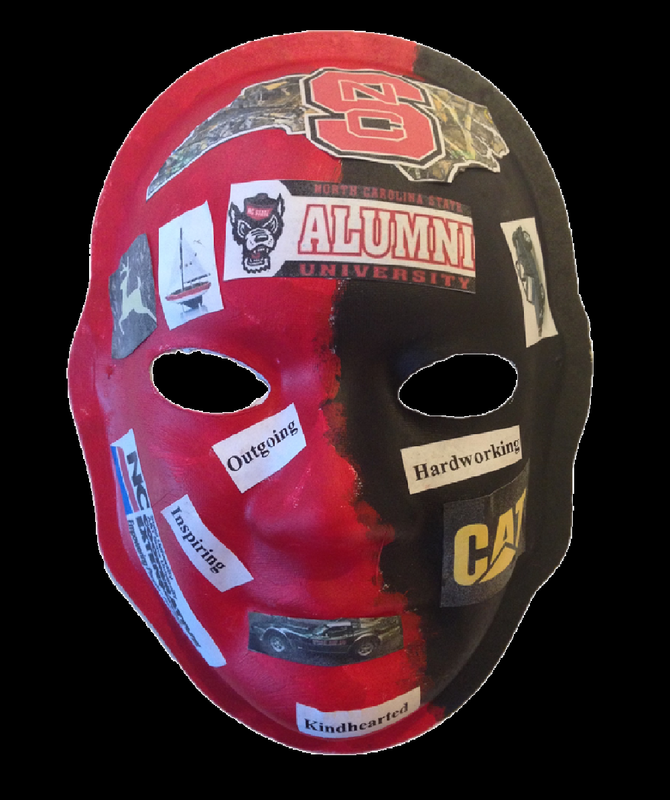 Explanation of Mask: I used the colors red and black because I attended NC State University and graduated with an agricultural degree. I have a passion for volunteering for the NC Cooperative Extension. People describe me as outgoing, inspiring, hardworking, and kindhearted. My hobbies are working on classic cars, jeeps, and sailboats, as well as collecting tractors. 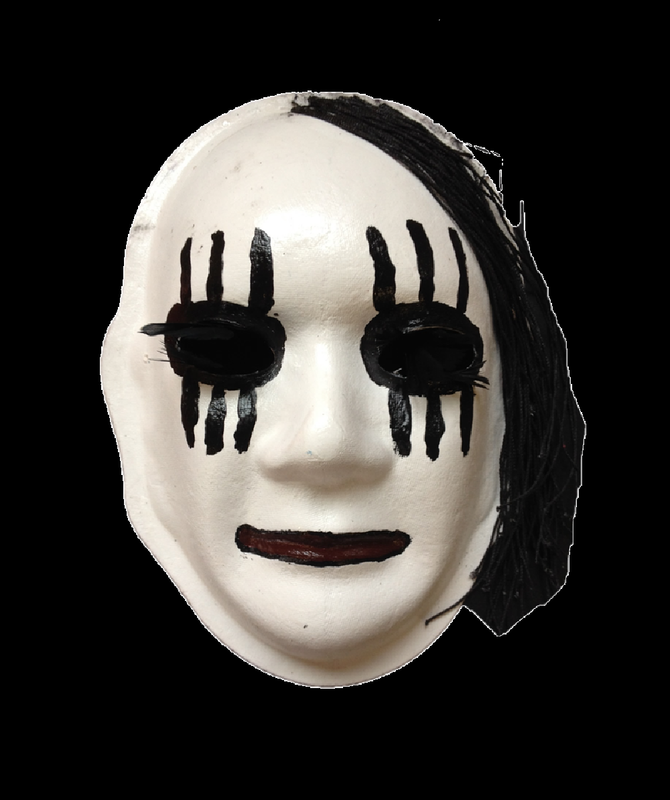 Explanation of Mask: I have a hard time seeing out of my left eye, don’t walk like I used to, and have a hard time writing. I like to hunt so I’m glad that my brain injury didn’t affect my “shooting eye”. 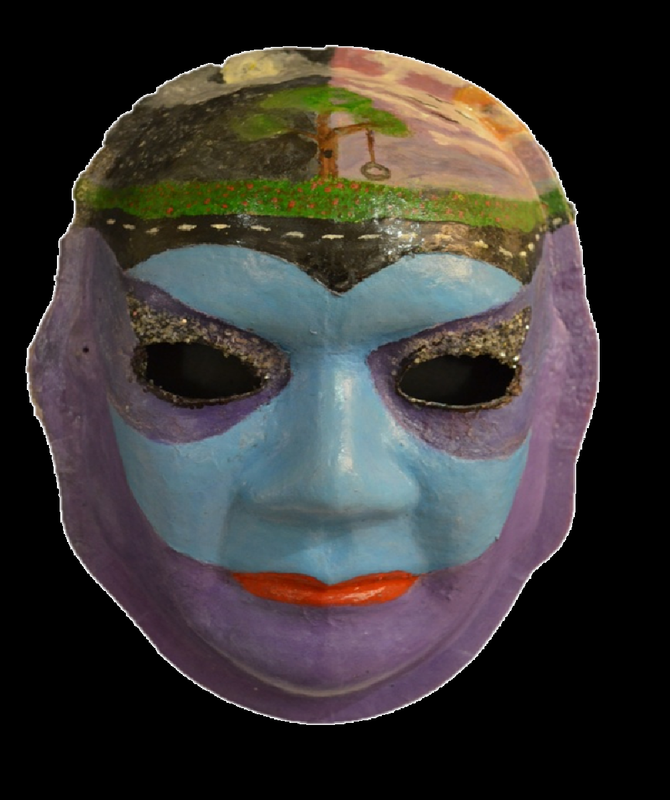 Explanation of Mask: I put a horse on my mask because I used to ride horses when I was a little girl. I still like horses. I chose the color yellow because I have blonde hair, and typed out words that describe my personality. 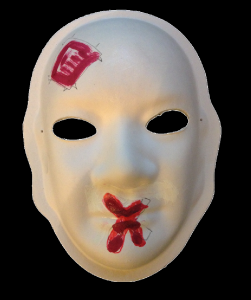 Explanation of Mask: I put tape over my moth to indicate my lack of voice. 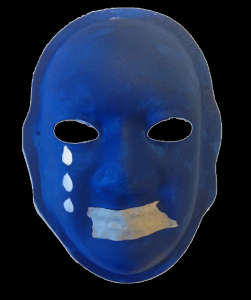 The color blue and the tears represent my feelings. 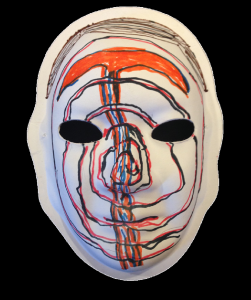 Explanation of Mask: At first, my brain was empty of any thoughts as I was in a coma. Then I awakened and had partial thoughts. 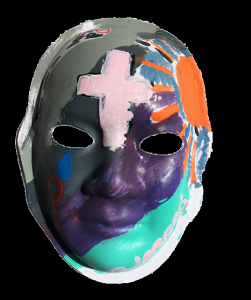 I put the muddied grey spot in the middle as I still sometimes get muddled in my thoughts, but most the time I am okay. Fatigue is an issue with me so I put the anti-fatigue sign. I used to do everything quickly, but now I cannot rush either physically or mentally, so I put the Red Hot Rush sign upside down. Somehow my brain transposes my thoughts and the exact opposite comes out of my mouth. 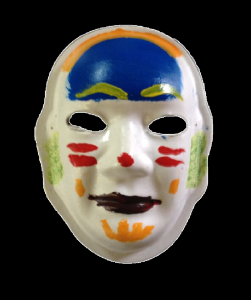 Overall I am happy so I painted the face with happy colors (yellow and sky blue). I used to just move from point A to point B and get things done, and not noticing anything in-between, but now I do. Life and nature are beautiful! 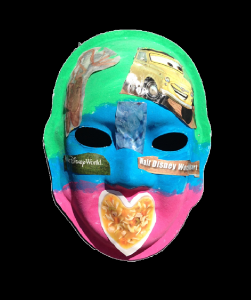 Brain Injury: I was a passenger in a car wreck. 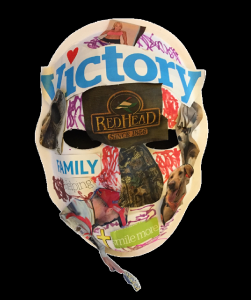 Explanation of Mask: My mask includes hunting, because I never thought I’d be able to hunt again and its good therapy. I want to get married. Both my family and Dale Jr. have gotten me through a lot. I’m loyal to the Lord. Brain Injury: Two weeks after giving birth to my twins, I had a massive stroke related to my pregnancy. 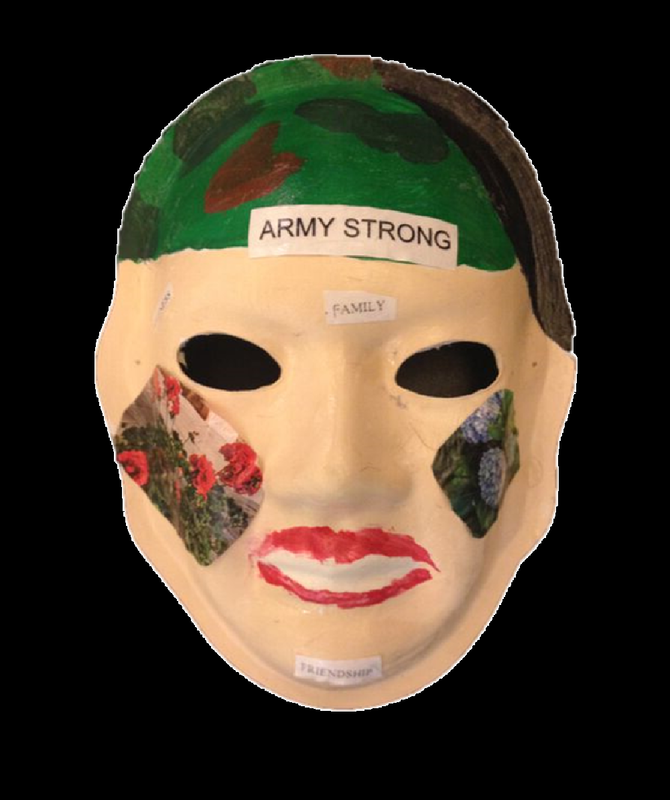 Explanation of Mask: I lay helpless on my bedroom floor, and I remember hearing my boys crying and my husband calling my name. I tried to talk, but couldn’t get the words out. I was told months after, that I had a stroke and two blood clots on the right side of my brain. I couldn’t talk, walk, feed myself, or see out of my left eye. My doctors called me a miracle. 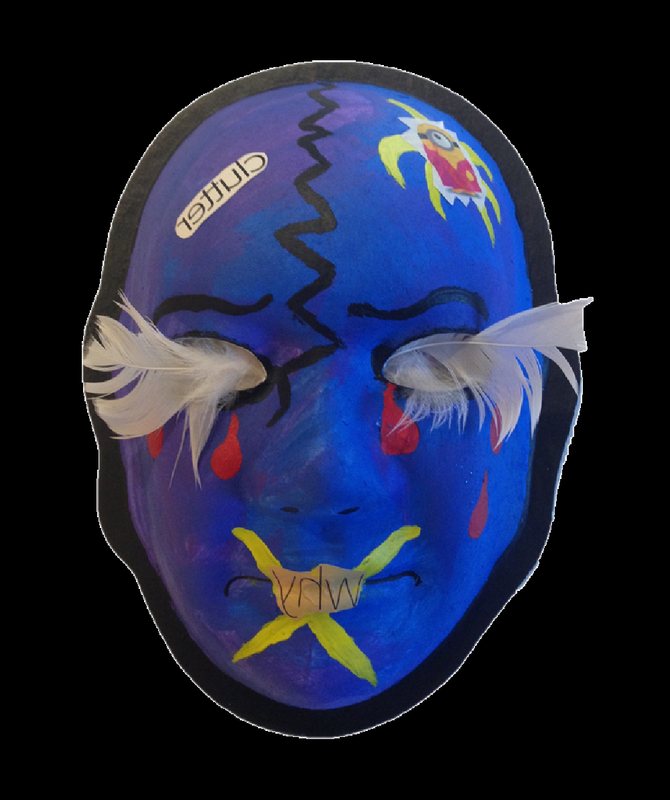 The mask represents the pain I felt inside my head, and the tears I shed from the intense pain. I am very lucky to be alive. 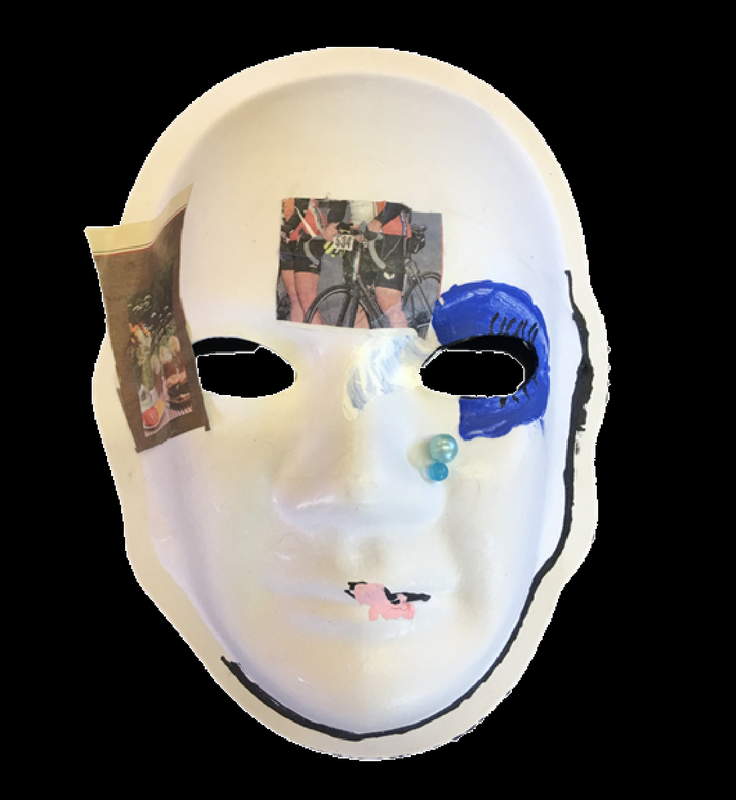 Explanation of Mask: The bicycle represents my accident, and New Jersey is the state it happened in. The phone was my lifeline! The shoe represents my struggle to get around. The flower depicts how I’ve blossomed into a strong woman, living on my own and showing responsibility. The lock represents how I had to open up to new things after my accident. The unconditional love from my family helped me to grow up. Explanation of Mask: My mask shows that yes I’ve had a brain injury, but it opened up a lot of doors for me to help others. My future holds beauty, goals, gratitude, and independence. By helping my dad, we strengthened our relationship. We discovered that pine needle tea naturally rebuilds brain stems, and is a good replacement for coffee. 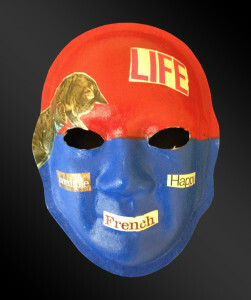 I’m like the wolf on my mask, because I won’t stop until I get what I want out of life. 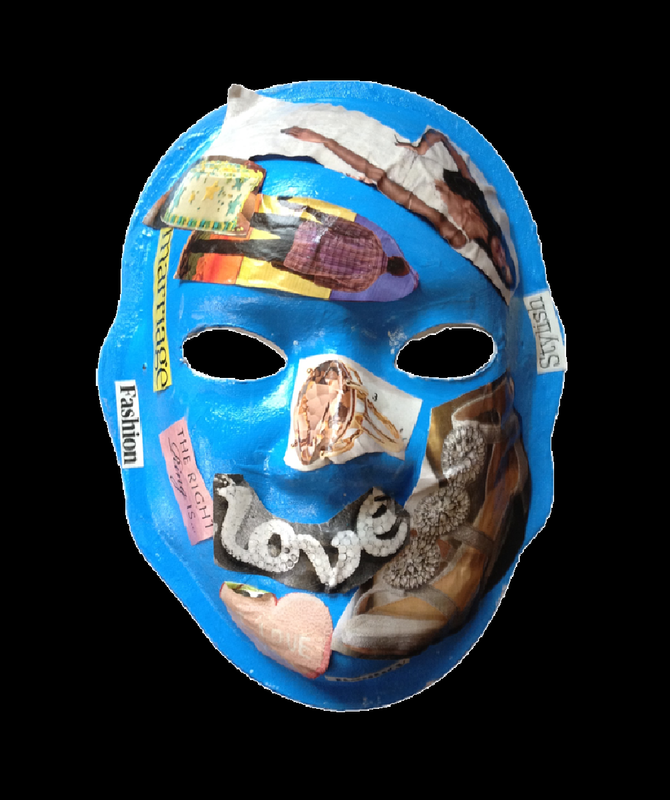 Explanation of Mask: My mask reflects the combination of past and present feelings, accomplishments, goals, engagements and beliefs. 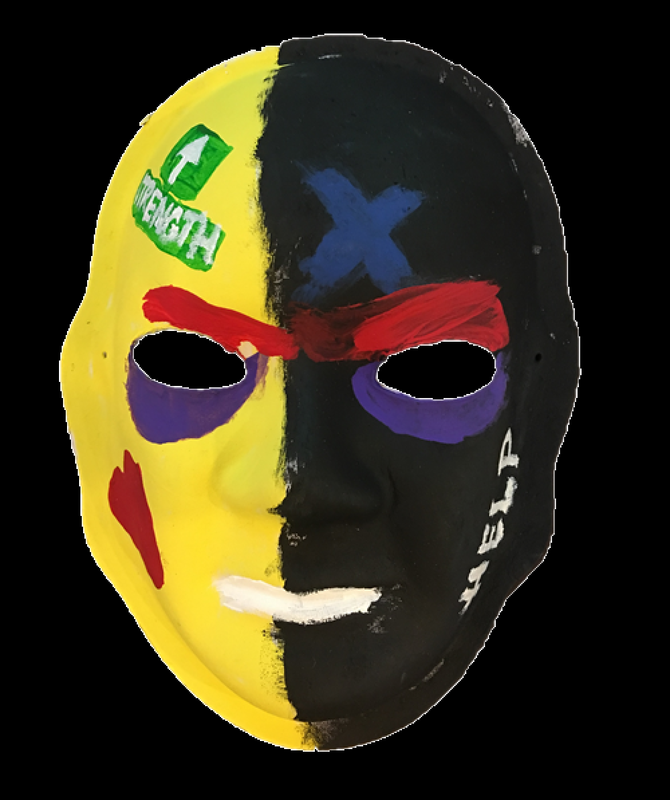 Explanation of Mask: Black represents how I felt when this all happened: angry, crushed, powerless, bitter, and frustrated. I was temporarily blinded from the gunshots. The help wanted sign is for when I was calling out for help. The coffin represents my father’s death. The Duke blue sky represents how my life is getting in order. God blessed me! My eyesight was restored, and I’ve experienced a beautiful rainbow of change. I now enjoy working out, cooking, and eating healthy, and I am finally getting back to work. 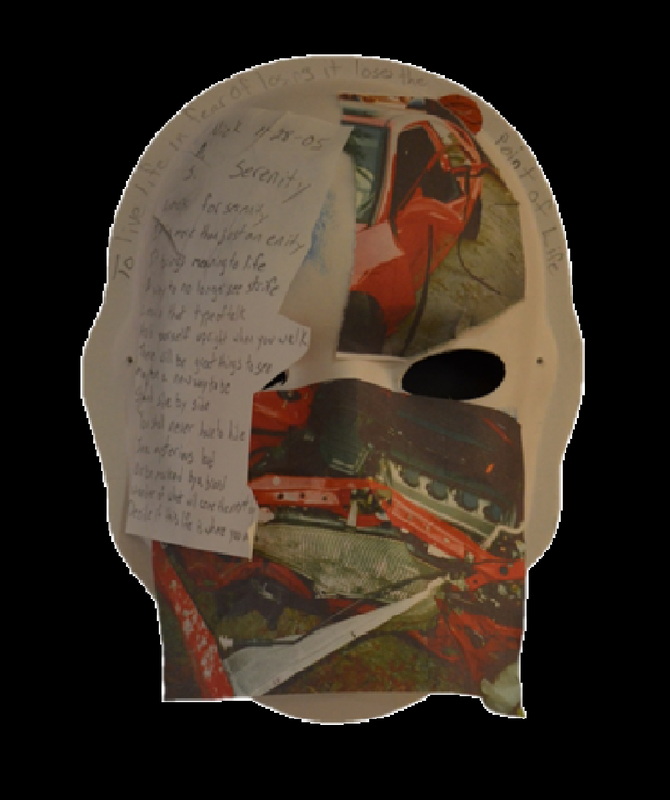 Explanation of Mask: The wreck I was in left me with a never-ending feeling of not being on the ground. I am in a constant state of confusion. I am very aware of my body, but I am not always confident. What an experience…that will last a lifetime. WHY must there be tragedies? Explanation of Mask: The right eye has slanted lines and an open pupil because it doesn’t work that well. I drew in the right side of the mouth because my left arm doesn’t work. I don’t talk well. 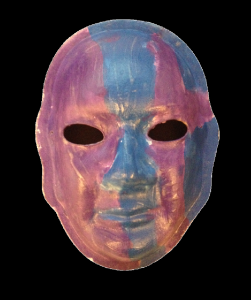 I painted with pink and purple because I think they are pretty colors. I’m living my life without some things that meant a lot to me, but that’s the way it is now…and that’s me! Brain Injury: Frontal, temporal, and occipital lobe damaged. Major impact was on the left side of my skull. Explanation of Mask: How I felt and currently feel about what happened to me. 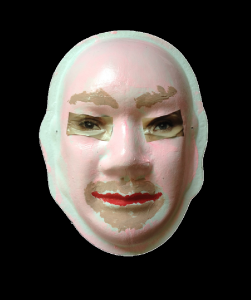 Qualities that are gone; vision in left eye, sense of smell, use of the left side of my face, and whole left side of my body. 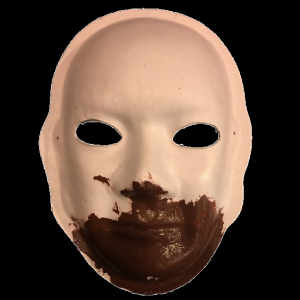 My face feels deformed, like I don’t look “right”, from smiling, talking, eating, and facial expressions. My mind is always racing; so busy thinking, but just as quick forgetting it all. I can no longer fully protect my wife and children. There is now a “new” relationship with them. Brain Injury: I was hit in the head with a broken umbrella. Explanation of Mask: If I didn’t have the accident, I would be in jail or dead. My mother prayed for God to save my life. Whitney Houston was a beautiful lady that could sing, until she messed up her life by smoking crack. I love her and her daughter. Brain Injury: A bicycle accident. I tried to avoid a jogger and flew downhill, over the handlebars and onto a granite curb. 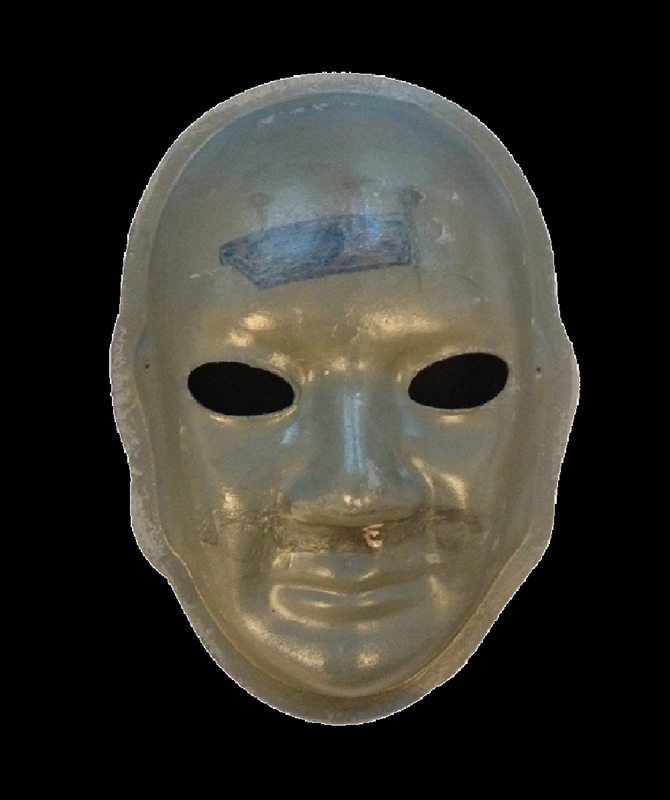 Explanation of Mask: I spent 5 1/2 weeks in a coma, and lost all memory of the previous 2 years. Today my brother is my anchor! This “unmasking” creating represents; lost relationships, past accomplishments and 18-year career as a teacher, the loss of my mom, dad, and childhood home. I hole onto my parents love and early memories. The glitter represents my new titanium skull parts. Explanation of Mask: The part in red is the head injury. The blue is the cool, calming part. And it’s all a balancing act, coming from my mouth. The expression on my forehead helps me to ensure that the blue/positive things outweigh the red/negative, injury related issues. 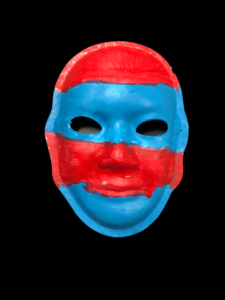 The red, white, and blue represent that I am a proud American! 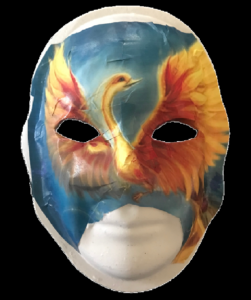 Explanation of Mask: My stroke left me in a dark cloud, feeling as angry as red hot shooting flames, and as isolated as a deserted island surrounded by murky waters. 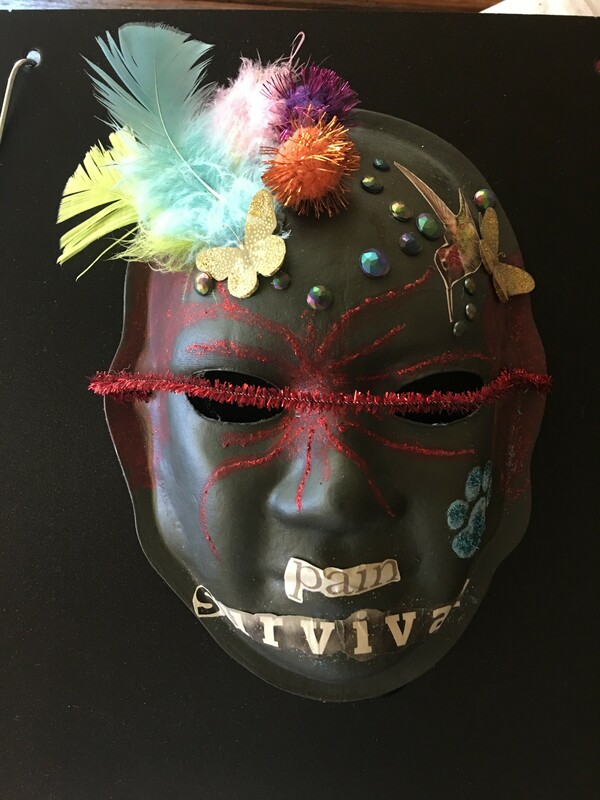 The bridge represents support from the loving family and healthcare providers who helped me to spread my wings, and regain a beautiful life full of sunshine and hope. 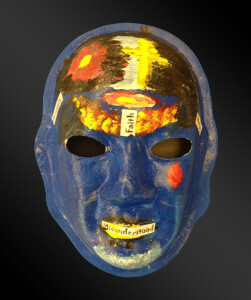 Brain Injury: Car wreck 1978. Fell 25ft in 1985. 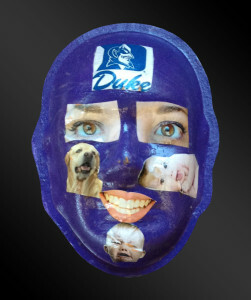 Explanation of Mask: My mask is blue because I love UNC basketball. I outlined my features so they stand out. Before my accident I enjoyed hunting, fishing, and walking. Now I enjoy good food, and computer games. I feel fantastic, and continue to try to be happy, and do my best. 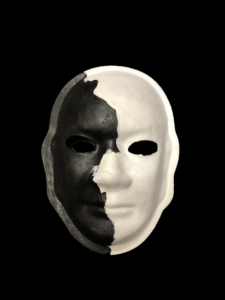 Explanation of Mask: I painted my mask black and white like a ying yang, because it represents good and evil, and that is something I struggle with. The white side has a picture of a family- my daughter has my heart. She makes me a good person and makes me very happy, especially when she says “I love you Daddy”. 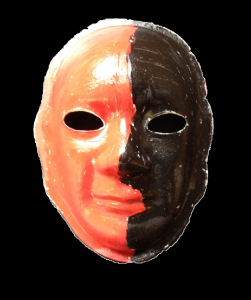 The black side has the negative feelings that I struggle with every week. Brain Injury: I was born with schizencephaly. This means I was born with clefts on the right side of my brain. 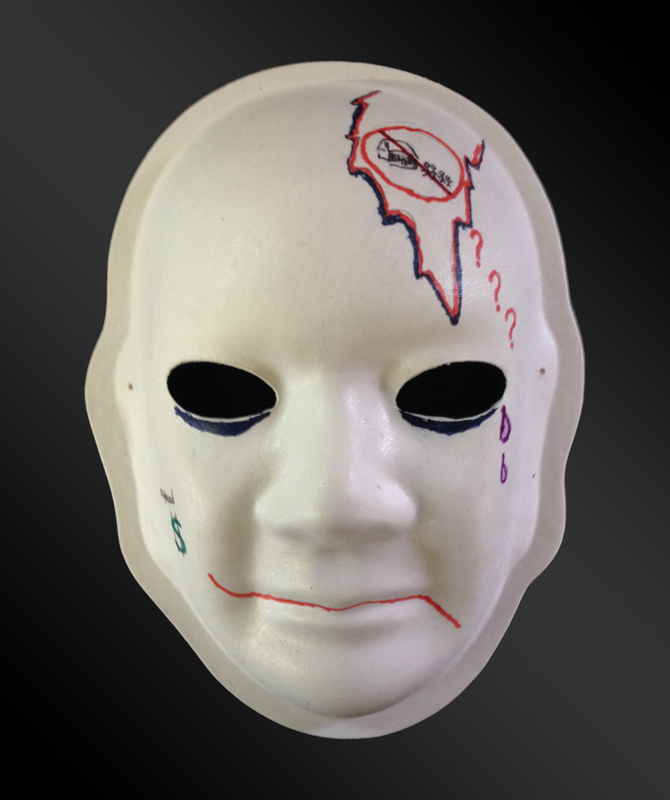 Explanation of Mask: The sad boy represents my feelings of being afraid and hurt. The helicopter represents being alive and grateful. 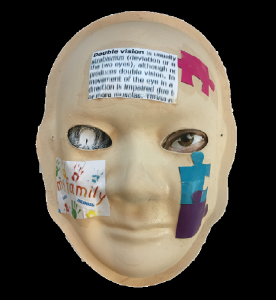 My brain injury has impacted my ability to do things, and the way I communicate with others. The dog shows my feelings and emotions of being lovable, kind, and strong. Brain Injury: Shaken Baby Syndrome at 3 years old. This affect my vision and left leg. 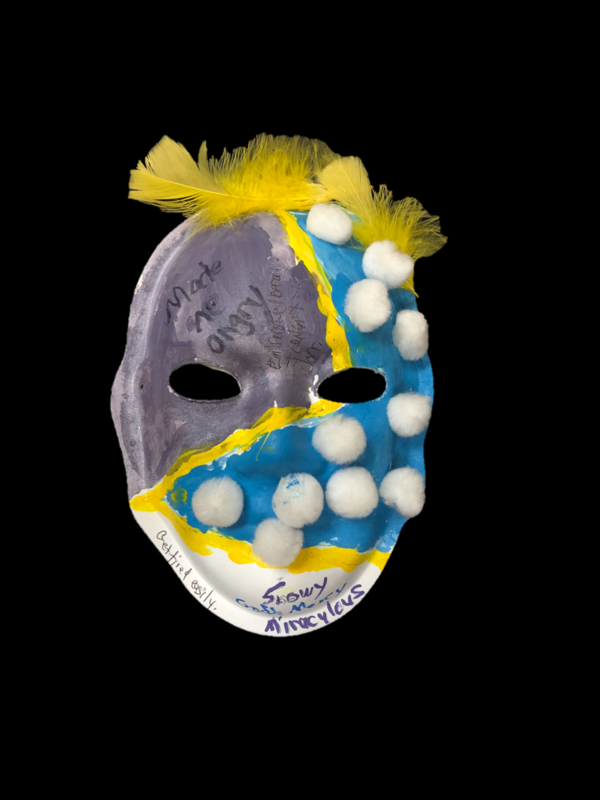 Explanation of Mask: I decided to put ballet shoes because for 9 years dance was a huge part of my life. As a result of my injury I had to have leg surgery, which impacted my ability to dance. The car, and words “Disney World” represent my feelings of being and adult and having young interests. The heart represents love, because God saved me and has continued to protect me. 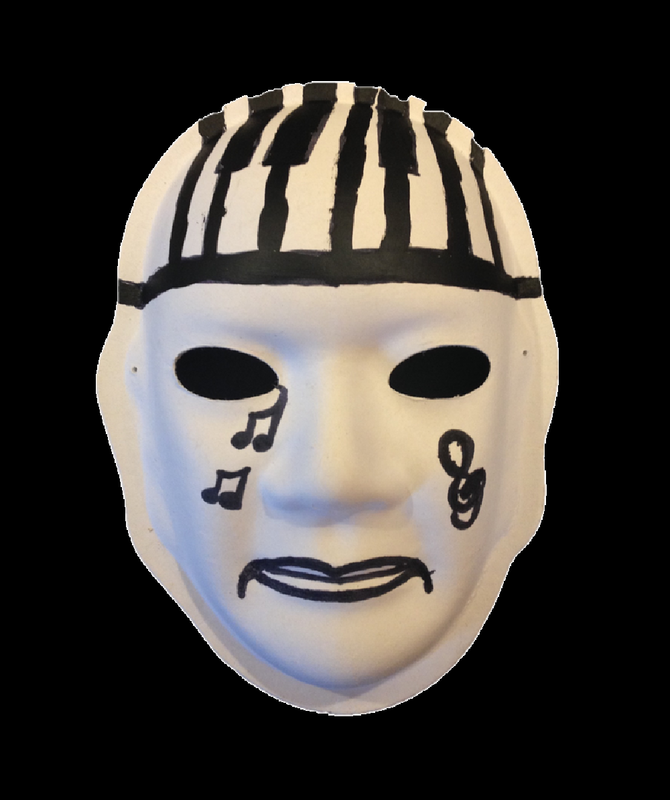 Explanation of Mask: The purpose and black zig zags on my mask represent what my journey looks like – back and forth, and then back again! I believe in never ever giving up; keep trying, keep working, and never stop. I am thankful for life and for my husband’s support; we are survivors! I live simply and try to speak out and educate others. 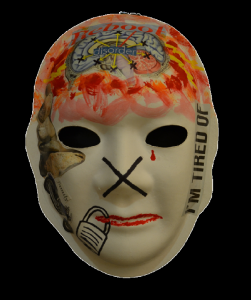 I feel tired at the end of the day and week, and I experience memory issues dealing with constant strategies. I am overcome with sadness and grief at times for what was lost in my accident. 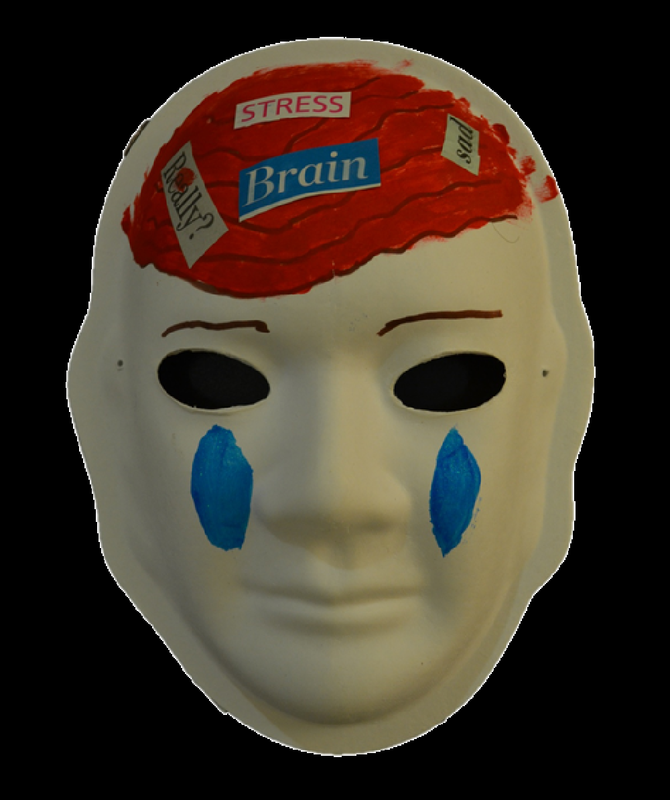 “Broken brain syndrome” is what I say when things go wrong and those around me see. 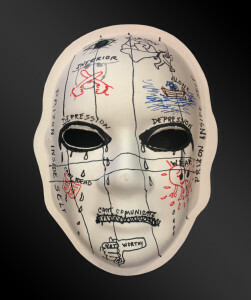 Explanation of Mask: On my mask, the lighthouse represents my new location in North Carolina. 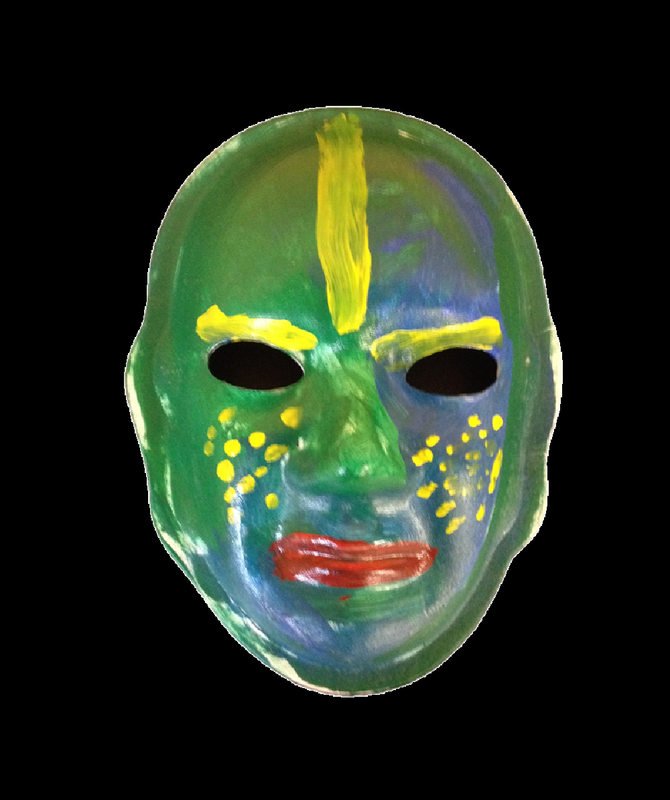 The green and gold eyes signify that I am from Green Bay, Wisconsin. (Go Packers!) 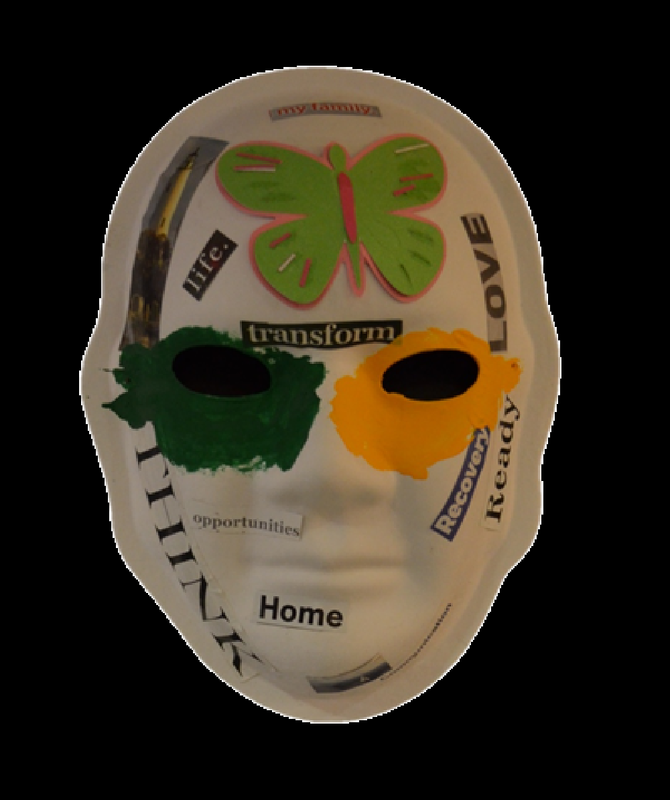 The sailboat and butterfly images are characteristics of freedom and transformation, just as a caterpillar forms into a butterfly. 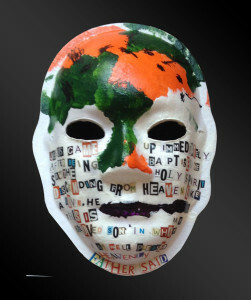 Various adjectives on my mask have different meanings; for example, family means support, life is better than the alternative, to be ready is to be prepared for what is to come, recovery is a continuous process, use your head to think, keep in touch/communication with others, home is always a nice place to be, and love always. Explanation of Mask: I found out the hard way about why you shouldn’t drink and drive and not wear a seat belt. The following sentences describe quotes and symbols I have featured on my mask. The quote, “To live life in fear of losing it loses the point of life,” was from a fortune cookie. The Nike sign is for my scar on the side of my head that was injured. The picture of the car is what it looked like after my wreck. I have also included a poem on my mask that I wrote after the accident. 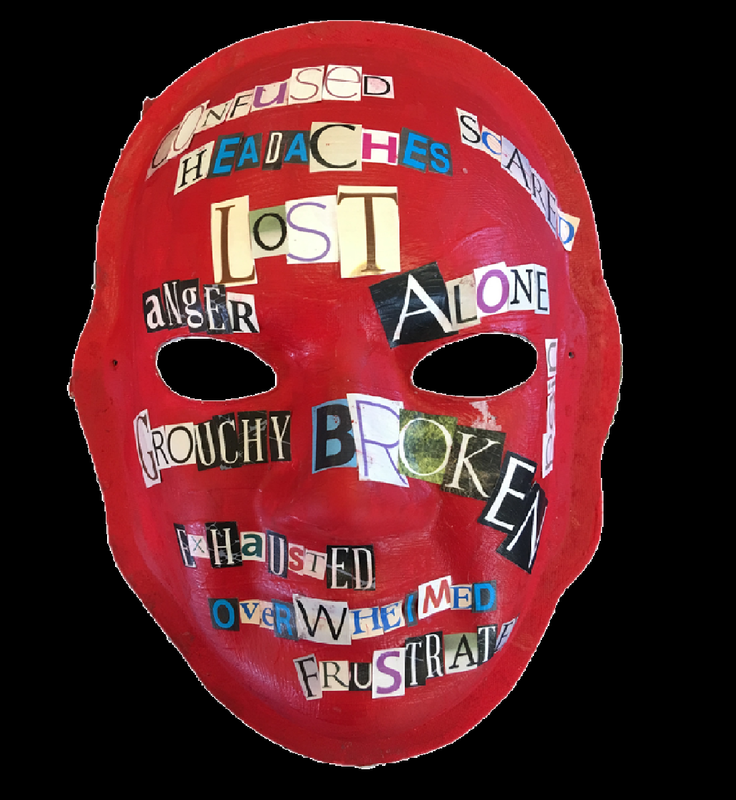 Explanation of Mask: My brain injury has led to a loss of senses and an increased level of rage. 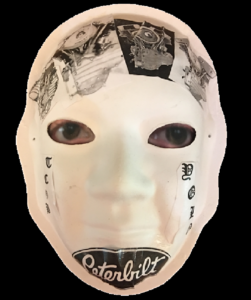 I am only a lost victim shoved aside to suffer through the brutality of this world with no smell and poor vision, unable to yell as needed. 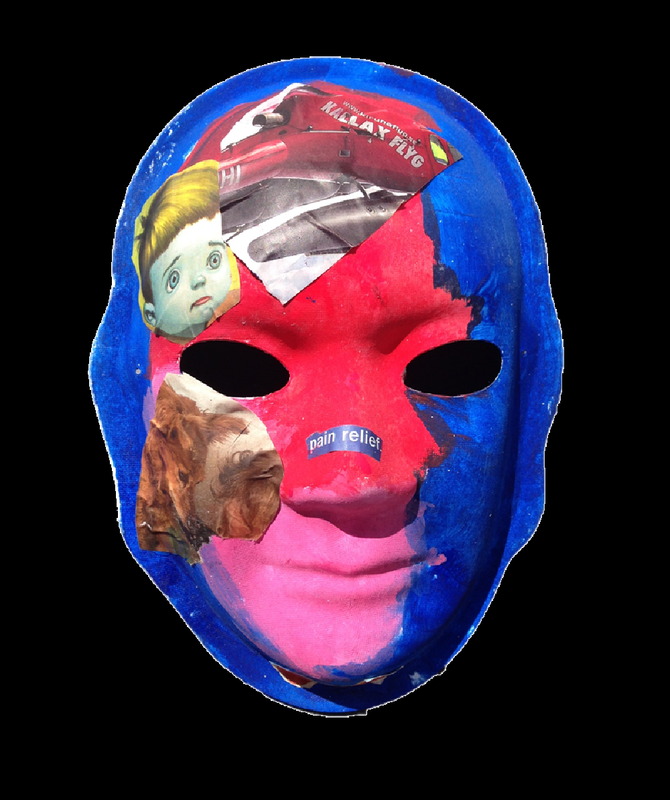 The rest of my mask represents how such things as rocks, motorcycles, and family have helped me to stabilize my being and make it through all of these tough times of anger and disappointment. 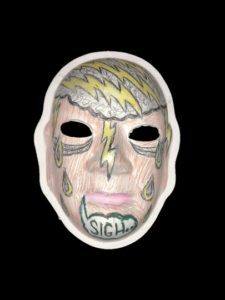 Explanation of Mask: I was in a coma for 28 days. Physical therapy and MDs helped me to “re-learn” my physical body along with many mental challenges; this took months. Now, I am a very happy soul that allows time to pass as I volunteer my free time at various charities- I meet so many people! Explanation of Mask: I didn’t do any premeditating as I made my mask. 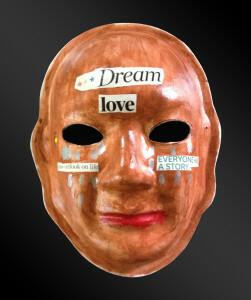 I just made it hoping it would turn out well and that it would come together to tell as story. 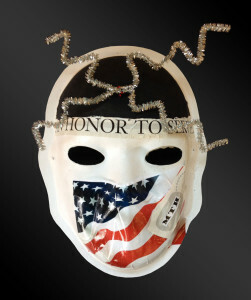 I cried quite a bit, and this is represented by the words “memory” and “the last reflection” on my mask. I had a hard time talking for a while; maybe this helped me heal as my mind grew. Explanation of Mask: I was a volunteer EMT responding to a 911 call when I hit black ice, and the rest is history. The new me: still getting to know her! I am wild and crazy like my hair and continuously discovering my new path. 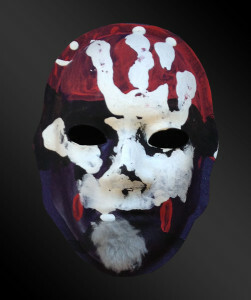 On my mask, the red blobs represent the brain bleeds I experienced. I was thankful I did not need surgery because the bleeds reabsorbed. The black lips and nostrils signify my loss of smell and taste. The bells and musical notes correlate with the ringing in my ears. I thank God this is not my home; home is yet to come a long time from now. 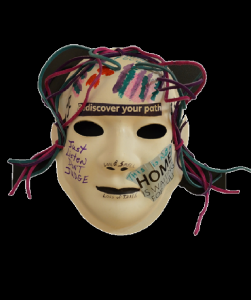 Explanation of Mask: A veil of hidden identity cursed by hopeless frustration of who I was and who I am! As the night divides the night, and the day destroys the night. Embrace, indulge, love every moment in time! Faith is something we believe yet cannot see, when we truly believe then our eyes will open and see the fruits of our faith! Blessed for a second chance. Thank you my Father in Heaven and Son of man. Give Thanks! Amen. 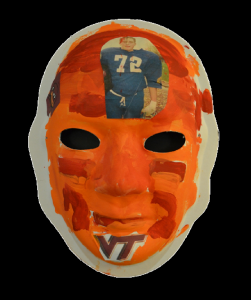 Explanation of Mask: I love Virginia Tech football, so I painted the mask in VT colors and added my jersey numbers as well. 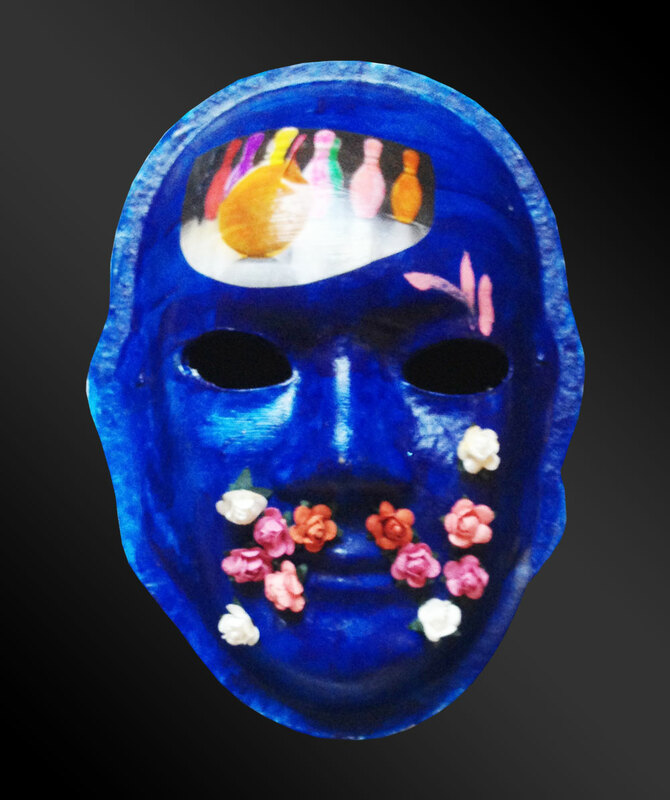 Explanation of Mask: My mask tells what went through my brain and what still sometimes does. 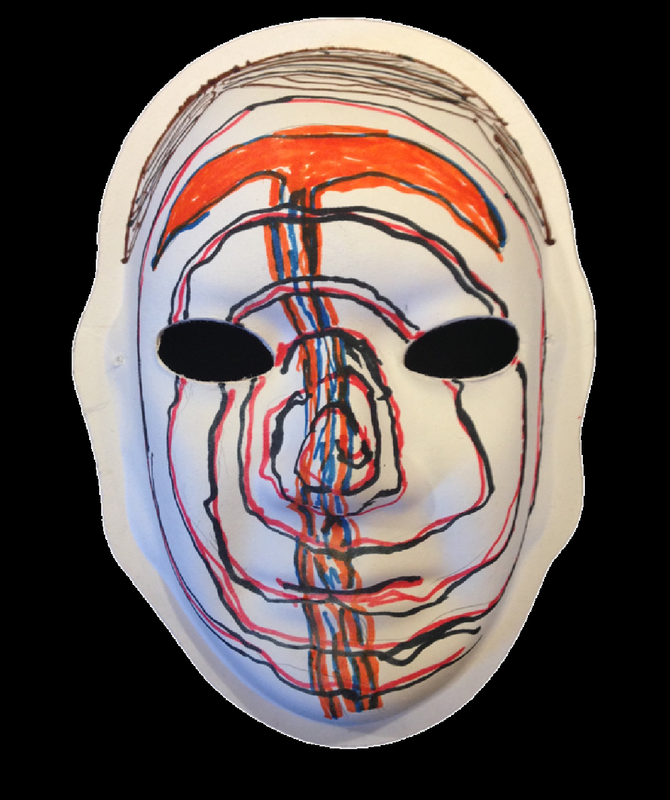 Explanation of Mask: Two of my neighbor’s dogs tripped me up. Half of my head was shaved. 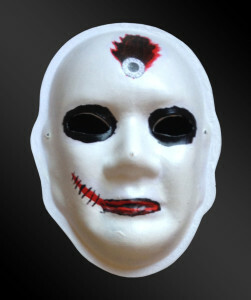 On my mask, the red coloring shows where my scar is located. I sometimes have problems walking and finding words. I hope to continue to improve. 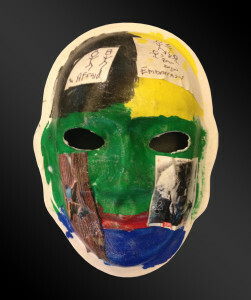 Explanation of Mask: Even though I have a brain injury I’m still able to enjoy the things I was doing before my injury. I love music, fishing, and going to Nascar races. I also like dogs and cats because they help me calm down. 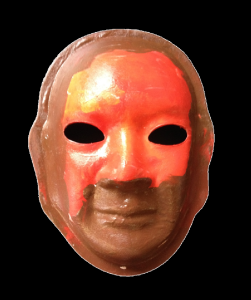 Explanation of Mask: I used the color orange because it is like oompa loompas in Willy Wonka. Purple is for the reflection on my past life. I chose red around my mouth to indicate “vibrancy”. 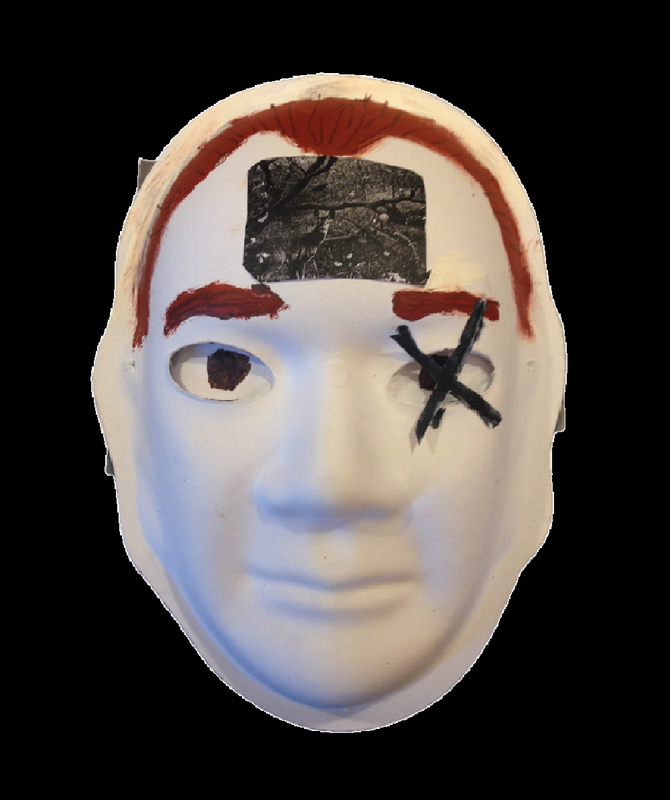 The screws in my forehead represent an image of my craniotomy. Nothing is more important to me than music! I feel stronger as a result of my injury. 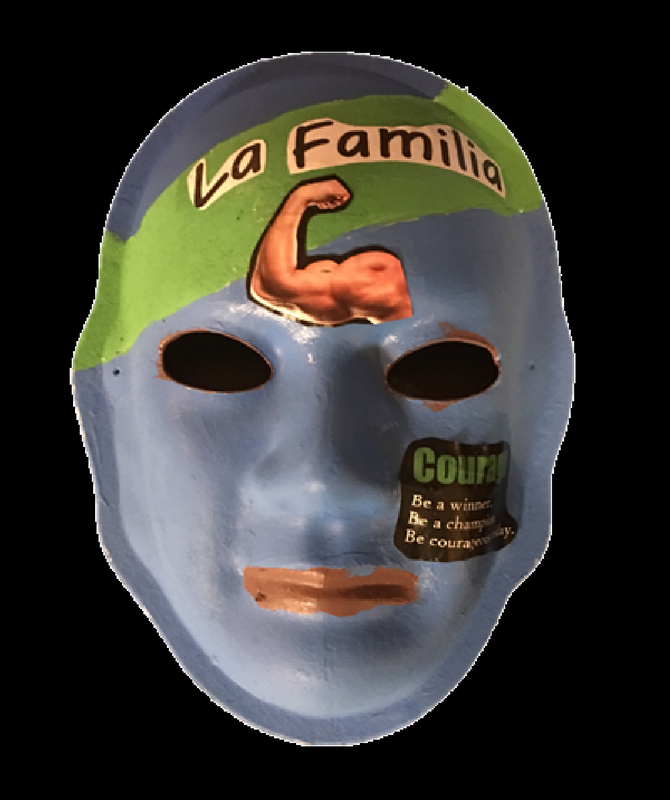 Explanation of Mask: Before my injury I enjoyed a lot of outdoor activities, which my family continued with me after my injury. 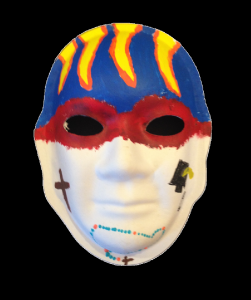 Explanation of Mask: I grew up in Phoenix, AZ. After my surgeries, peopled started to not understand me. I could not understand others either. As time went by, I got more frustrated because I could not communicate well with others. 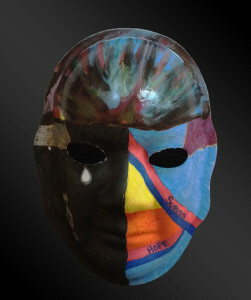 After coming to HFF, I am more relaxed because we all understand TBI and ABI. The left side is flesh colored with happy words because I feel wanted at HFF, and I can smile and laugh. 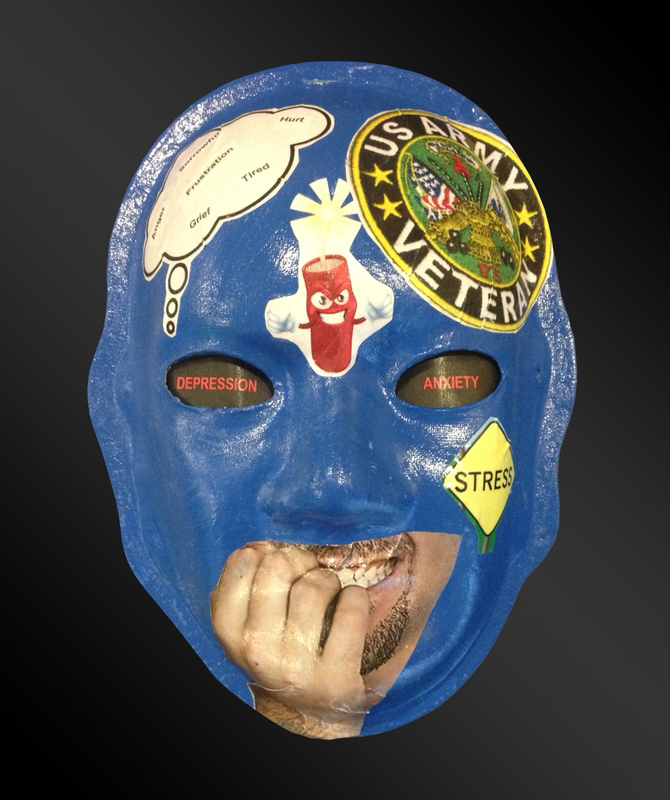 The right side is blue for sadness. The tears are because I am sad because I have trouble communicating with family. The clenched teeth are because I get frustrated. 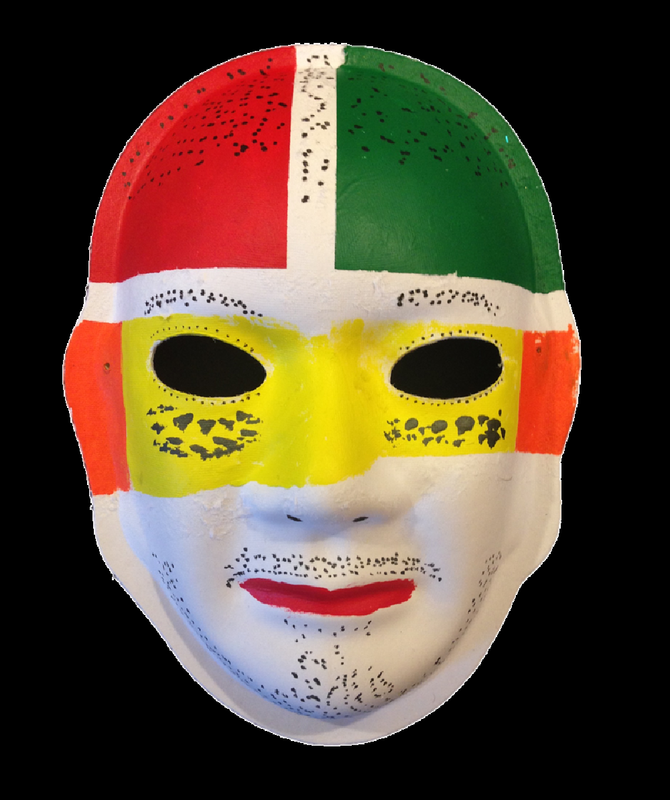 Explanation of Mask: The colors represent my heritage and the place where my children were born. America is where I call home. I put my son’s eyes in my mask because I try to see life through his eyes. I feel grateful about life! 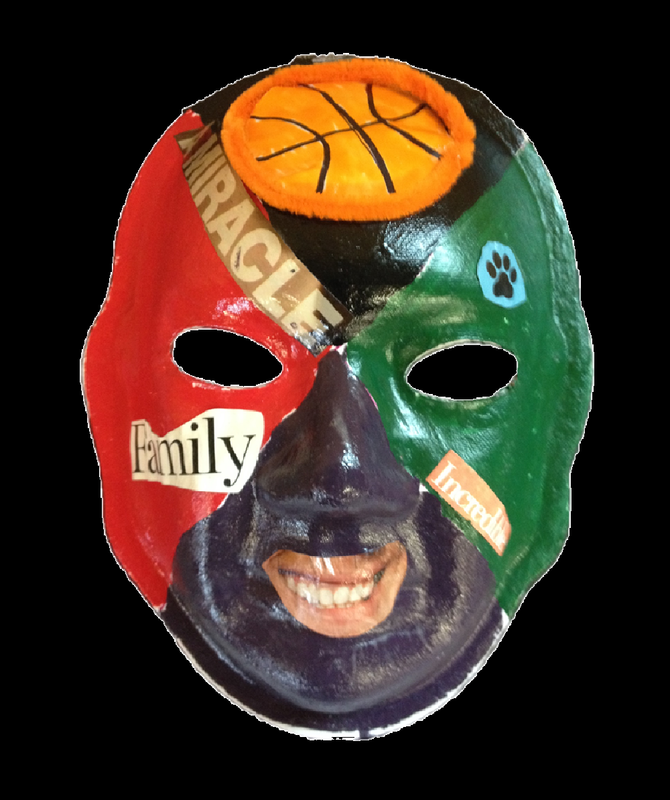 I am resilient and motivated in my recovery. Resilient is the name of my book that inspires people to never give up! Neki is the title of my next book. Brain Injury: I hit my left frontal lobe when a truck mashed on the brakes when I was returning from my social work job. I had 2 jobs at the time Walmart and Social Work. Either way I am lucky to be in the condition I am in now. Explanation of Mask: My mask has the colors of the Carolina Panthers. I have been on a roller coaster ride ever since I got out of the hospital “Wake Med”. I was pretty depressed for a while, as well as isolated and lonely. However, I began to cling to T.V. church as well as music by August Alsina, Kendrick Lamar, Hozier, and that about sums it up. Now coming to therapy keeps me busy and also gives me hope because I have a lot more to do with my life here on Earth. 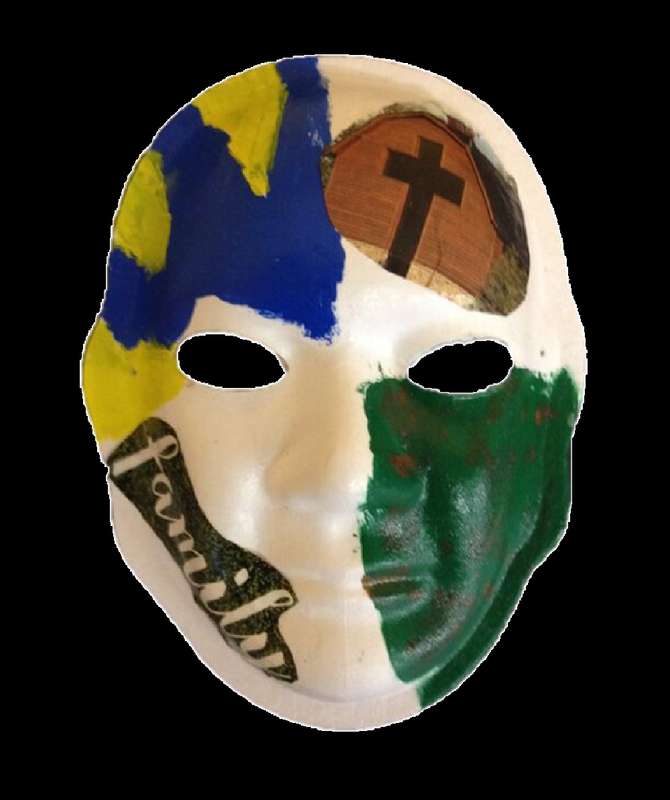 My fight is to get back to social work and changing the lives of children and families of all walks of life. Explanation of Mask: Before the accident I worked very hard, happy and free. 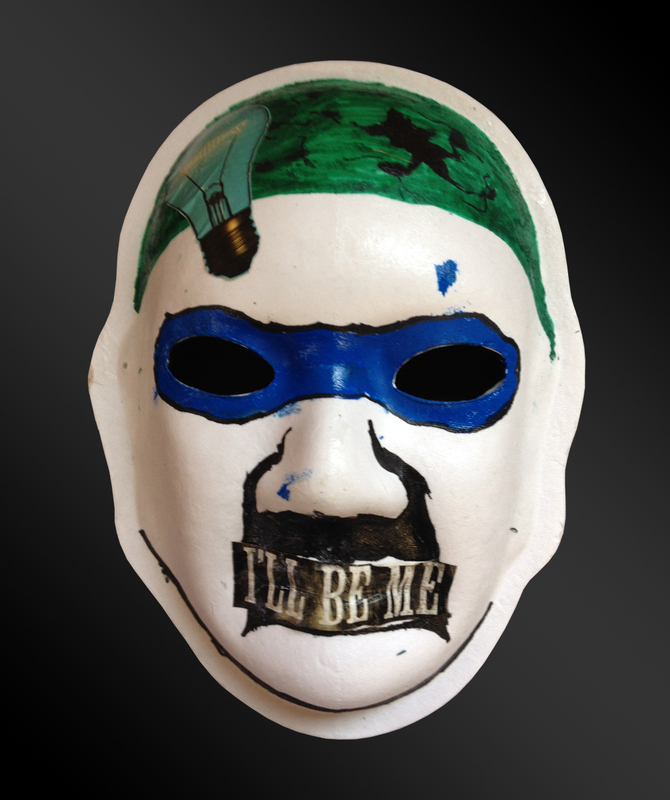 I painted the mask blue, sky blue, and green. Green is for positivity, and for balance and trust in my mind. At Hinds’ Feet Farm I feel good about the people there and the supervisors. I’ve been there for 2 months and they’ve helped me a lot. God Bless the whole farm. 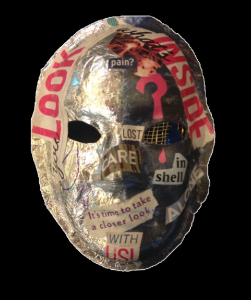 Explanation of Mask: I feel like I am broken inside. I choose to keep things to myself. I know that things will be hard, but I will not give up. Sometimes I am tired of all I have to do to get better. I know no one will do everything for me, so I do it. Sometimes I feel helpless when I have to turn and ask others for help. But I appreciate all the help I receive. Sometimes I become angry when I try to do things and can’t because I know I can do it. In the long run, I will beat this. Explanation of Mask: For about 15 or 16 years, I was a pretty normal American girl. 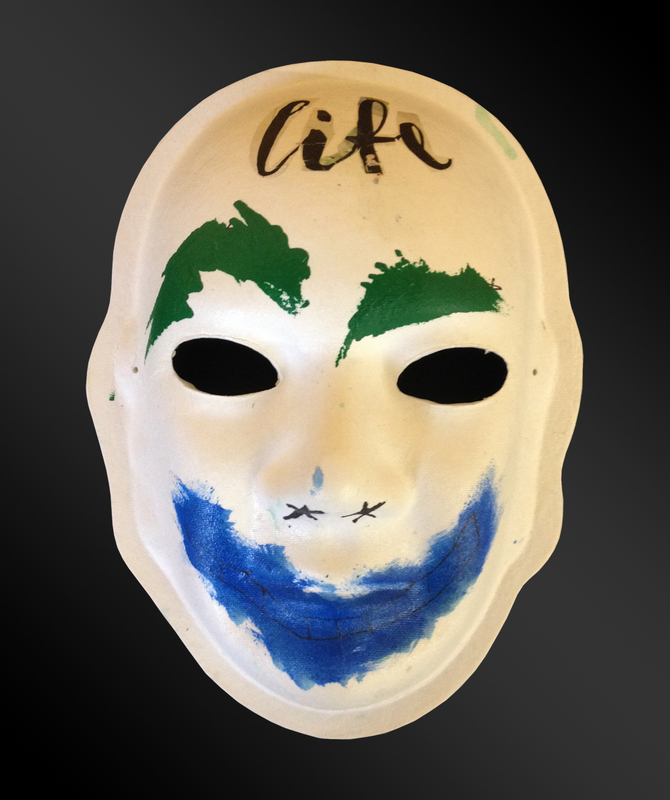 The first white section of my mask represents that time of my life. 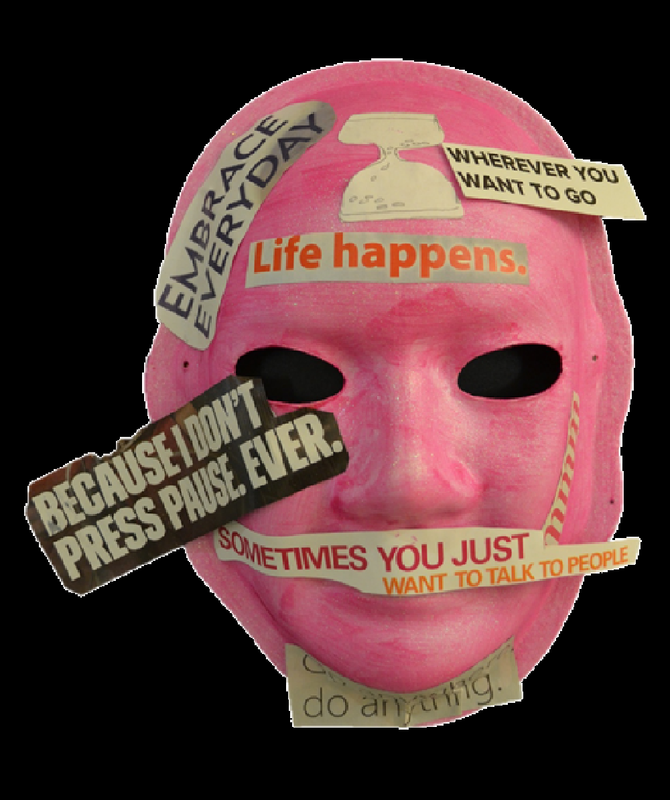 When I was in 11th grade, I started to have anxiety attacks and I was not as social as I used to be. 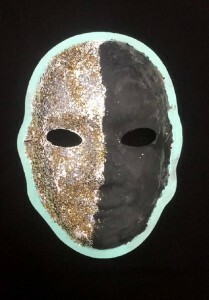 The white mixing into the black is representative of when things started to progressively get worse. 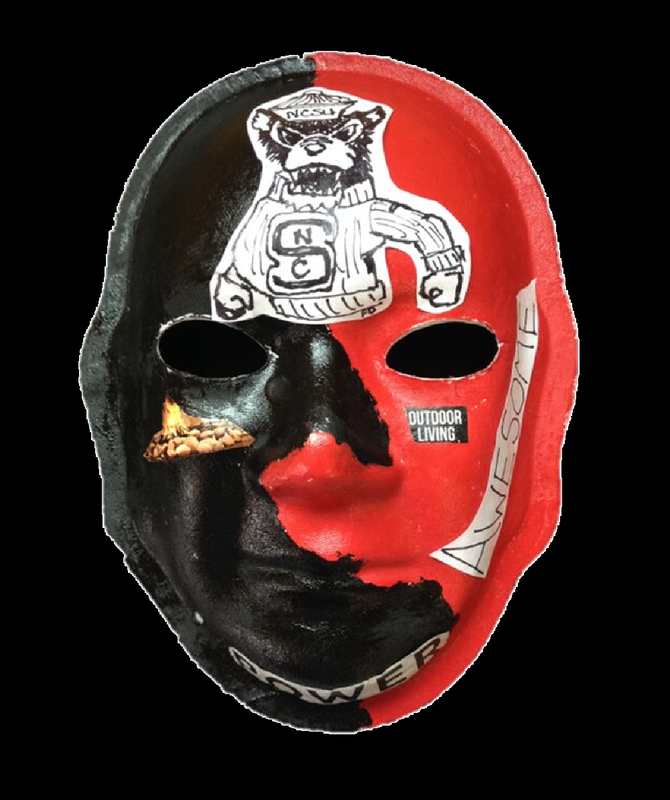 Eventually, as symbolized by the black section, things were just terrible. I never went anywhere, I was too nervous too, even rarely saw some extended family. The dark gray is when I was in the hospital after having emergency brain surgery, when more severe symptoms started to show. Progressively things have gotten better. I’m not entirely who I used to be, as shown by the lighted gray, but I’m getting there. Explanation of Mask: The road on forehead going from side to side copies the inclusion on my head from removal of skull with my red blazer on top. 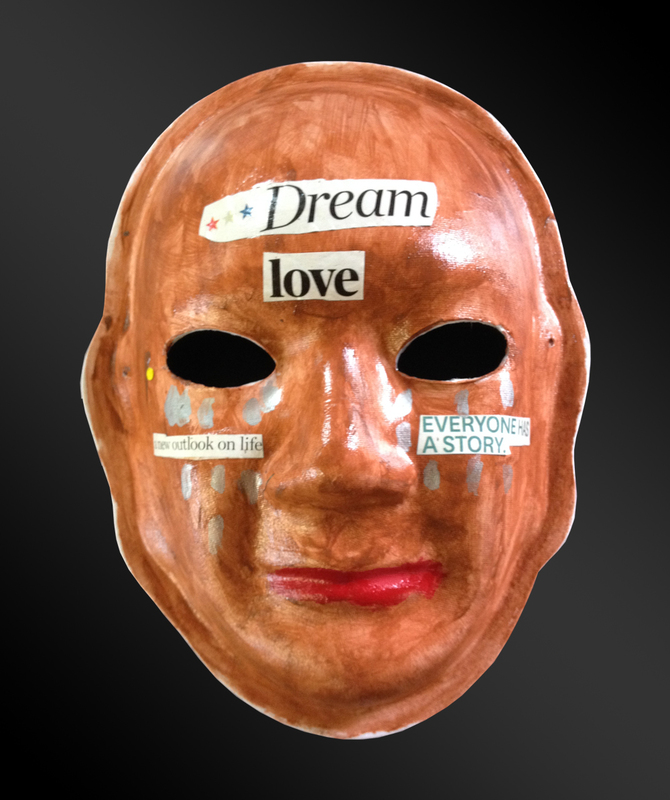 The tear on the left eye and question mark represent the emotions of upset, confused, and wondering what comes next. The cross in the middle of the forehead represents the cross and how blessed I have been since injury. 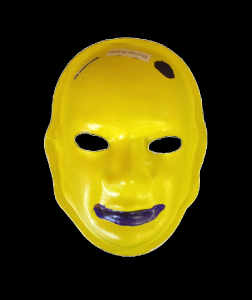 The sunshine represents the common nickname I’ve gained since, “Casey and the Sunshine Band.” The total injury was a life changing experience, difficult at times but glad it is a part of my history because I feel it has truly made me a better person. Explanation of Mask: Before my TBI/Rebirth spiritual awakening. I was headed down the wrong path. 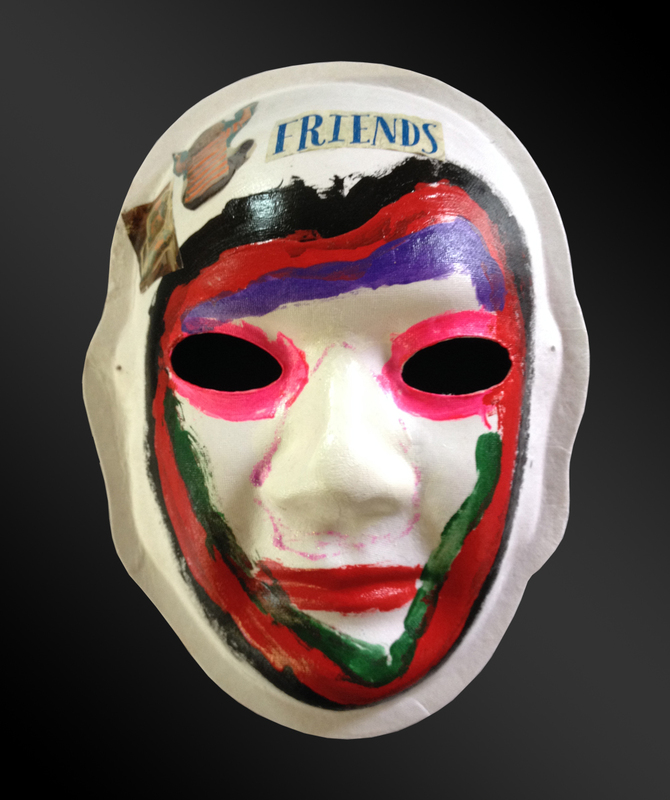 I was involved with the wrong crowd of party goers that would eventually lead to destruction. 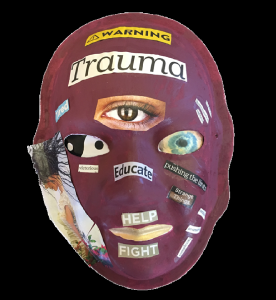 After my TBI, God opened my eyes and the veil was torn. I was reborn, I had to be taught everything over again. How to walk, talk, eat, and dress myself. It changed my perspective from the worldly temporary mindset to the Godly eternal mindset!! 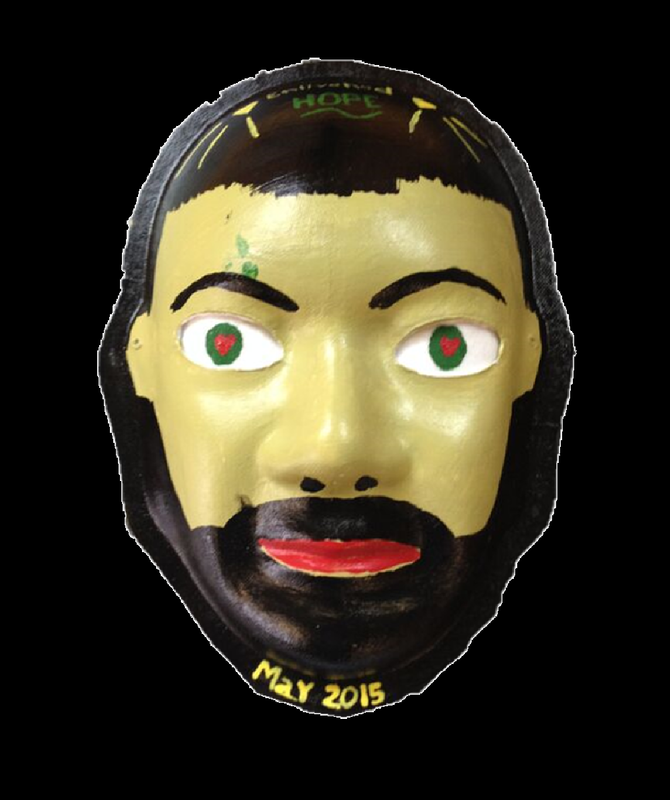 Brain Injury: June 2014. Fell 25 feet while at work. 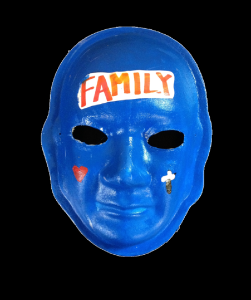 Explanation of Mask: My family has meant a lot. They’ve gone through a lot but have always been by my side. My life is like a jig saw puzzle. Some parts fit and some don’t. My sight is like tunnel vision and I see double. But thankful to be alive. 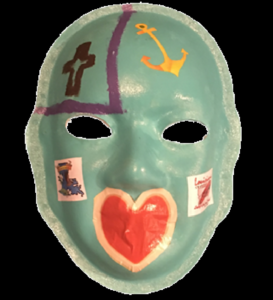 Explanation of Mask: I am a United Methodist Minister, but because I have aphasia I can only speak a few words and short sentences. My mask represents the way I feel… my mouth is both happy and sad, as are my feelings. The eyes reflect the love and faith that get me thru each day- my faith in God and the love of my family and friends. The cross on the forehead represents my love of Christ and his love for me. I believe he is with me always. I never give up hope as the saying says. No matter our situation, we are all connected thru love, laughter, and hope. Explanation of Mask: Blue represents gratitude, being lucky, feeling unlimited in my recovery and always thinking about ways to stay strong. 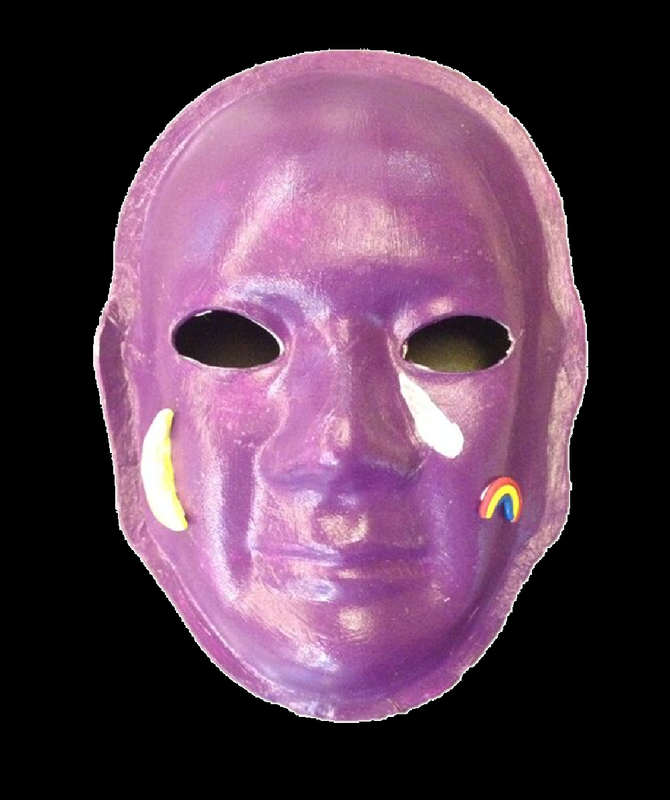 Purple represents hurt and pain … but I will overcome and am powerful. I am always looking at everything and trying to find the positive. 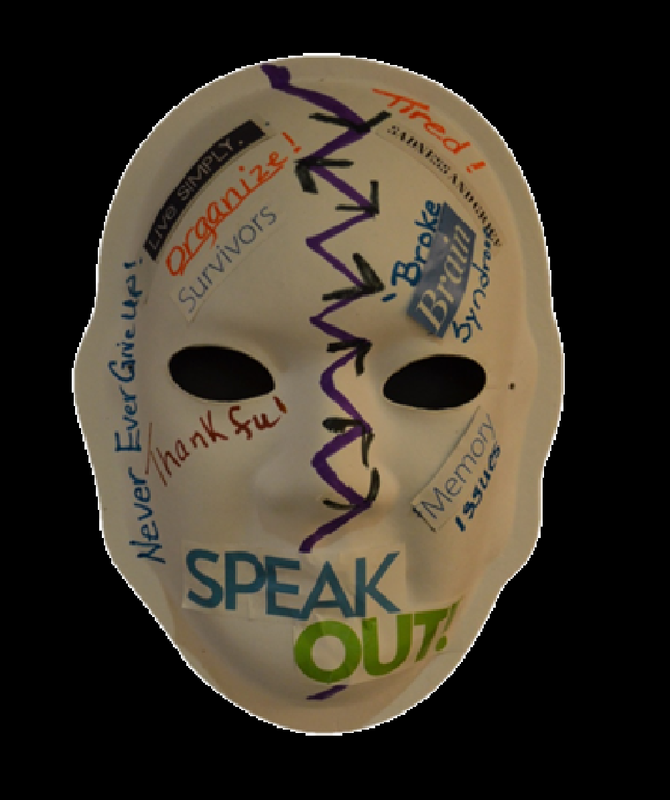 Explanation of Mask: : Speaking up for people who lose their voice in the fight. You have more strength than you think. Explanation of Mask: I feel sad about my brain injury. The bicycle represents progress. 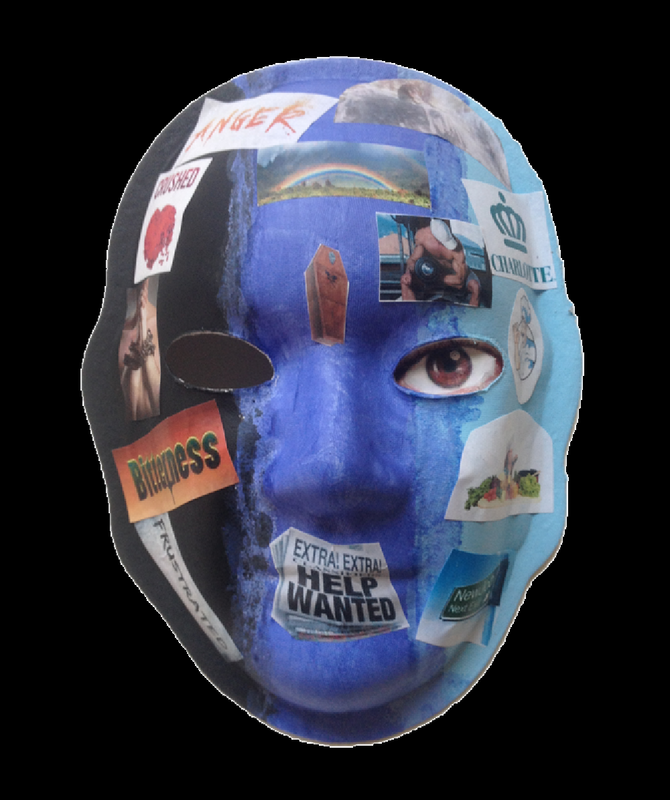 The words I identify with my brain injury are: afraid, awe, brave, challenged, annoyed, anger and confused. Explanation of Mask: I’ve been in 2 car wrecks. First I was driving alone and ran up on a curb. This led to my car spinning out of control. I ended up over correcting too much and my car flipped. I was launched through the windshield. Second car accident was scary. I was t-boned and riding passenger with a friend. Brain Injury: I had a brain aneurysm at East Carolina University during my senior year. Explanation of Mask: I don’t remember what happened but I was told I was beaten and given surgery and was induced to coma during healing between 3 months. I woke up in Charlotte and my family told me my husband was in jail. 8 years later I was declared “competent” again and I was able to bring my husband home. No, he didn’t ever try to hurt me, and he died after he was diagnosed with cancer in 2014. I know who the real criminals are: The Guardianship System!! Brain Injury: I was hit in the head while driving. Due to a recall on my vehicle, my airbags did not deploy and my seatbelt didn’t lock. I suffered a severe concussion. Explanation of Mask: I used words to express a few emotions that I experience and I am still experiencing everyday. 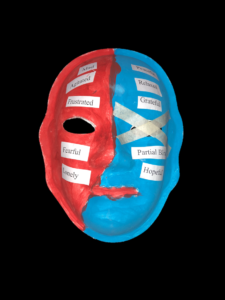 Explanation of Mask: The left side represents bad emotions of anger and confusion. Why did it have to be me? The right side represents good emotions of my faith and peace. I feel like a new person now. 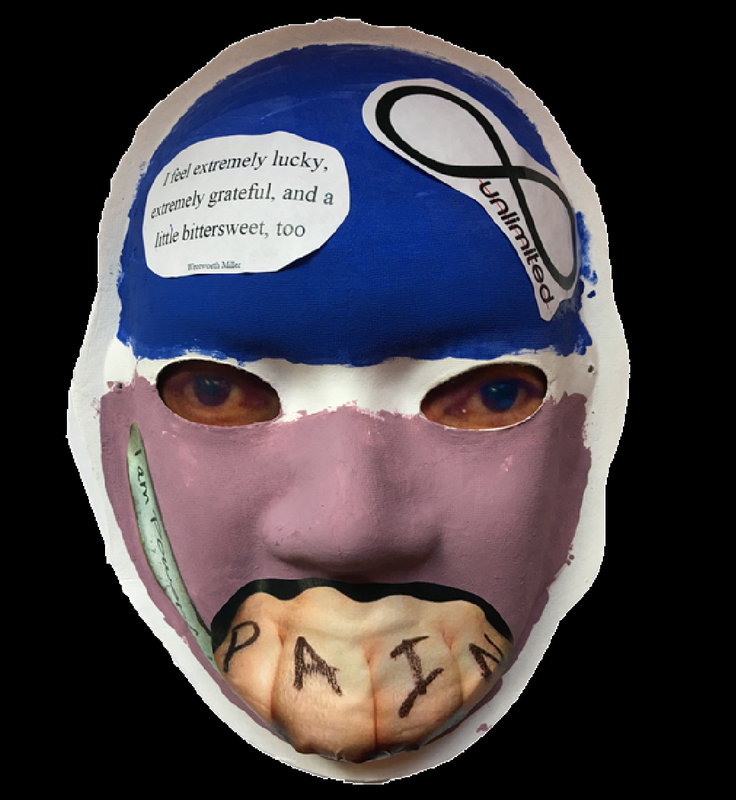 Explanation of Mask: Having brain trauma/injury was the best thing that ever happened to me. The black vines represent the “Great Void,” the Great Unknown, the creative force yet to reveal itself in manifest form. 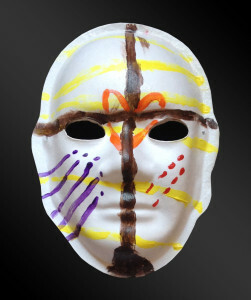 I am a conduit free from blockages, ready willing and able to express creativity. 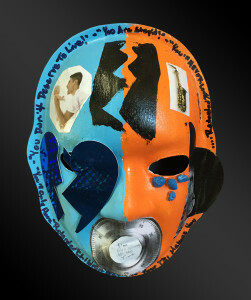 Explanation of Mask: The mask is in two parts to represent the before and after my brain injury. Before: The flower represents that I was a generally happy person; the music note is because I had a lot of musical talent; the pink lips because I found myself attractive. 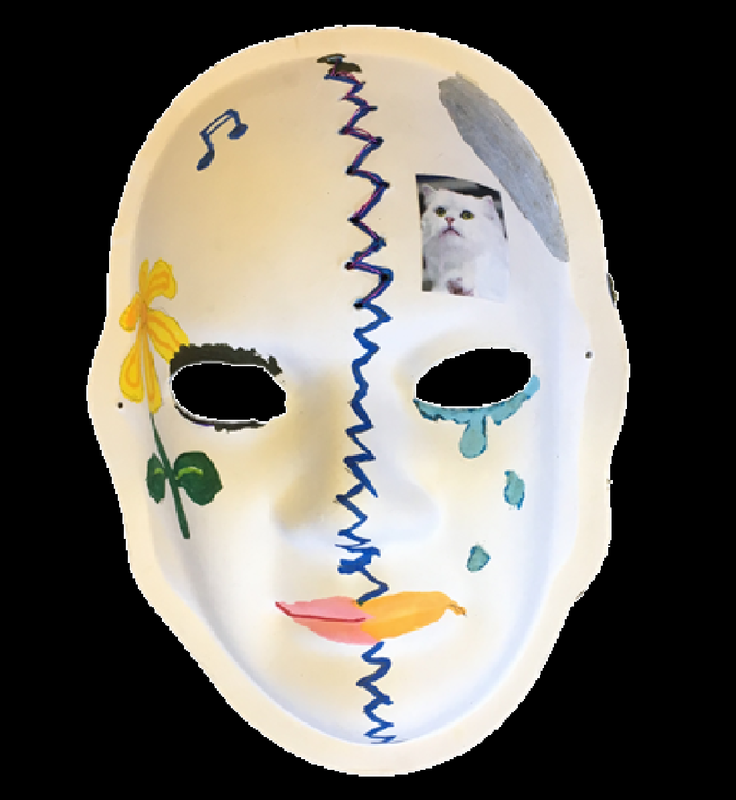 After: the silver represents the titanium plate in my skull and my anxiety; the cat calms me down during anxiety attacks; the tears are because it hurt physically and mentally; the orange lips are for TRYING to be attractive but not knowing how. 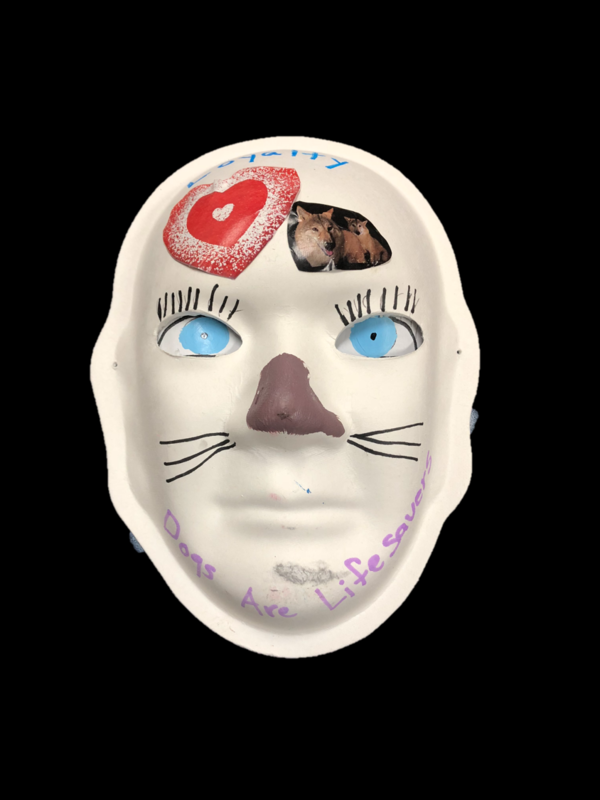 Explanation of Mask: Before the discovery of my daughter’s tumor I had noticed behavioral changes. Eventually during a trip to the ER at our local hospital, the tumor was discovered ad she was rushed to another hospital for surgery and spent the next 3 months in recovery. The colors represent darkness to light, the words on my mask covers the range of emotions that I felt while watching my daughter go through this experience. The cross represents my faith in my Lord and Savior, Jesus Christ. I do not believe I could have made it through that time in my life without Jesus. No matter how difficult our journeys may be, we can rise above. Explanation of Mask: Through the experience of surviving, I have come to cherish the state of being alive and to be given a new chance to experience more fully the grace and joy in my life. 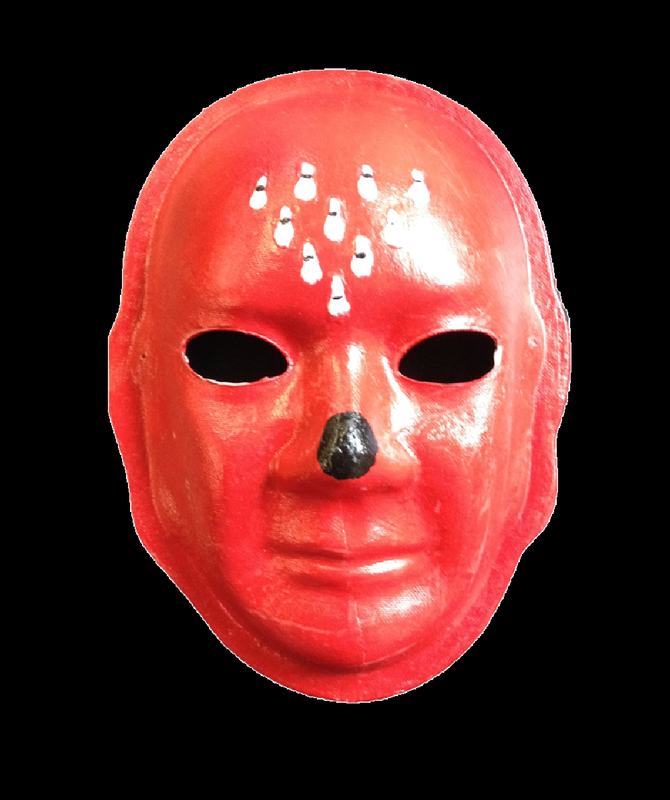 The injury is depicted as a red “star” shape on the top of the mask, in my case a subarachnoid hemorrhage. The words represent the positive aspects of healing from my injury. The base color is gold for I have come to know that I, like everyone else, am as valuable as gold! Brain Injury: I was 16, hit another car by drinking alcohol. Stole my cousin’s car and flipped the car over a couple of times. 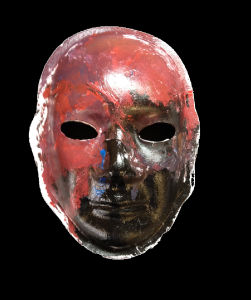 Explanation of mask: Black clouds, sometimes I feel blue, but red in the face because I want to be able to walk, again, I feel sad, happy most of the time. 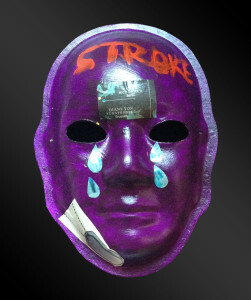 Explanation of mask: My brain injury was the result of a stroke. My mask reflects the combination of past and present feelings, accomplishments, goals, interests, engagements and best friends. 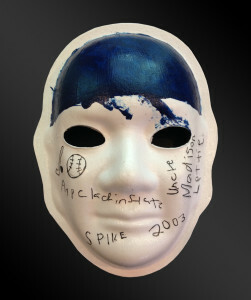 Explanation of mask: Having had a TBI at a young age, I never knew that there was a reason for some of my challenges. 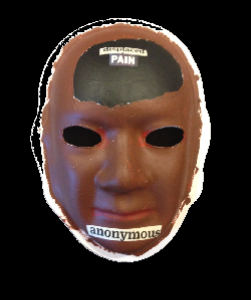 Then getting another mild TBI-this time as an adult-I thought I had nothing to grieve. 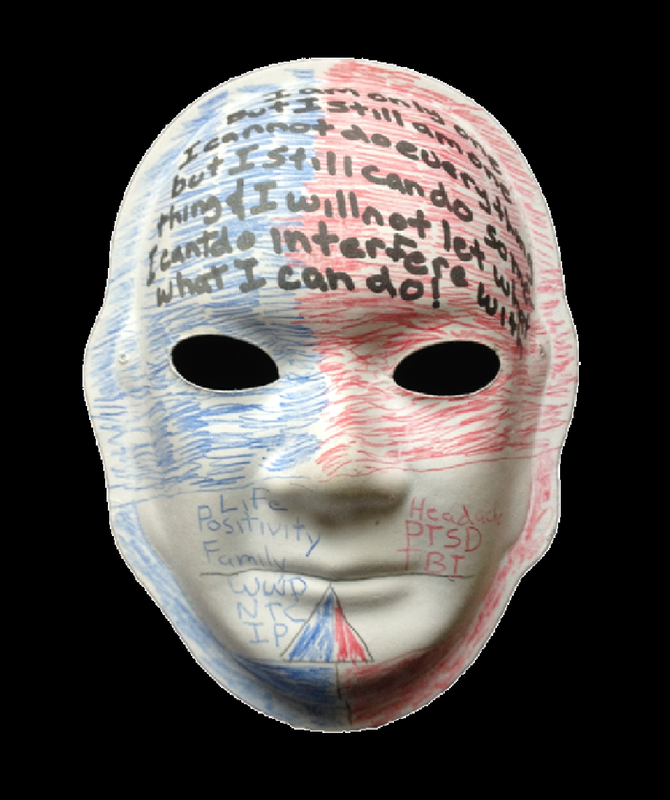 After all, I wasn’t dealing with severe effects that challenged others with TBI. Sometimes I sense I’m in a whirlwind spiral when I lose my balance or when I’m overloaded with too many thoughts. Many times I must take notes to get the info I hear to sink in so I can recall it later. I feel like I have to work two times harder than others. It takes conscious effort to peel away layers and open both eyes to the reality of my TBI and yet I’ve had a lifetime of spring time aliveness and growth-mindful engagements with all that is inside and around me. The supports of friends and others guides and sustains me on this life journey. Brain Injury: I didn’t have enough oxygen getting to my brain at birth. 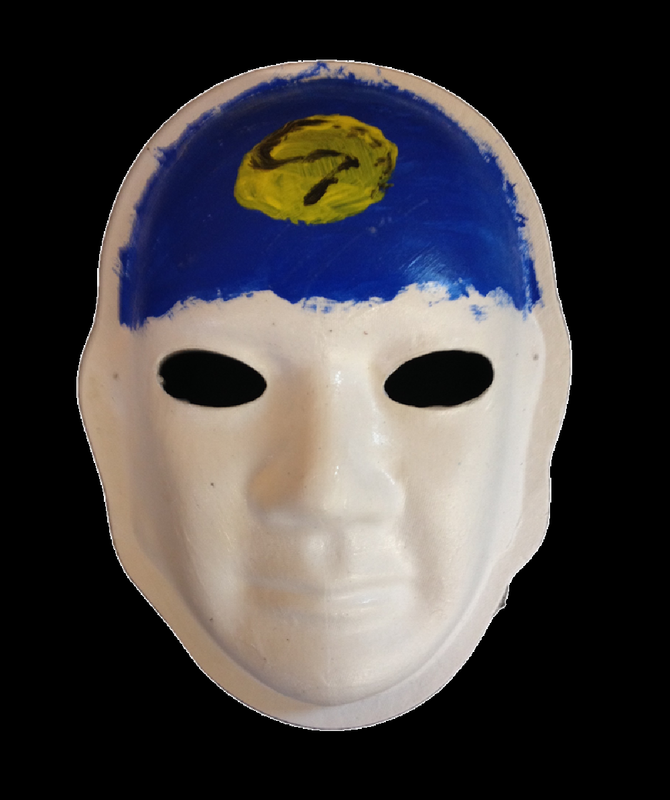 Explanation of mask: I’m a very quiet, calm person. I am easy to get along with. I’m curious about a lot of things. It keeps me going throughout the day. If I’m not curious I end up sitting in my recliner and feeling sorry for myself. I live alone and it keeps me going, my curiosity. 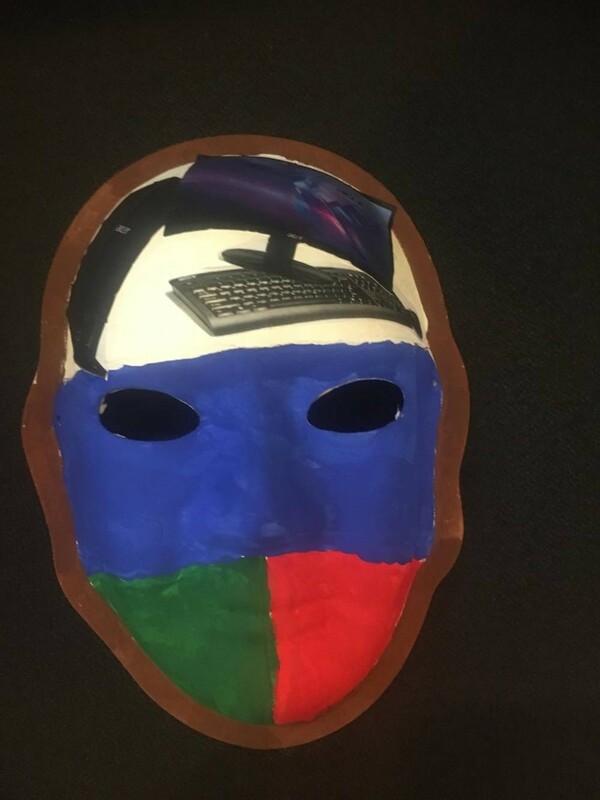 I have pictures of computers on my mask because I have been working with computers since I was 16 years old and I want to continue it. I have even built a computer. 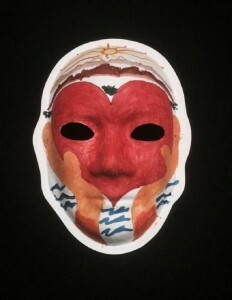 Explanation of mask: I am using red and a white heart because I am a nice guy. I respect everyone. The heart is for women. I love women. The brown mark on my forehead is for my brain injury. That is where I have a scar on my forehead from my accident. I am nothing like the person I once was. Nothing at all. I was a drunk and now I don’t drink anymore. It’s been about 13 years since I got really drunk. Brain Injury: Bleeding in my head when I was a baby. I had a stroke. 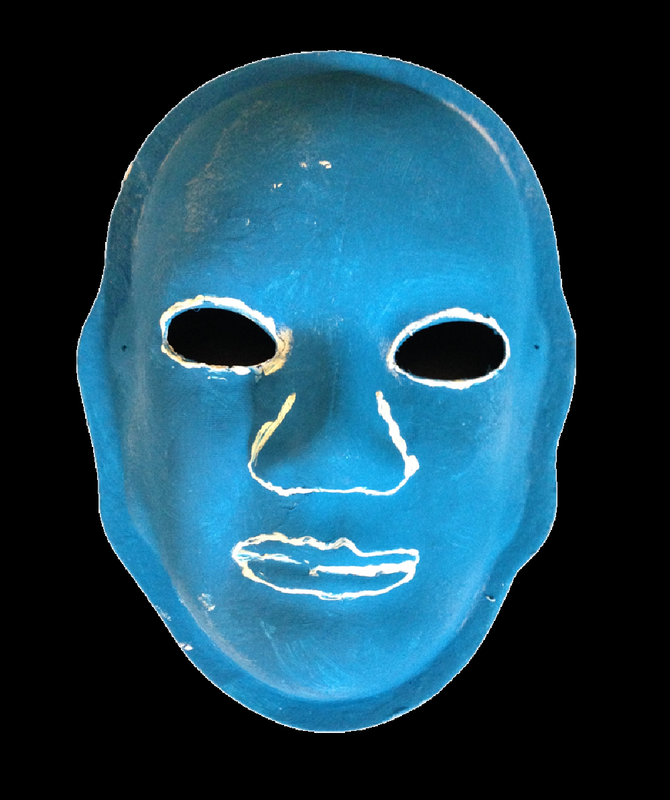 Explanation of mask: I like the color blue. It is my favorite color. 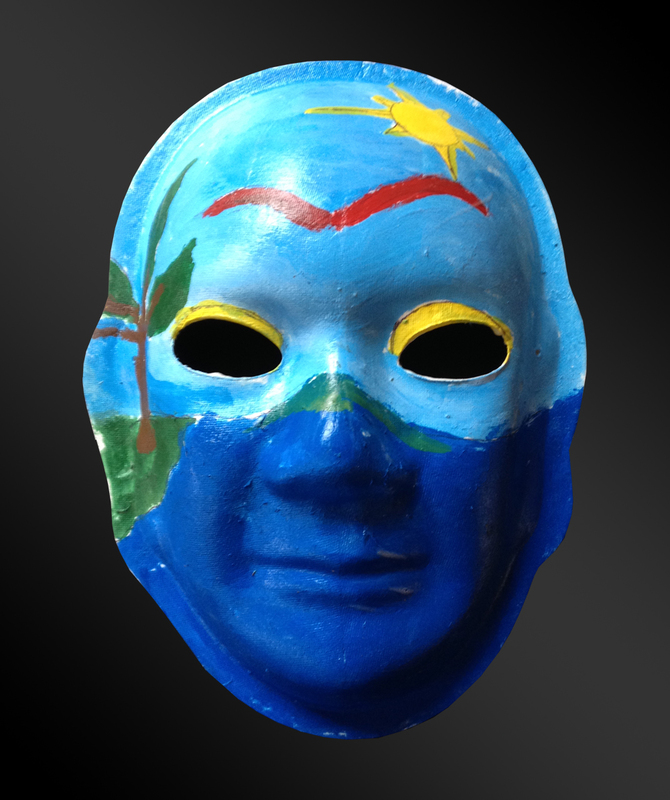 It represents the sky—like outside! I drew red cookies in the middle. They are red to look like Christmas cookies that I lay out for Santa. 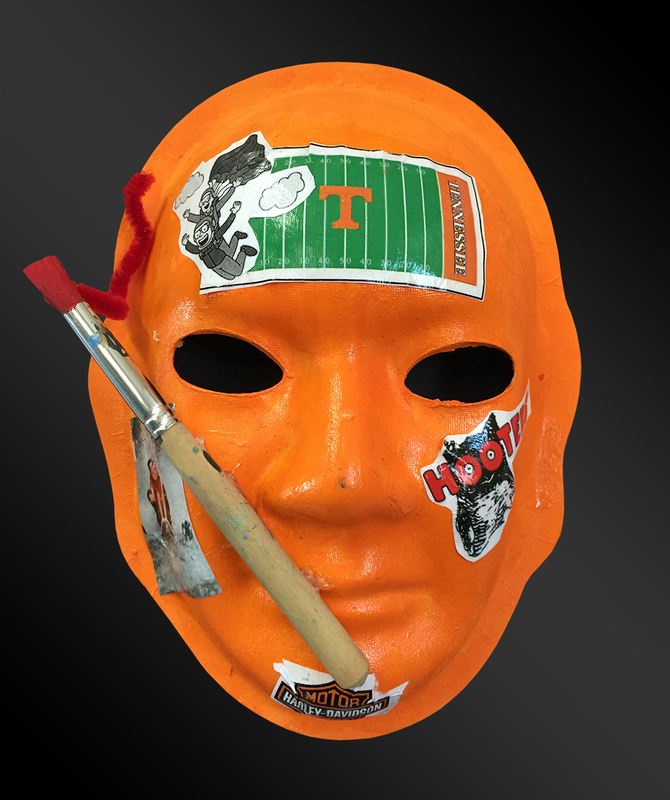 The orange is the color of the jack o lantern for Halloween. I love going trick or treating, getting candy and dressing up. 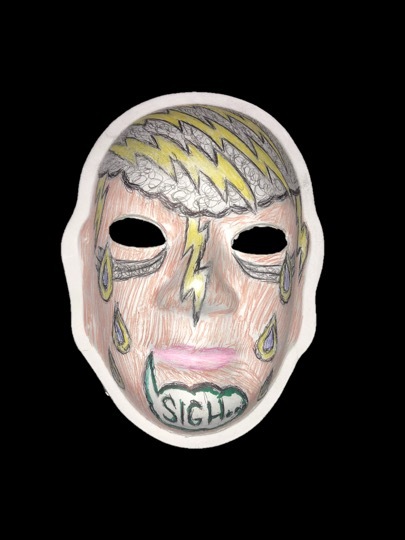 My mask looks beautiful. I love working at my job at Kmart and I love going bowling with Hinds’ Feet Farm to Sky Lanes. I also love when we have open gym because I love to play basketball. Basketball is my favorite sport. Like Michael Jordan who is the best basketball player. I am amazing! I feel like my life is wonderful. I like being Jalen! 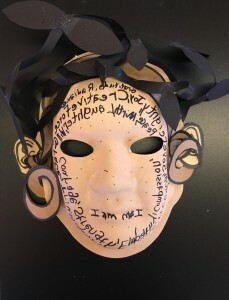 Explanation of mask: My mask looks like me. I am happy. I smile a lot. My face hurts from smiling all the time. I love my son. He’s handsome and he has awesome curly, dark brown hair. I like to play brain games because they are fun and make me think hard. I like to eat good food. Brain Injury: At 21 months old I was in a near drowning and deprived of oxygen for an unknown length of time. Explanation of mask: I adore symbolism and used colors to symbolize my feelings and experiences. I put yellow to represent that I’m dependent and I am not sure I will ever not be dependent. The yellow is over my eyes because my dependency is staring me in the face. I’m trying to be positive but also realistic. I put red because I do have excessive emotions. My emotions go everywhere. They are very dramatic and there are lots of them. They feel extremely strong. Orange because I do have lots of good relationships and lots of confidence but I also lack self-discipline and motivation. I’m unable to do anything without another person there encouraging me. I am not able to think good thoughts on my own. I need other people to be positive for me and push good thoughts into my head. My emotions are very difficult to control which has the biggest impact on me. My family and animals are important to me because they love me and are willing to help me out in any way necessary. Some things I like about myself are that I am good with words—they are a major, major strength of mine. I am able to express myself well verbally. Many people might think I am selfish because I ask for so much but I am really very generous. I only ask for so much because I am not able to go out and get it for myself. Explanation of mask: I love basketball, I played forward on my high school team. 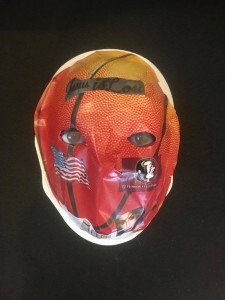 A scout from Florida State watched me play and got my name and said he wanted to draft me. Jesus is Lord and without him I would not be here. Jennifer Lopez is muy bonita! Explanation of mask: I am a brain cancer survivor, which is represented by the gray ribbon. 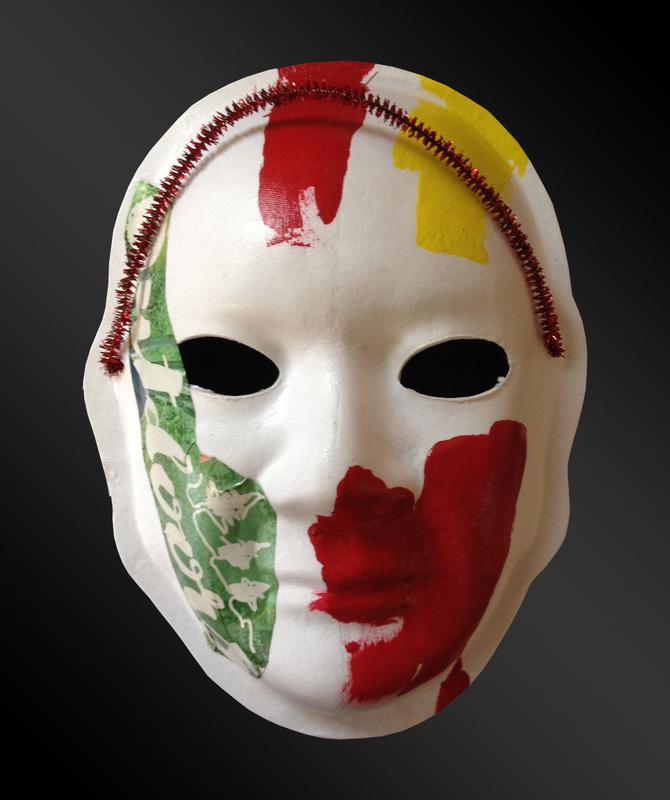 Red represents the color of injury and what I remember when waking up from surgeries. Blue is my favorite color and makes me think of peace. I wasn’t supposed to survive, this is almost always fatal. God blessed our family when I lived longer than expected. Explanation of mask: My mask represents how everyone else sees me versus how I see myself and what I am going through. The outside looks “normal” to most people I come in contact with. They can’t see the struggle that lies beneath the surface. This is represented by the glitter side of the mask. It is so easy to fake being okay with a simple smile. Most of the time, however, I deal with a lot of depression and anxiety due to my multiple concussions. On the inside it feels dark and lonely at times. 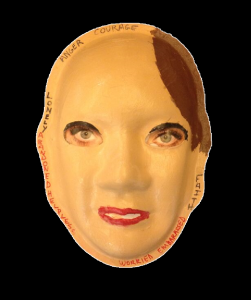 I spend some days fighting off my dizziness and migraines while trying to keep a brave face. My mask represents the literal “mask” that I wear everyday. 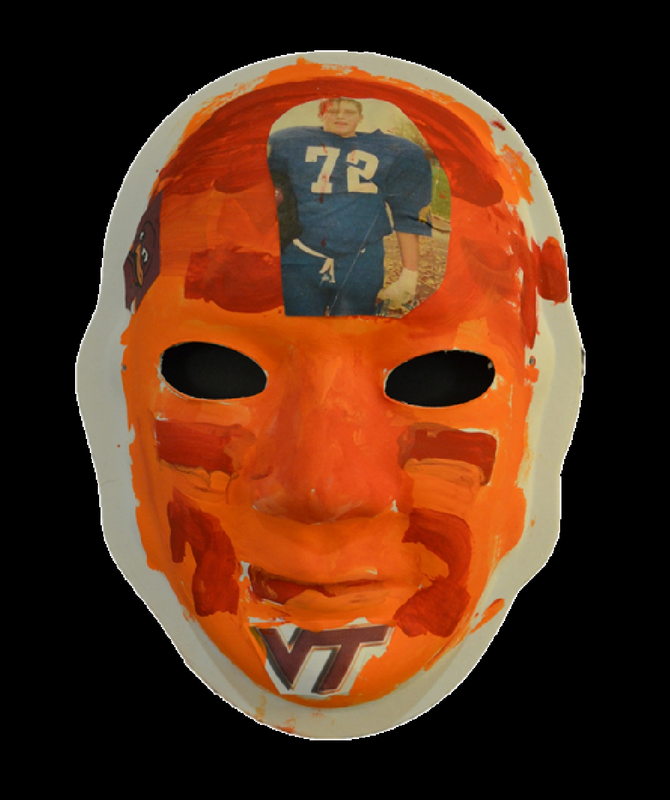 Traumatic brain injuries are the hidden injury because it is hard to see from the outside. The darkness that I feel inside is represented by the dark side of the mask. Sometimes I feel empty inside due to losing favorite sport of cheerleading. I look perfectly normal but on the inside I am constantly struggling. 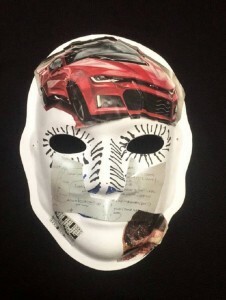 Explanation of mask: I want to drive and go back to work. I loved my job as a computer programmer. I’m working everyday to exercise my brain and make it stronger so that one day I will return to the career I love and miss. Brain Injury: Left frontal lobe and temporal lobe. I was in a car accident. 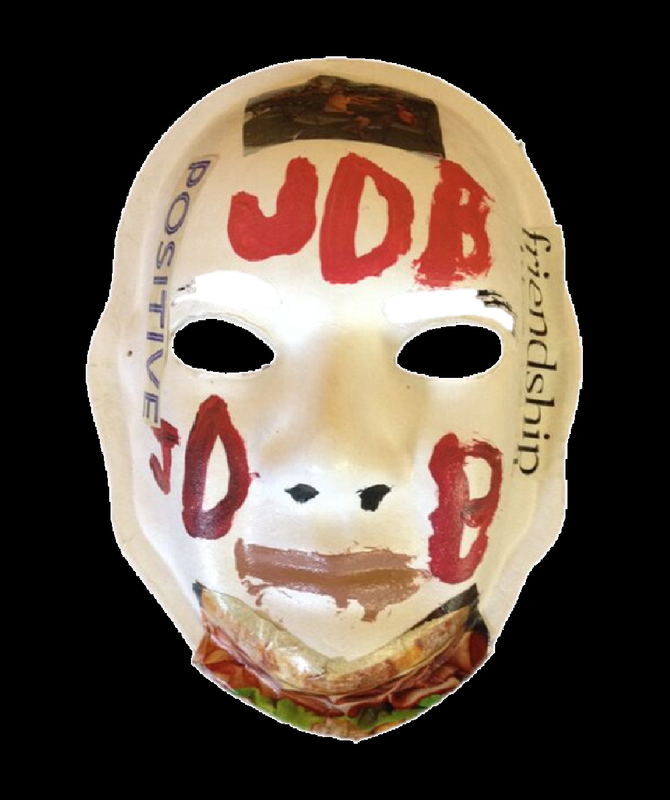 Explanation of mask: My mask is revealing my optimistic attitude and my hopefulness of life in general. My husband and I have two daughters and we are trying to raise them to be honest workers. I love cooking just about anything, butterflies, cats, the color purple, soccer, shrimp, being at the beach, listening to the ocean, flowers, and volunteering when I can. I feel like I can never use enough love! Explanation of mask: Before and after. Sadness followed by positive recovery. 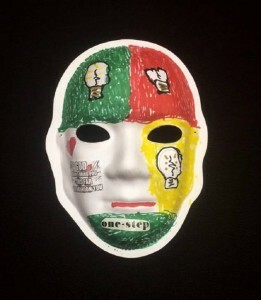 Explanation of mask: Green light bulb: I was on. Always Working. Red light bulb: Had a stroke, brain was shut down and was broken. Yellow light bulb: Re-learning everything = walk, talk, everything, one step at a time with the love of my caregiver and God who will never abandon me. 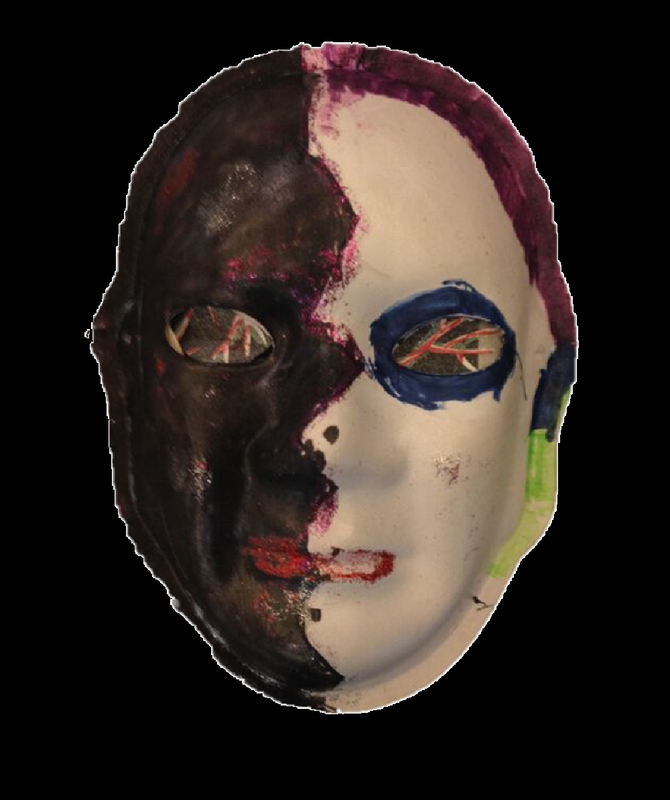 Explanation of mask: My life was very colorful prior to my TBI (left side). The blank part of the mask represents the void in my life when in the hospital and during rehabilitation. 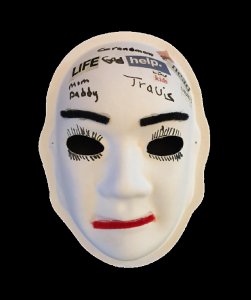 The right side of the mask indicates I’m still not fully living my life. I’m still improving after 30 years and am slowly living more and adding color to my life. 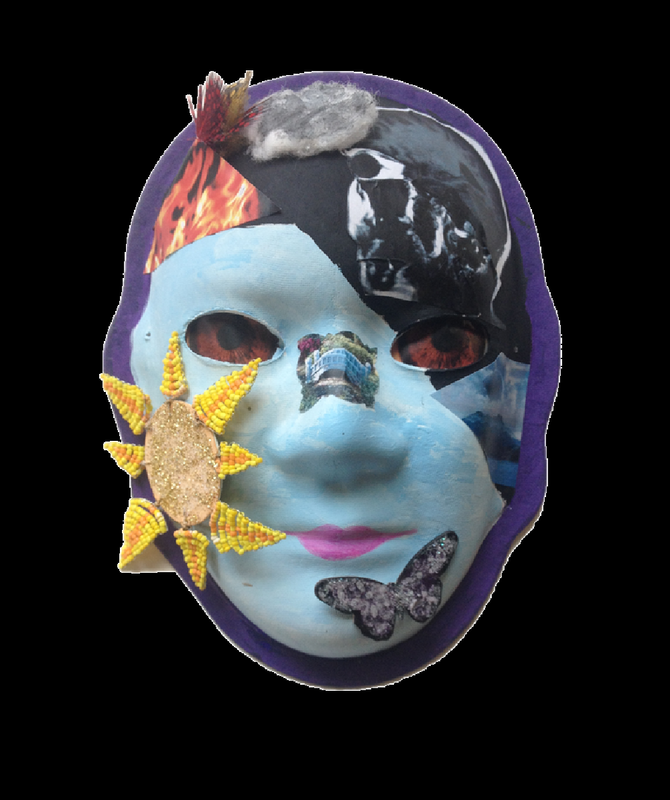 Explanation of mask: I feel as if from the turmoil of this stroke, my hands reach up with my heart towards the mountains and the light of God. 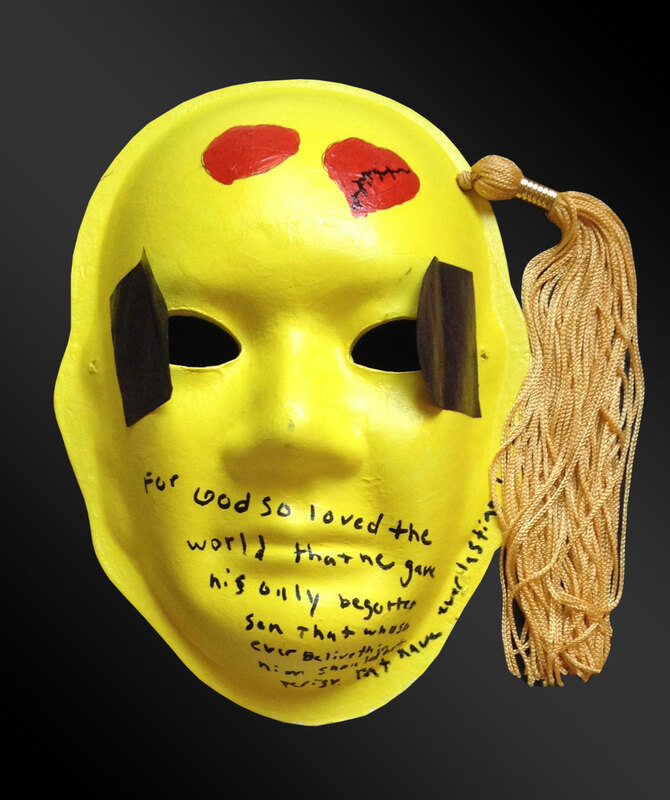 Explanation of mask: Look what God has done! It is all about God! Explanation of mask: Red Mask. Hunting and fishing. 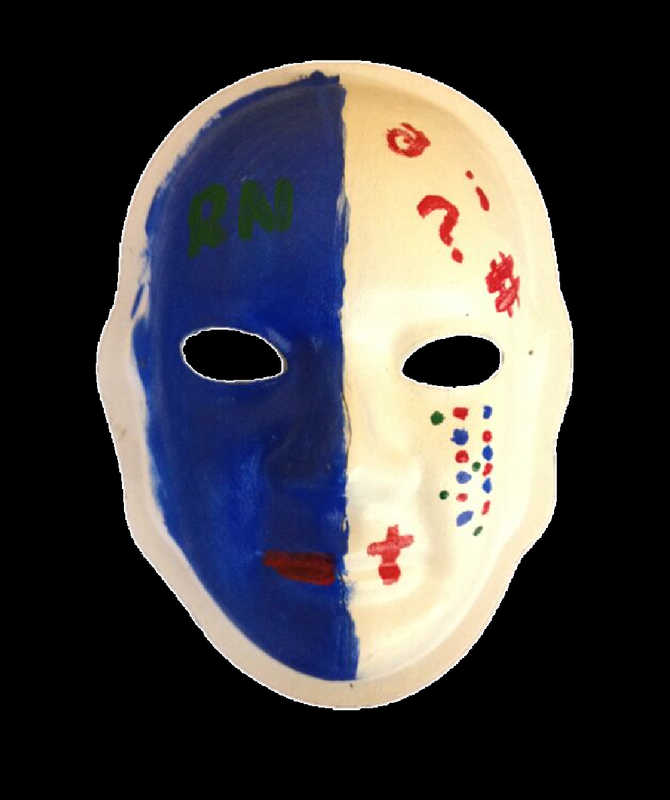 Explanation of mask: This represents the crisscross of the left and right half of the brain. What is missing is on the left, what doesn’t work is on the right. Brain Injury: I had a massive stroke at 14. I have no right brain. I’ve had countless surgeries and I rely on my left brain only. 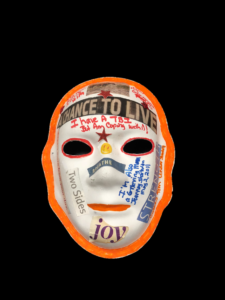 Explanation of mask: YOLO stands for “you only live once.” I included this on my mask because that’s my life motto, so that I can remember to make the best of everyday. Everyday is not promised and yesterday has already passed. TCOB: “Take care of business” reminds me that “business is business” and “friendship is friendship” and you don’t combine the two. 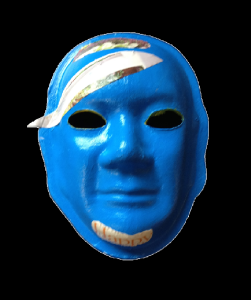 Explanation of mask: My mask is blue because I love the color blue. I put the taco by my mouth because I love eating tacos, but I wish I could learn how to make them. My favorite drink is Mountain Dew. 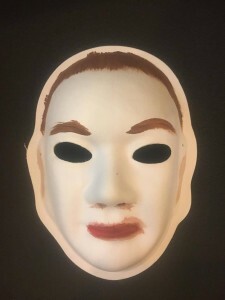 I put the shoes on my mask because I don’t know how to tie my shoes yet, but I am proud that I am able to work stocking shoes for Kmart. The guitar is there because I enjoy country music and the music of Bruno Mars and Drake. I am a good musician too. The basketball player is there because I love playing basketball. I also love bowling and jumping on my trampoline. Explanation of mask: I feel really sad about my brain injury. I like to work and I am not able to work as much as I would like to. I have two children and grandchildren, but I don’t get to see them as often as I want to. I have seizures now and I am no longer able to live in my own home. I am sad, I want to think good. Brain Injury: I came home from work, and I fell. I can’t remember what happened after that. I possibly had a stroke. 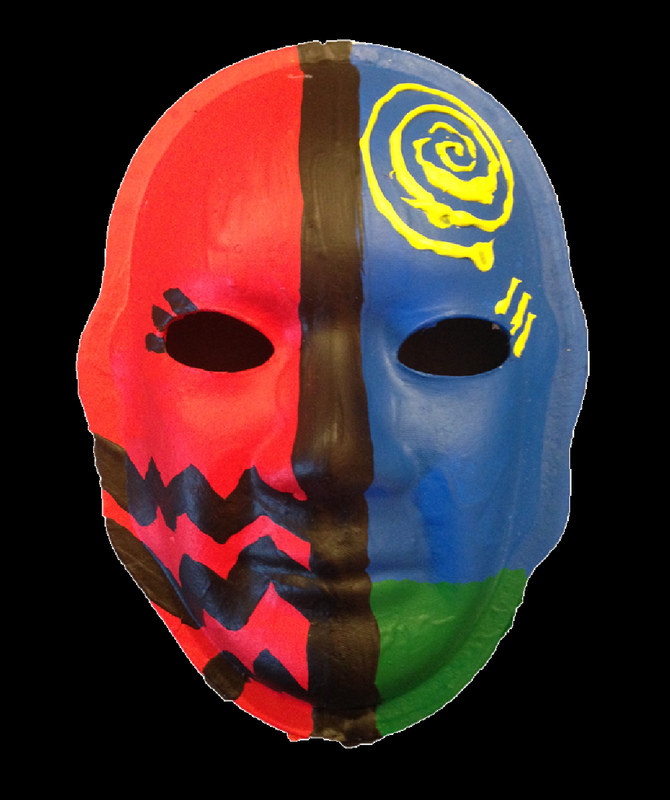 Explanation of mask: One side represents where I was, and the other side represents where I am at now. I am peaceful, relaxed, grateful, and hopeful. I am partially blind since the accident. The left side represents how I used to be before I came to this program. 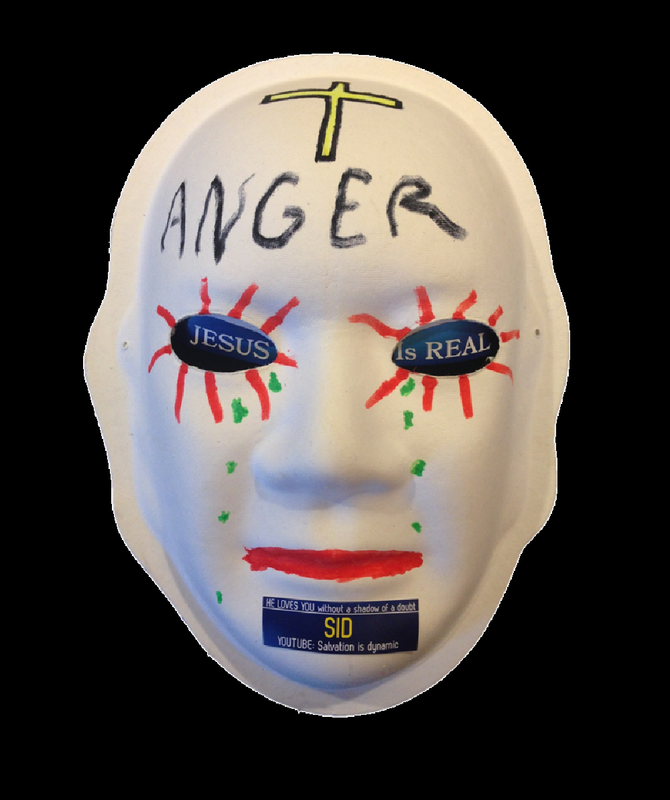 I was mad, agitated, frustrated, fearful, and lonely. I have a good time at the clubhouse. I’ve came every day, four days a week, for the past five years. Brain Injury: Suffered in an automobile accident in Baltimore. The car went down an icy road in Baltimore where I was working. I suffered physical disabilities and short memory problems. Explanation of mask: The mask depicts the physical and mental frustration I have. I suffer from memory problems, altered mental capabilities, anger, frustration, inability to perform tasks as quickly and efficiently as I once could, loss of patience and unable to properly handle frustrations, despite my efforts. I still, sometimes, find a way to explode. I’m trying to foresee the problems before they explode. I’m basically keeping my fingers crossed, hoping I can handle my problems before frustration causes them to explode! Gateway has helped me, thankfully! 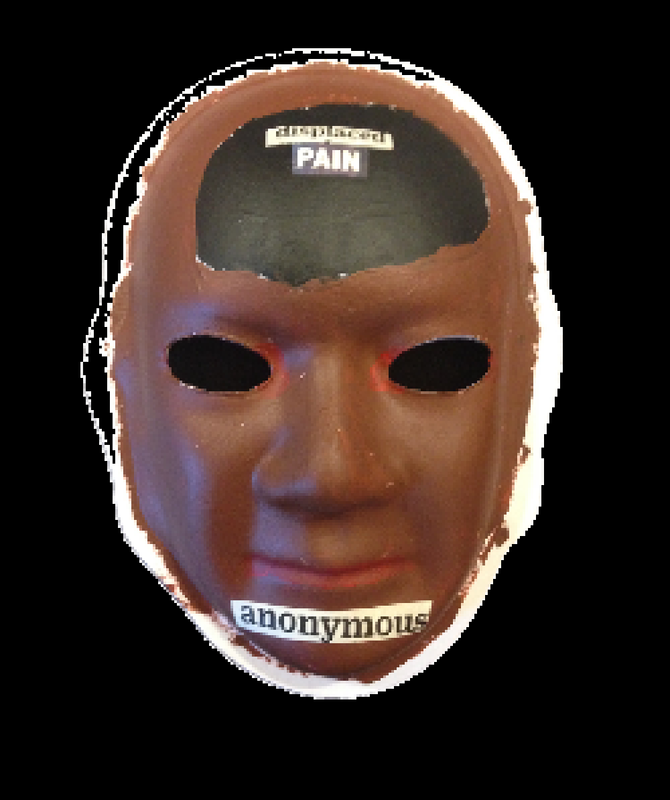 Brain Injury: I experienced a brainstem stroke at the age of 36. 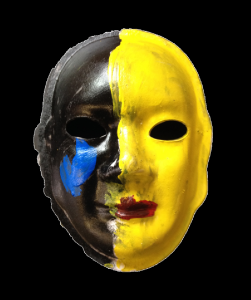 Explanation of mask: My mask is gray and yellow. 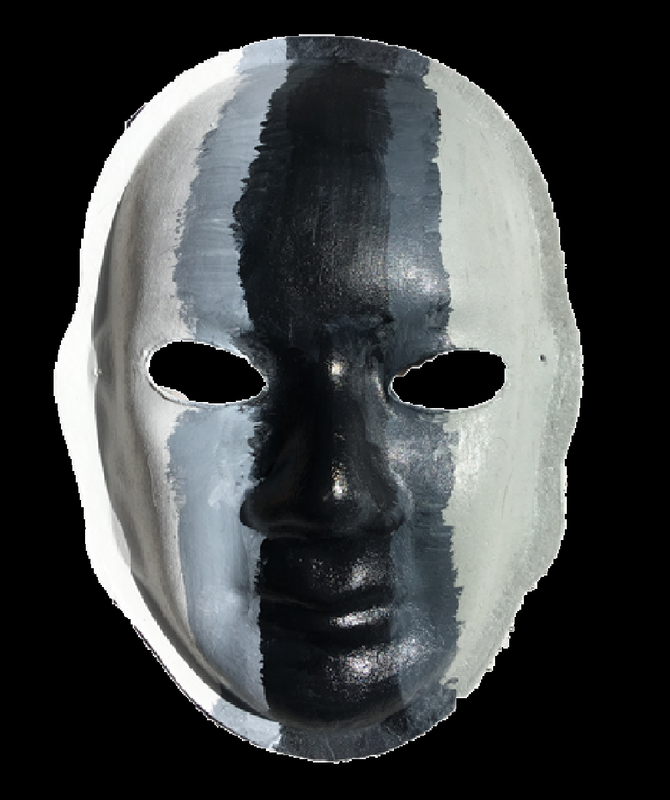 They gray side depicts my feelings when I experienced my stroke. The red words with Xs through them show the things I lost. The yellow side depicts my positive outlook that I have 18 years after the stroke. The purple words are things I have retained or gained since my experience. Brain Injury: Stroke at the age of 46 that left my right side of my body paralyzed. Explanation of mask: I see things in black and white. 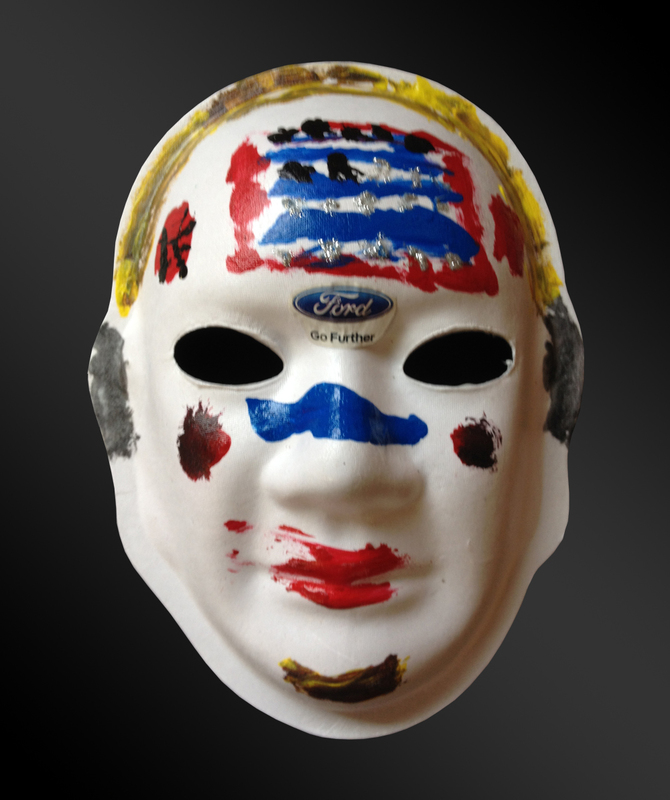 My mask is symbolic of how I’ve approached my stroke. 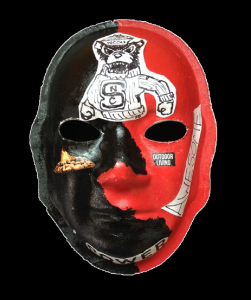 The black side represents all the bad things associated with my stroke. The white represents where I was before and will be again. Brain Injury: I was hit by a truck. Explanation of mask: I was intoxicated and staggering home when I was ran over by a truck. 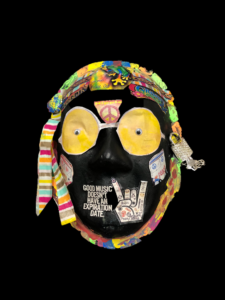 I love rock and roll, and I lived a hippy life. I get through life by smiling regardless of my disability and still try to joke to keep humor going. Life goes on! We have to adapt and overcome! Brain Injury: I had a stroke when I was 53. 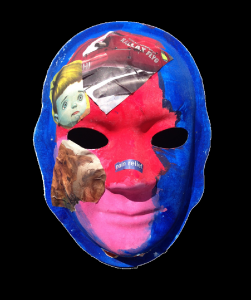 Explanation of mask: My Siberian husky dog woke me up and saved my life. I loved my dog. Her name was Cleopatra, and she was very loyal. She had ice blue eyes and a liver colored nose. After my stroke, the took my dog away. I like 4-legged dogs. Dogs can be lifesavers. Brain injury: I hit a tree with a car. 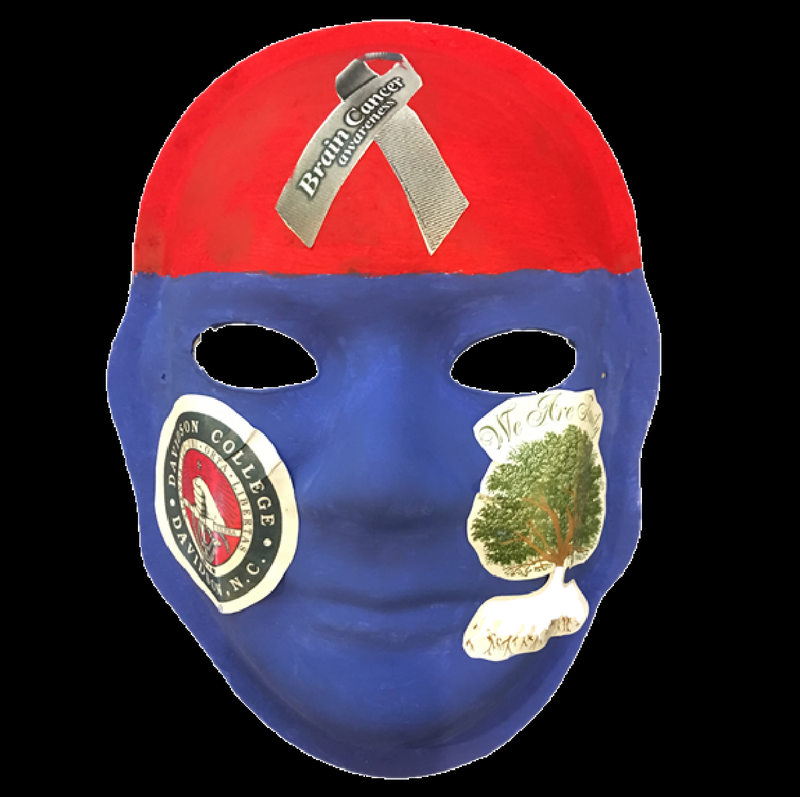 Explanation of mask: A tree on the right side of my mask shows that I hit a tree, and this side of my body has been affected by it. Brain injury: I was hit from behind by a truck while I was stopped on highway 70. 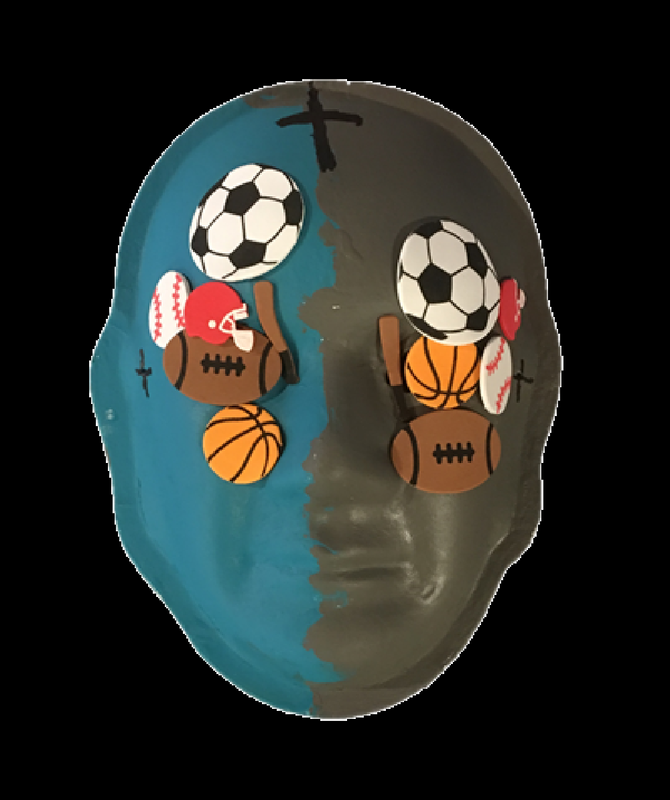 On October 13, 2015, I was diagnosed with a concussion, as my head was severely shaken by the impact. Now I have to get shots in the back of my head for headaches. Also, my left arm has permanent nerve damage. I also have memory issues. I am thankful to be alive. Explanation of mask: I want to be able to share my experience. This has been really hard emotionally, as my only child was killed on May 2, 2011. He died from a broken neck, so this all comes back to the forefront and that itself is enough to deal with. He was only 27. On the day of my wreck, I thought I was going to hit a car head on. I went to the hospital via ambulance and then on October 15 and 17th. I had to go UNC-ER due to extreme pain in my head. This all put a strain on my marriage. It was not my fault, and I just go to my happy place at the beach. Being there, I am not judged. I am also the caregiver to my mom and she resides in assisted living, so I have to continue to do that as well. I am her power of attorney, and I have to stay on top of her situation. This makes me have lots of extra stress, but I do the best I can. Brain injury: I have a head and neck injury. I was blown off a vehicle. Explanation of mask: The forehead is yellow because I’m happy to be alive. The red line represents that I am half-bred. Black means I faced the jaws of death and came out victorious. I am on the winning side all through the blood of Jesus. Explanation of mask: The red represents loss of speech. 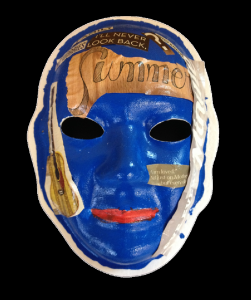 The blue represents regaining independence. Brain injury: I was hit by a drunk driver. Explanation of mask: When I was 19 years old, I was hit by a drunk driver. I was attending Guilford Tech in hopes of being a counselor or massage therapist. 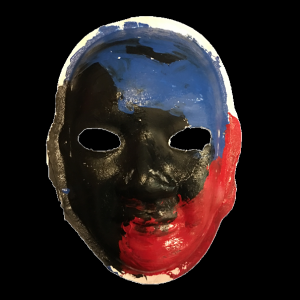 I live in a group home and we need more support. I will never give up hope. 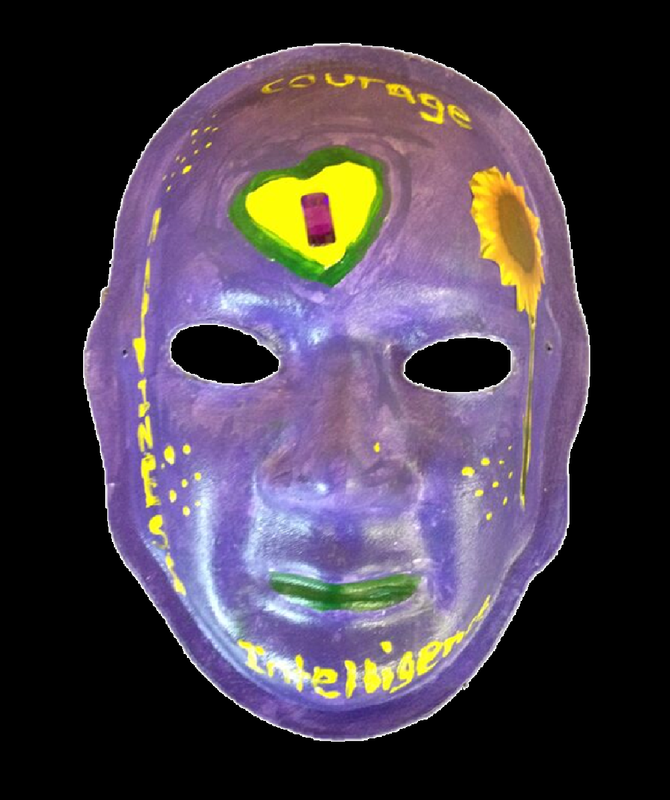 I would like for others who have a brain injury to get the services they need. The tears represent the struggles after my accident, but I am a fighter and a volunteer, so I’m always looking for that hope. Brain injury: I had a stroke on my right side of my brain, affecting the left side of my body. Explanation of mask: I woke up on a Sunday morning. It was snowing outside. I couldn’t sit up in bed, and I kept falling over on my left side. I have slurred speech. I was rushed to the ER too late to get medicine to stop the stroke. I was told that it was a miracle that I survived. I have a blood clot in the brain, and there is nothing that can be done except to keep taking my meds. I keep having transient ischemic attacks, and it makes me angry. The blue side with the pom-poms represent the snowy morning. 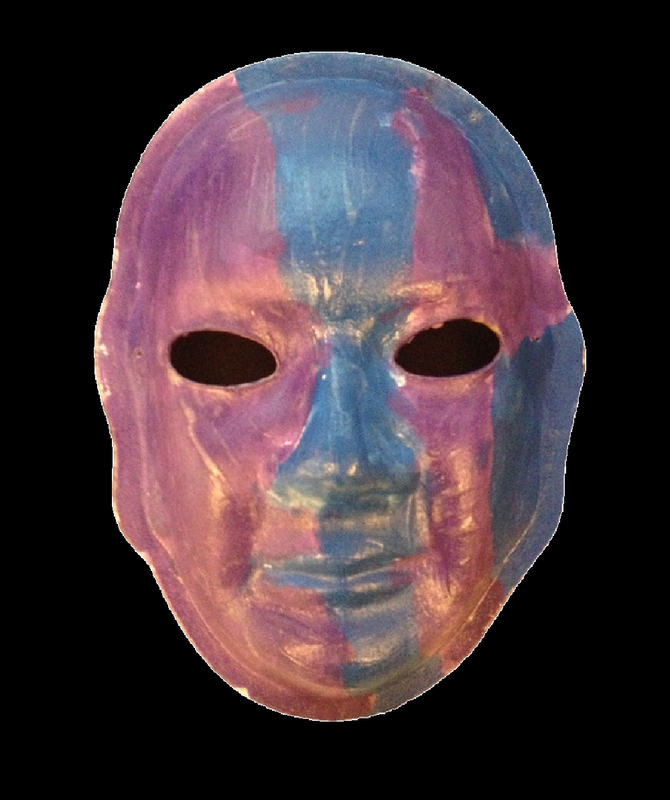 The purple side represents my feelings and my favorite color. 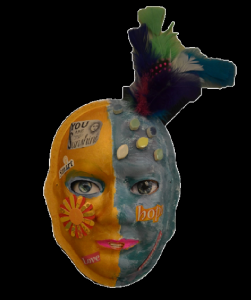 The yellow feathers represent my hair. Brain injury: I was in an automobile, and I ran through a fence. I was intoxicated, and as a result, I have a brain injury. I am blind in one eye. Explanation of mask: I love music and am active in First Baptist church. I sing in the choir. My masks symbolizes the song “red, yellow, black and white. They are precious in his sight. Jesus loves everyone.” After my accident, I’ve never drank alcohol again. 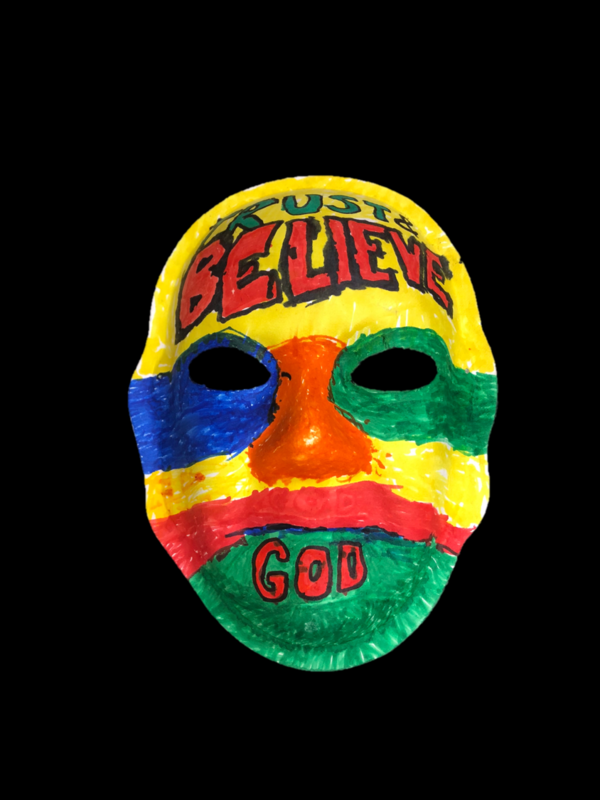 Explanation of mask: Believe in God because He is real. I died and met him. For more of the story, go to YouTube, and put “Salvation is Dynamic” in the search bar. Explanation of mask: I am like Jacob in the Bible. I was struggling with the Lord, and I was struggling with bad decisions that I made. Due to my accident, I lost all of my blood, and I ended up in a coma, paralyzed from the waist down. My long-term memory is good, and my short-term memory is not bad. 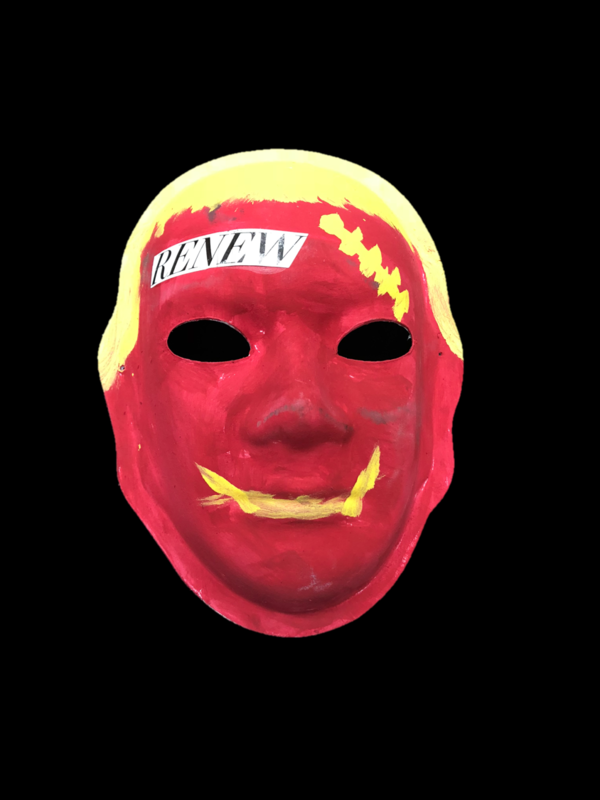 I have repented my sins, and I am a much better man. God still blesses me today. Like Jacob, I struggled with the Lord, and now I live with the consequences due to my actions. I believe God will give me the strength to do what I want to do and be the person I want to me. 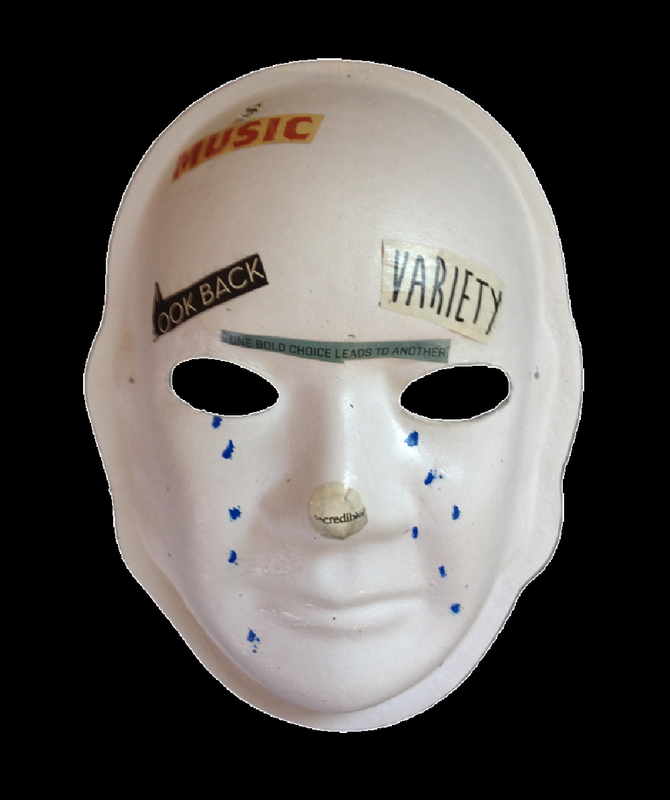 Explanation of mask: I was four years old when I jumped off my grandpa’s tractor. I got ran over. I live in a group home, and every day I am challenged with doing things. I have a girlfriend who I have been with for 8 years. She lives two hours away, so the staff takes me once a month to see her. I met her at White Lake when I was on vacation. This life is not easy, but I make the best of it.